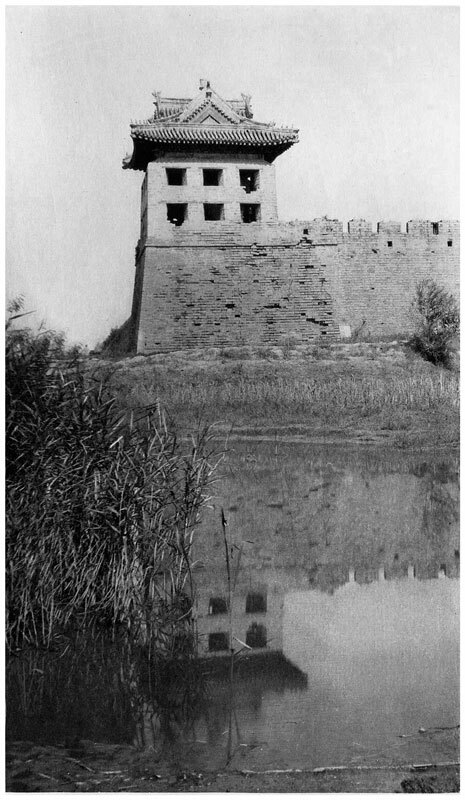 The outer tower seen from across the moat outside the city. 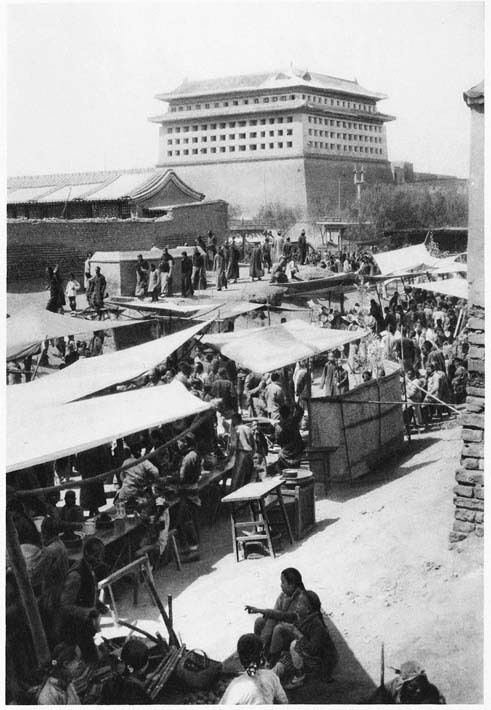 A portion of the restored wall of the outer fortifications, or ‘barbican’, with people apparently serving street food in the foreground. 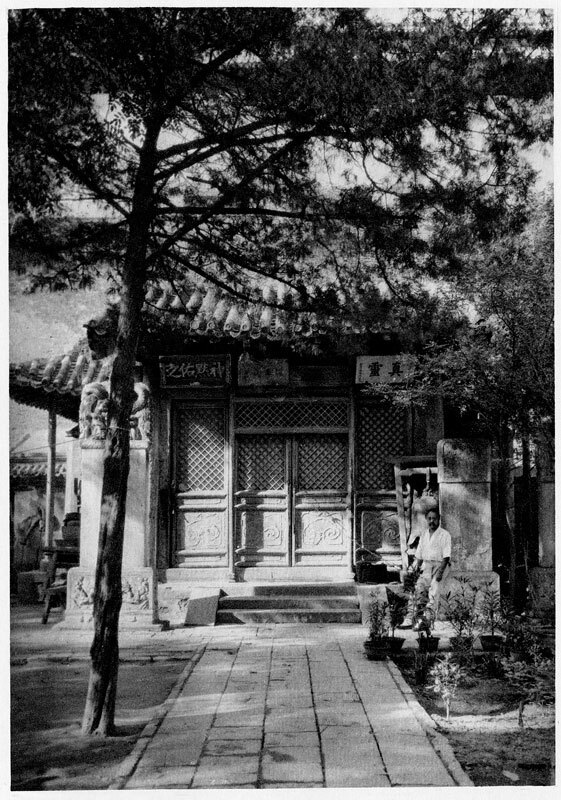 In the gateyard of the Taoist temple. 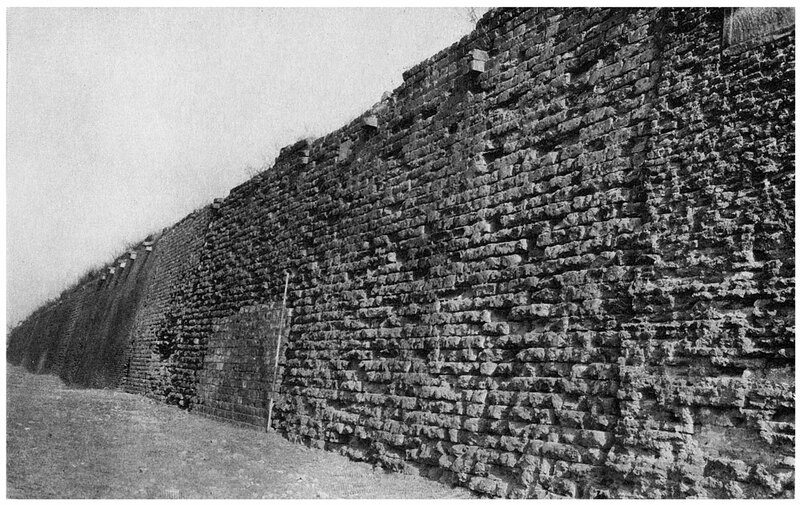 The outer tower and the remains of the former outer fortifications (the ’barbican’). 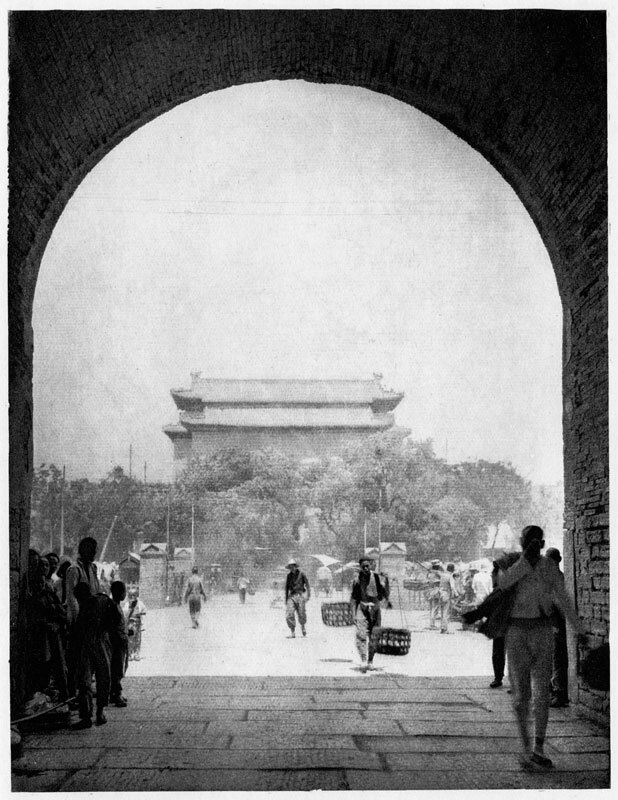 View through the inner gate of the outer gate beyond. 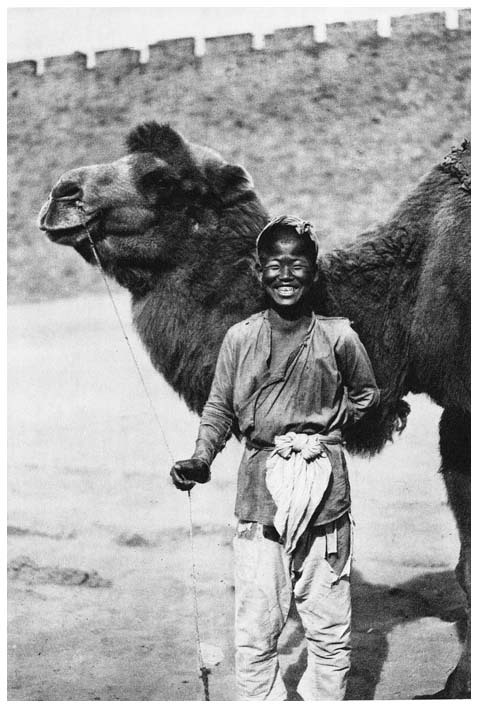 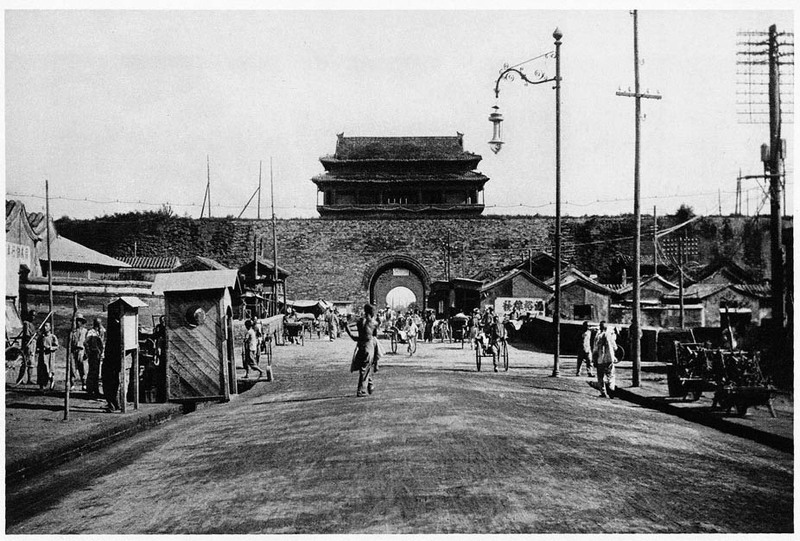 By the time this photo was taken in 1922, the gateyard between the two was no longer enclosed. 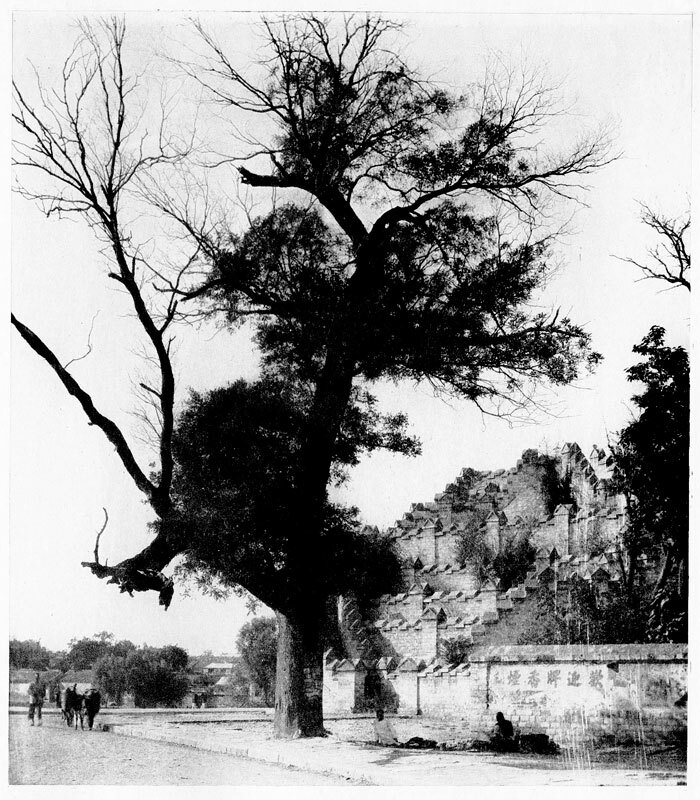 An ancient Ailanthus (locust) tree in the former gateyard. 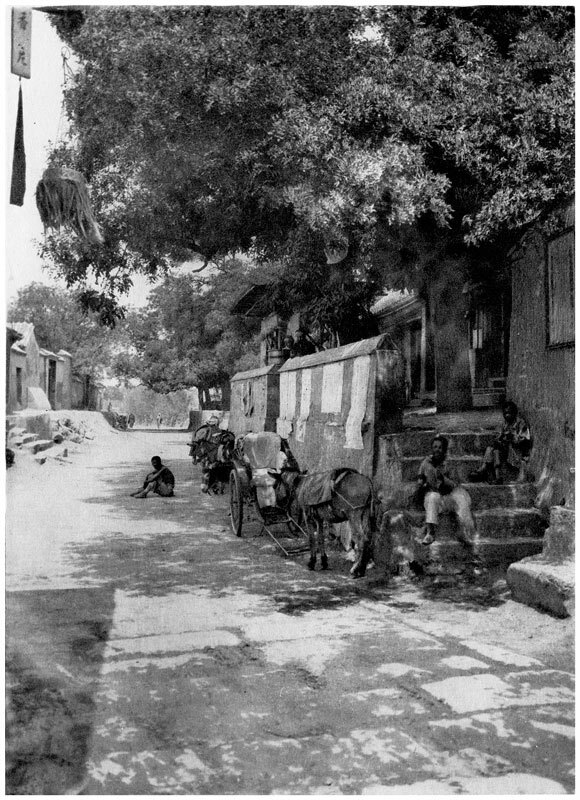 The gateyard with its itinerant barbers. 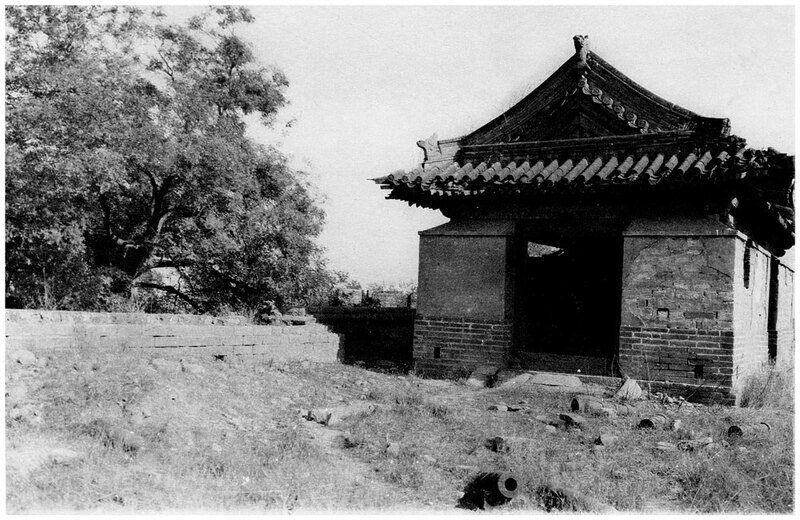 The Taoist temple in the gateyard between the inner gate and the outer gate. 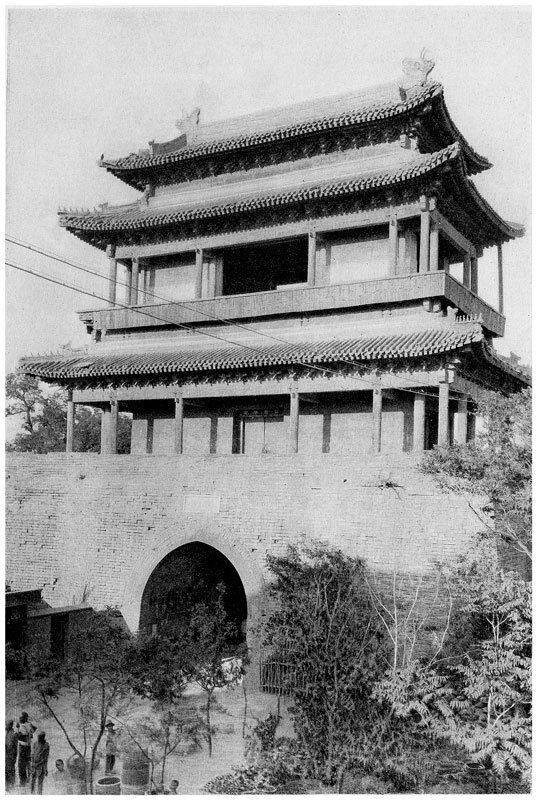 Side view of the outer tower. 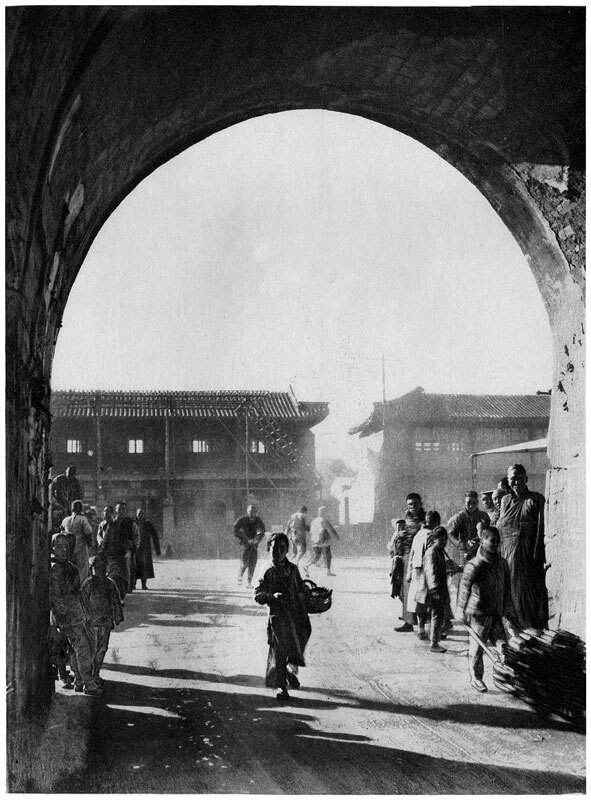 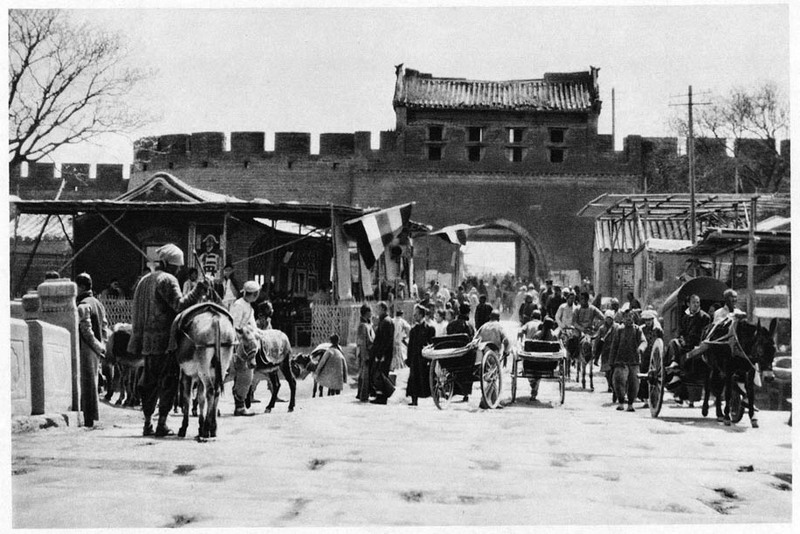 Funeral procession on the old road outside Dongbian Men. 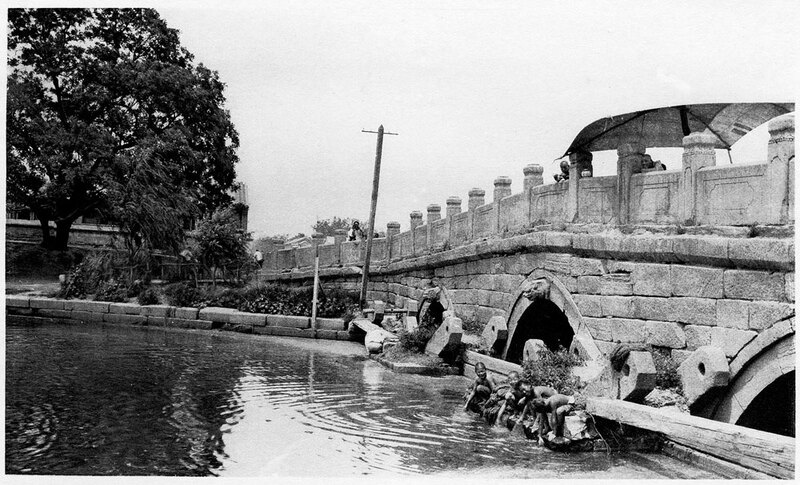 Bridge with water locks near Dongbian Men. 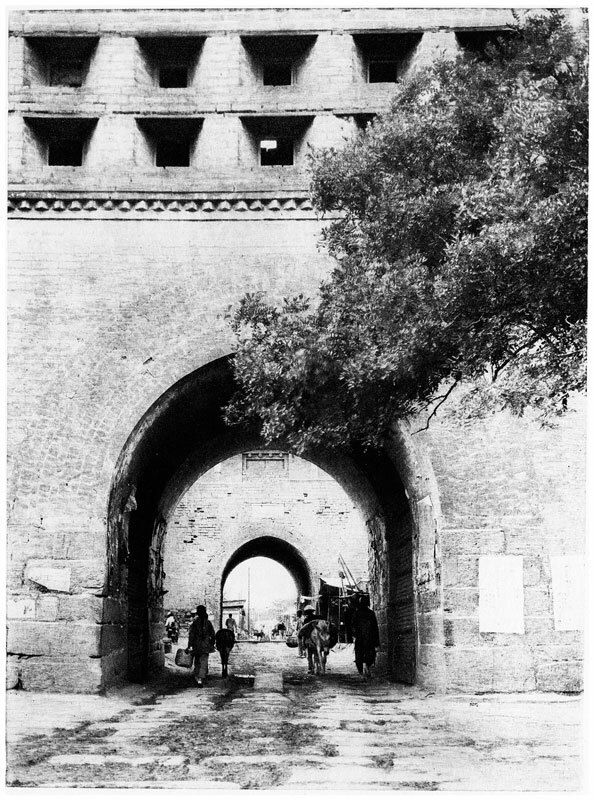 The city wall at Dongbian Men. 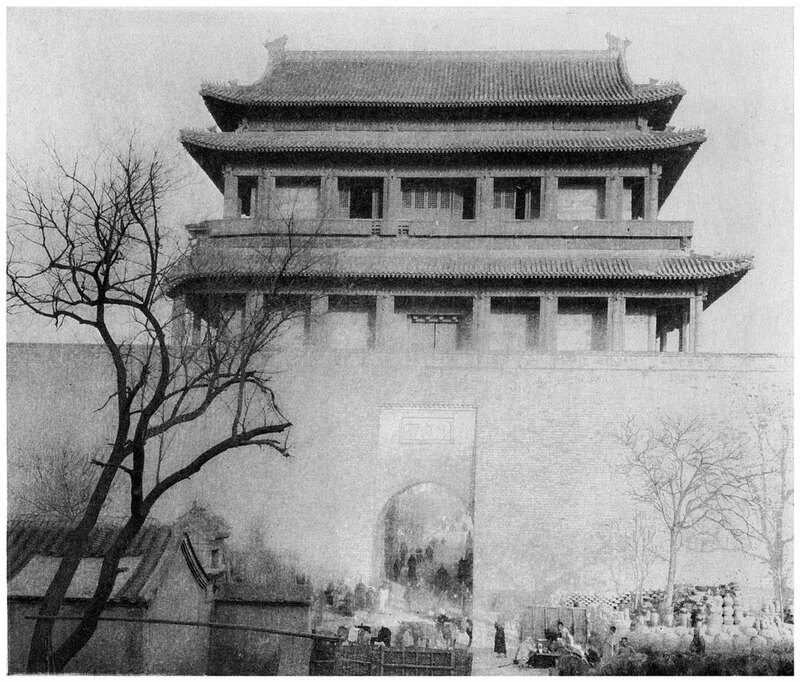 View of the inner tower, with the outer gate glimpsed in the background. 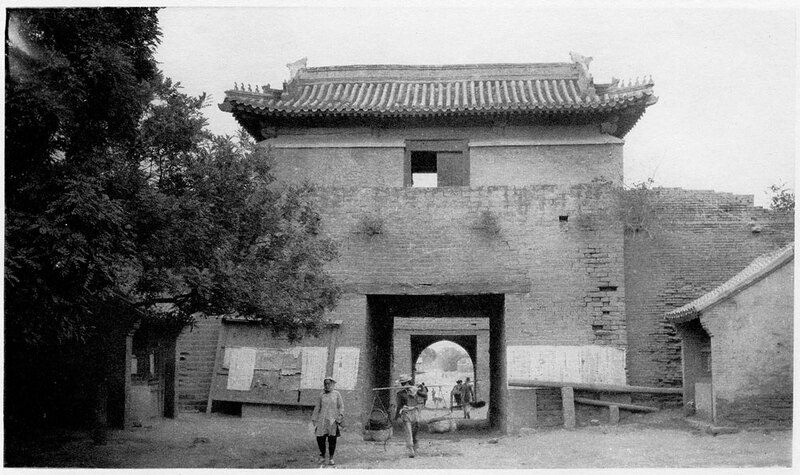 The outer gate, with the inner gate glimpsed inside. 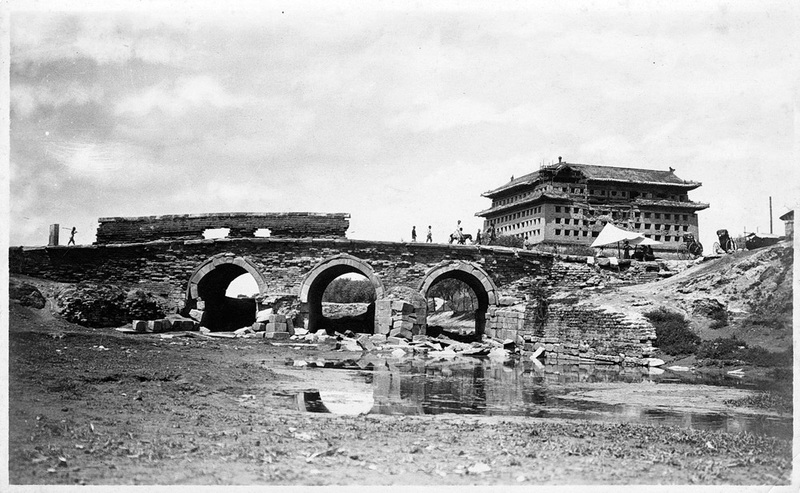 The bridge outside Dongbian Men. 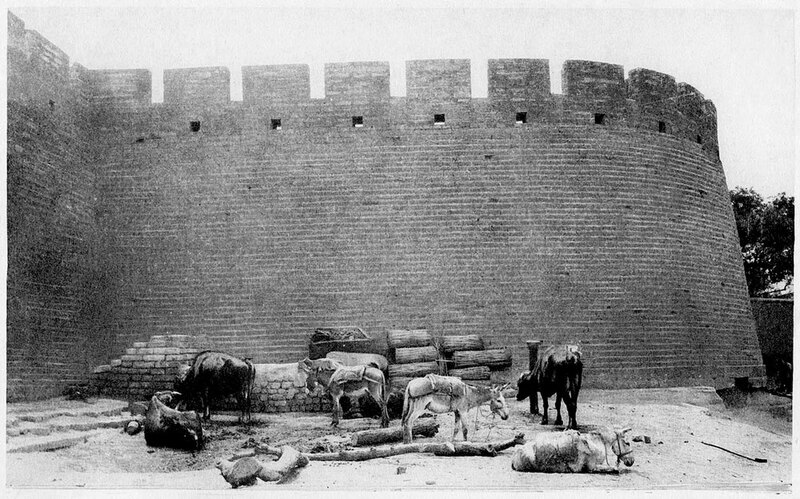 Resting donkeys and oxen outside Dongbian Men. 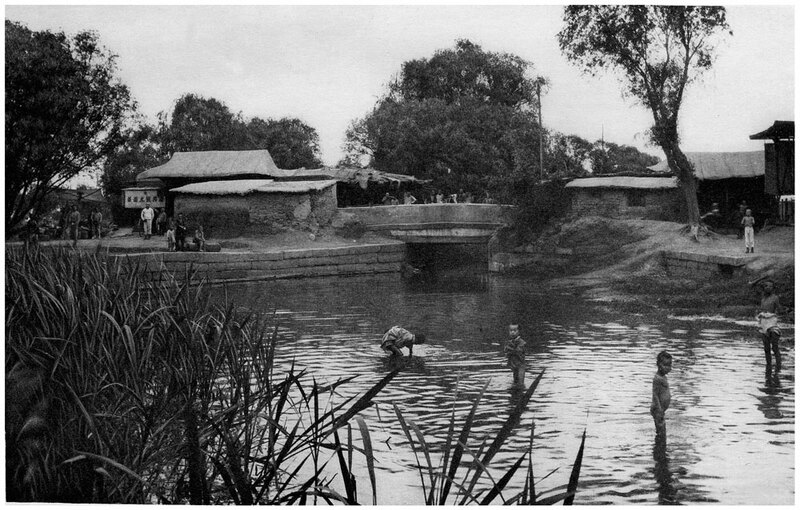 The end of the Dong Ho Canal outside the Dongbian Men. 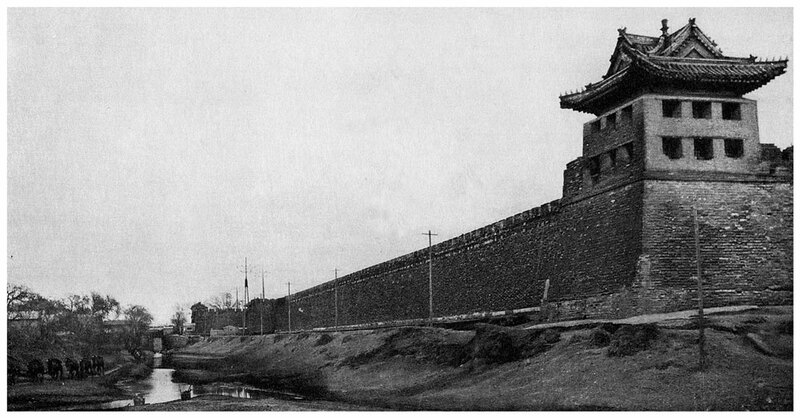 The east wall at Dongzhi Men. 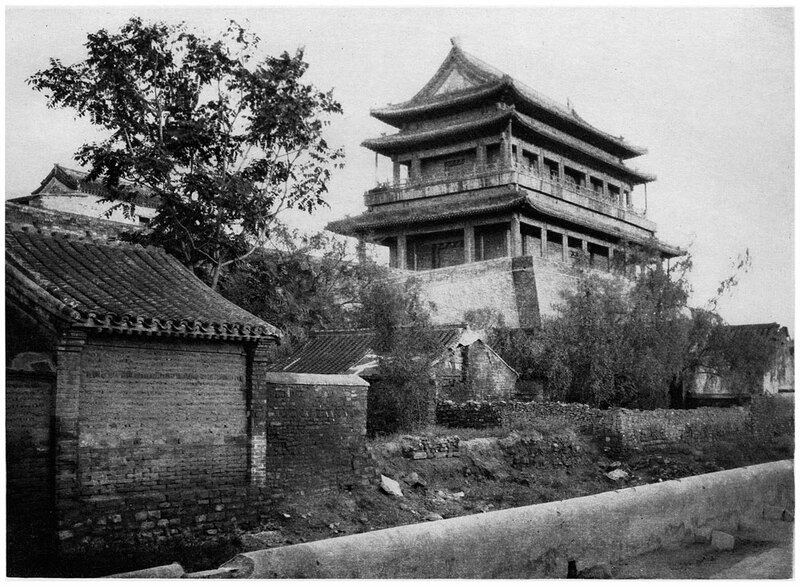 View of Dongzhi Men from the south, with the inner tower on the left and the outer tower on the right. 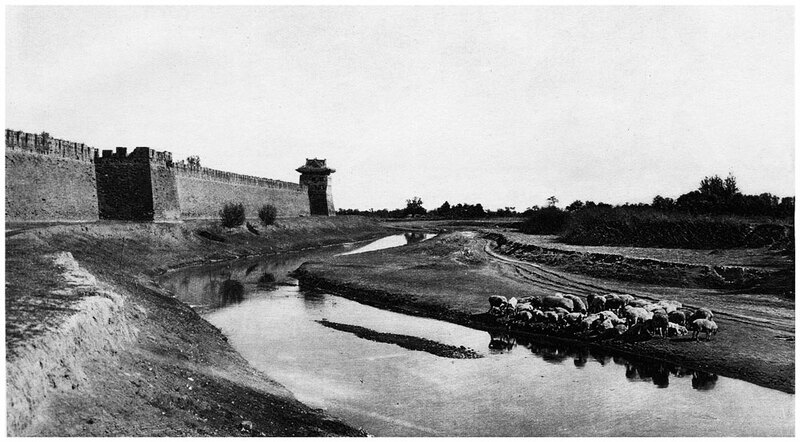 The moat is in the foreground. 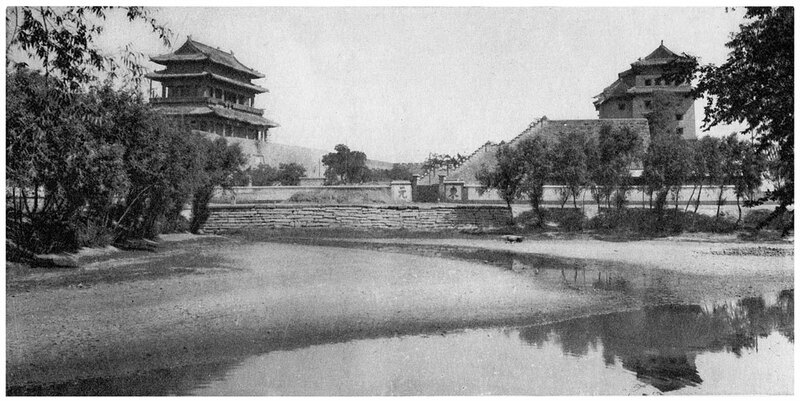 View of the moat outside Dongzhi Men. 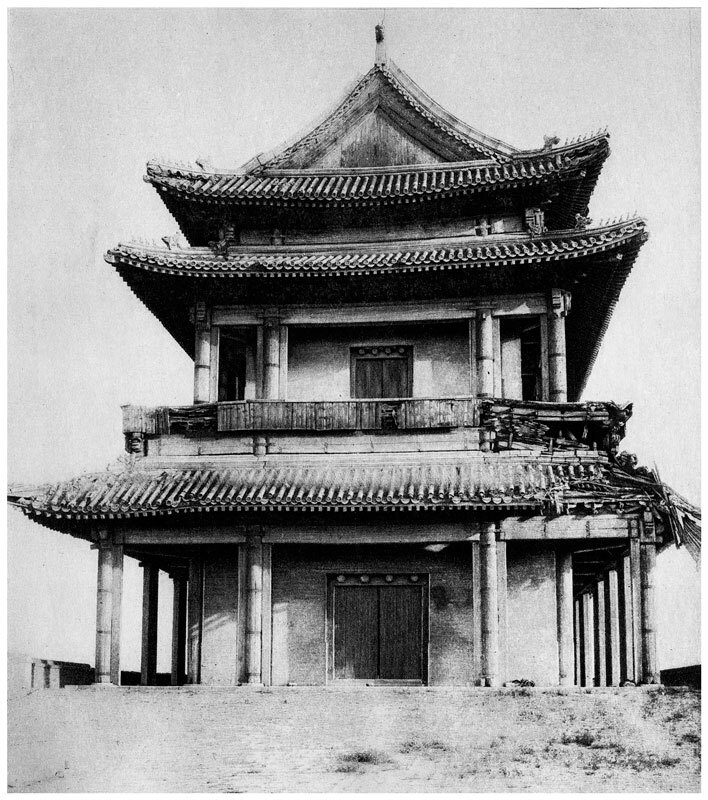 Front view of the inner tower. 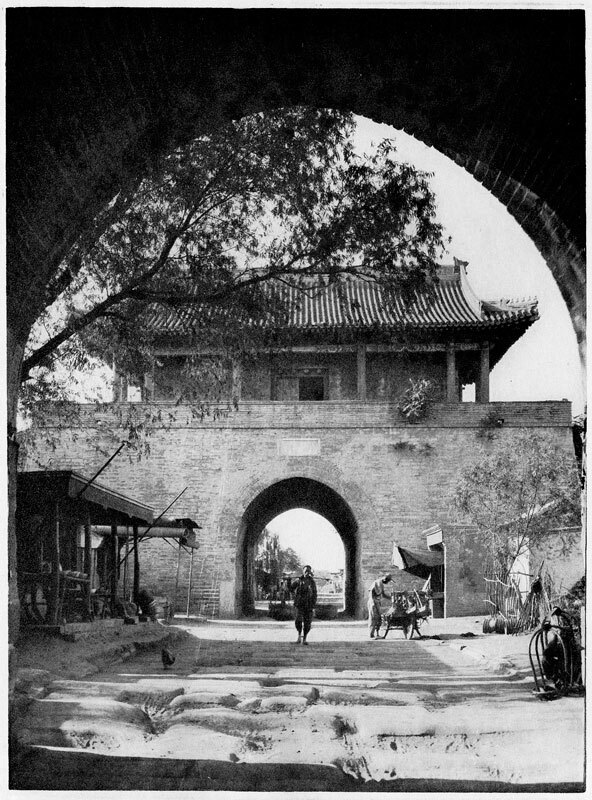 View through the inner gate into the city. 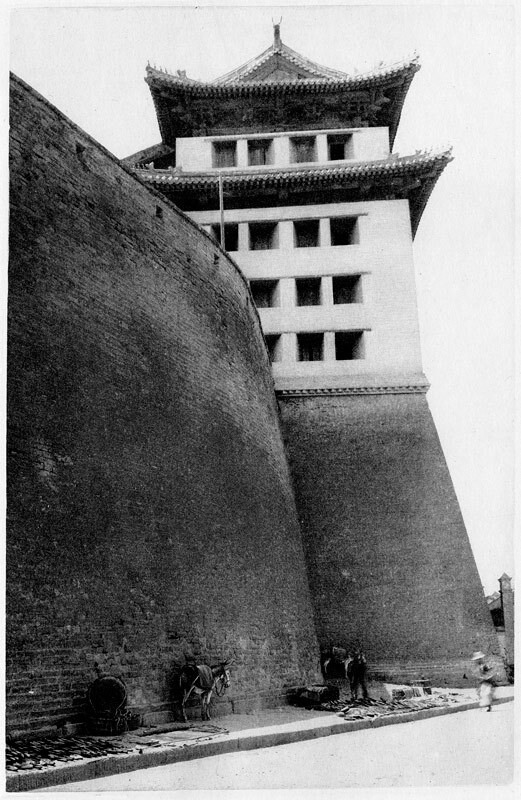 Side view of the inner tower and the ramp leading up to it. 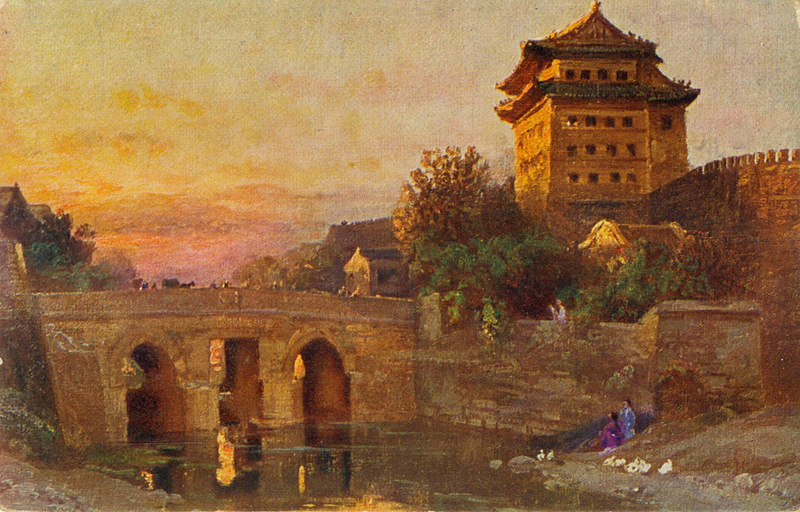 The outer tower and the moat beyond the city. 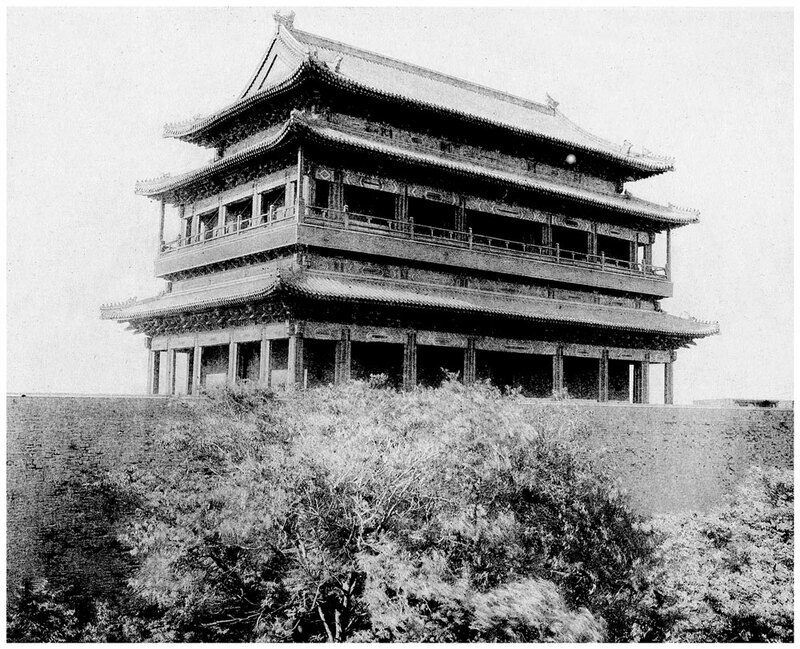 The outer tower and the modern terraces surrounding the temple. 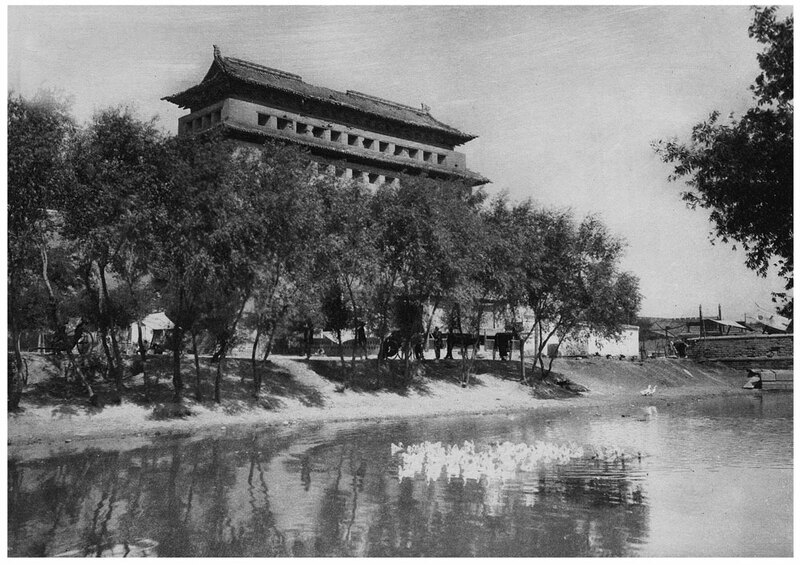 The moat outside the outer gate, with its white ducks. 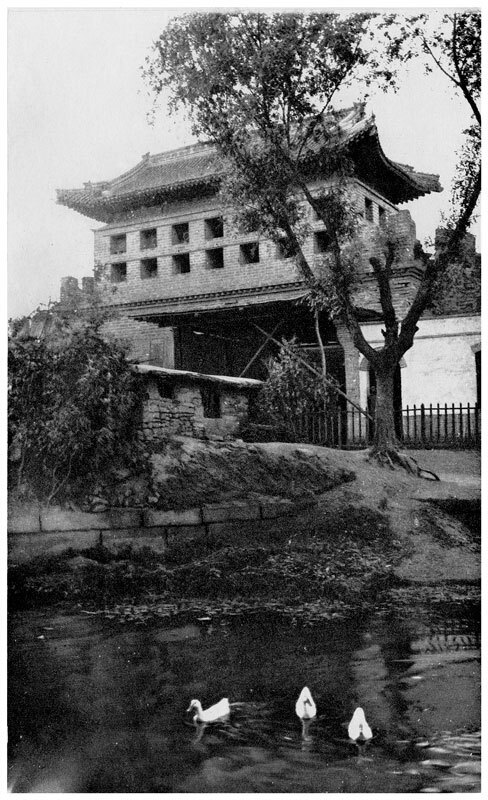 The inner tower from the street. 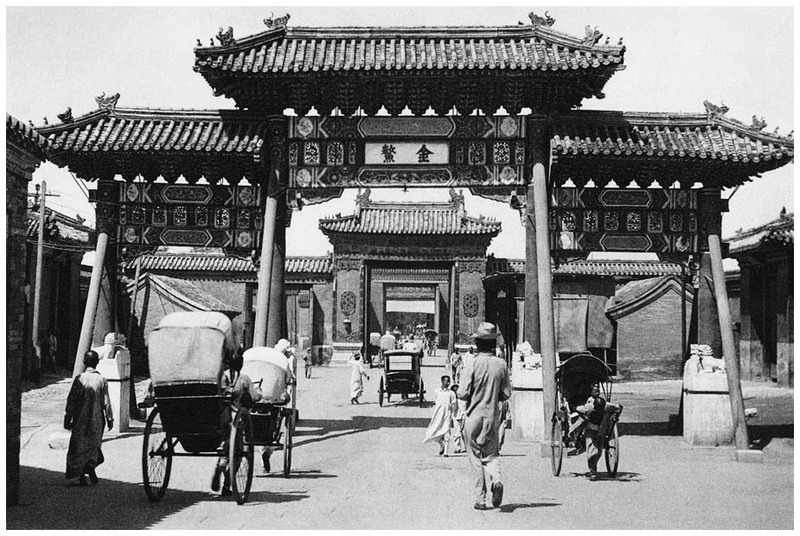 Through it, in the distance, one may see the outer gate on the far side of the intervening gateyard. 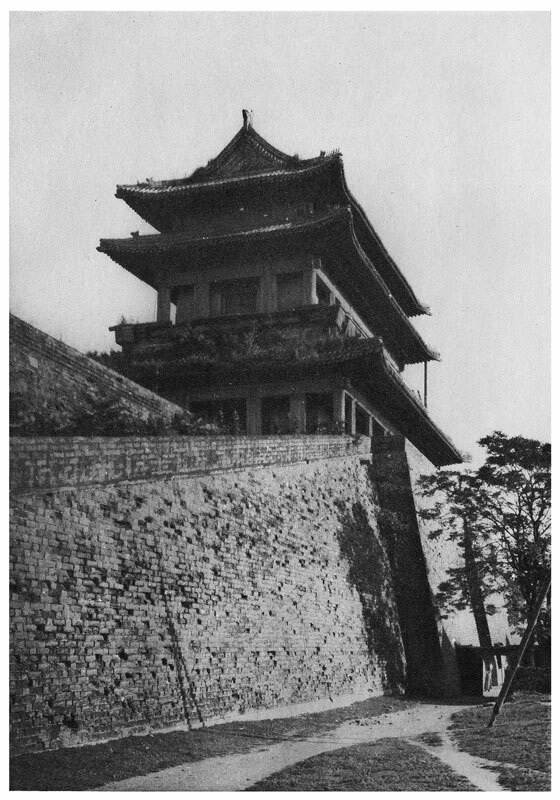 Side view of the inner tower and of the ramp leading up to it from the gateyard. 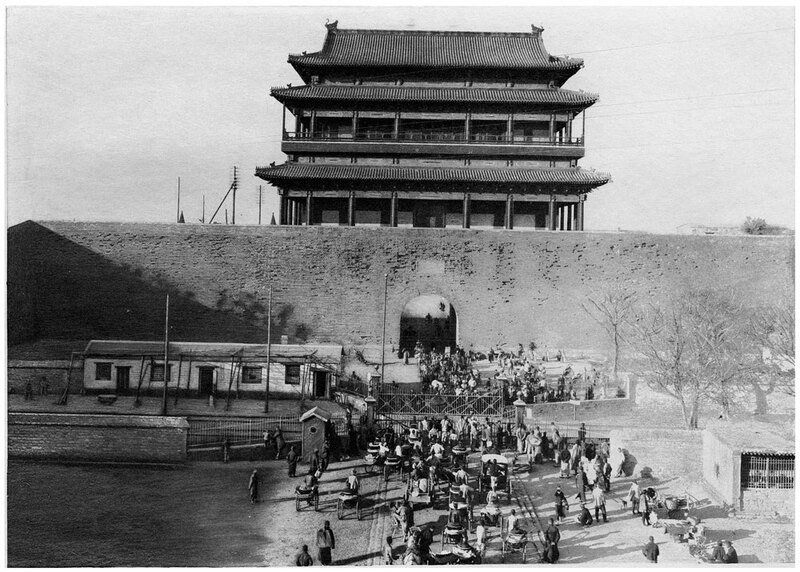 The inner tower and the gateyard, with people waiting for the train to pass. 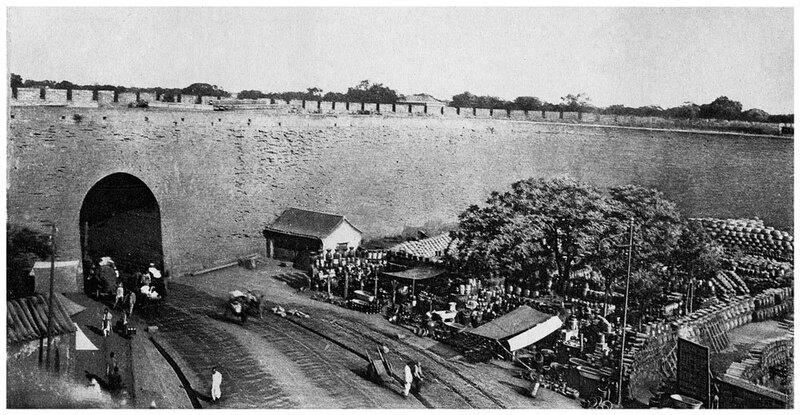 Railway Station near Hata Men. 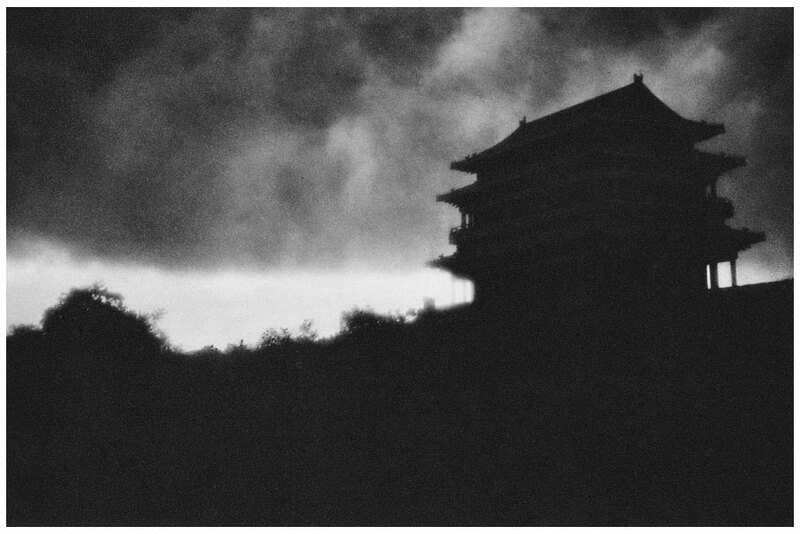 View of Hata men in the distance. 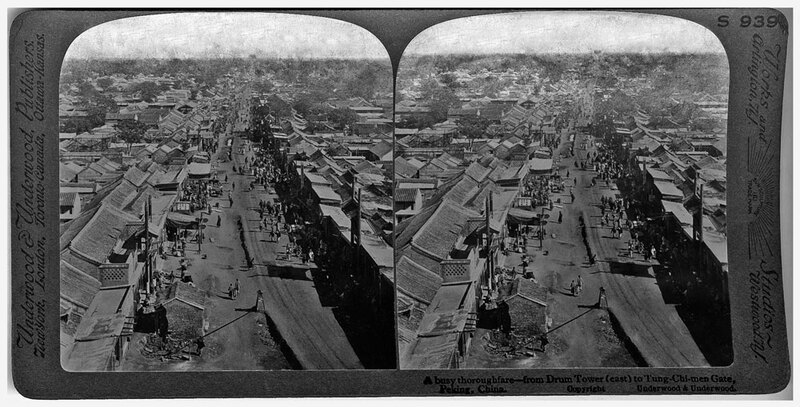 View of the Chinese Quarter from top of Hata Men. 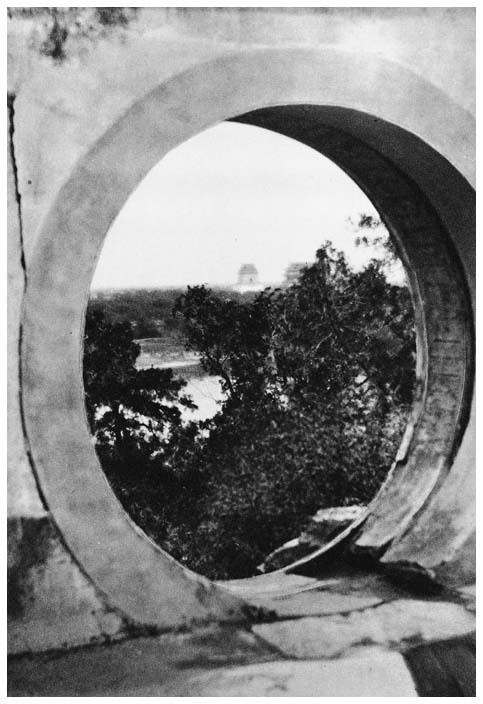 view of Hata Men in the distance from the roof of a Foreign Legation. 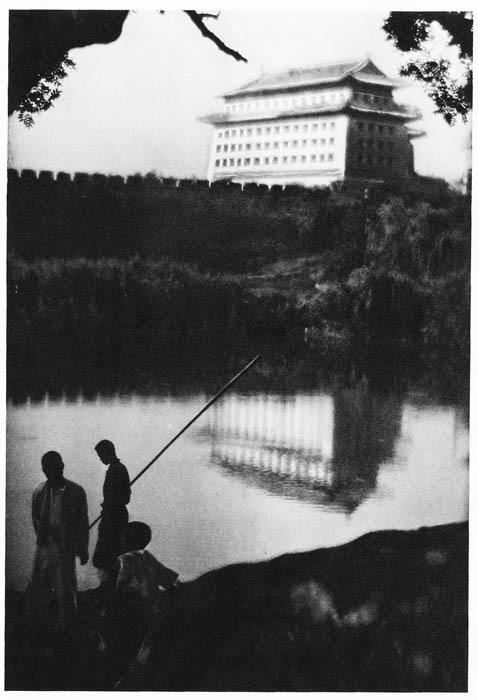 Hata Men in the evening. 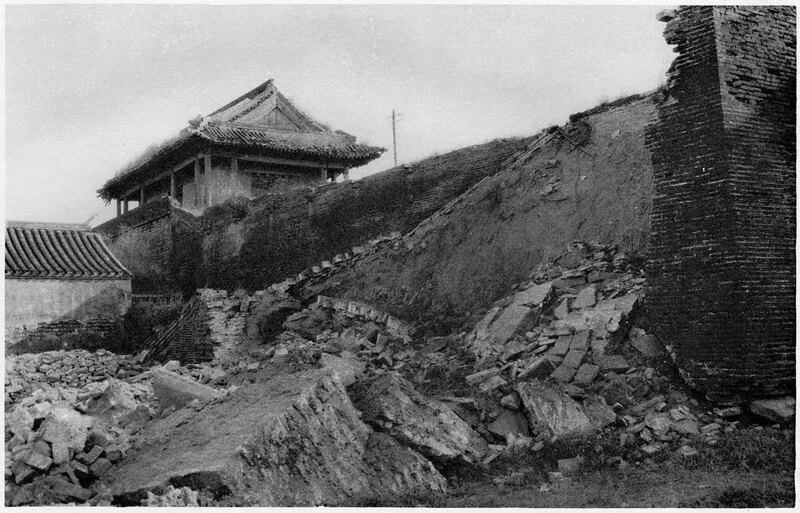 View from outside the city of the main wall extending southwards from Pingzi Men, with the remains of a largely-drained moat at right. 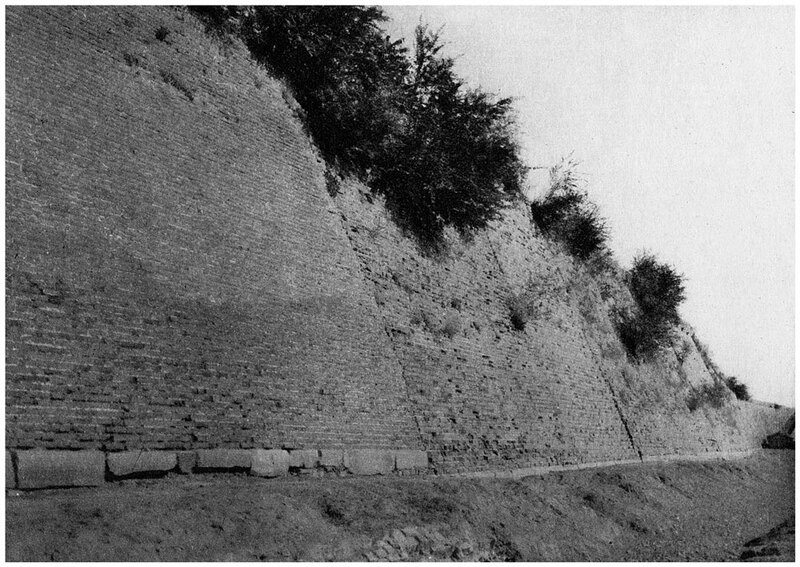 The southern ramp leading up to the top of Pingzi Men, showing its repair in three sections. 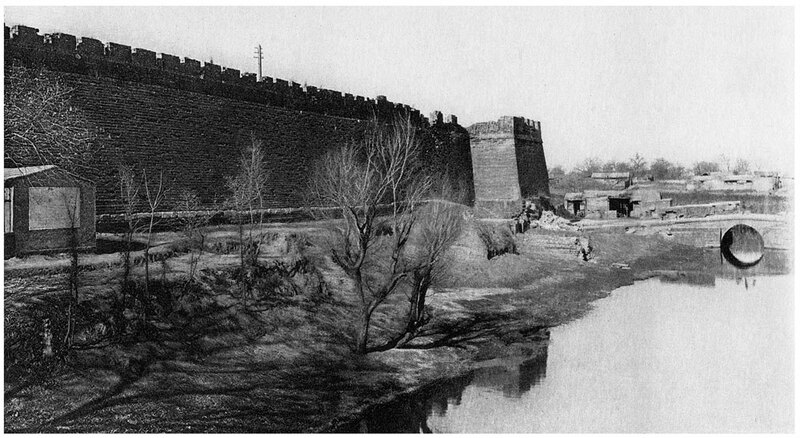 The two gate towers and part of the outer fortifications (the ‘barbican’) seen from outside the city, with the moat in the foreground. 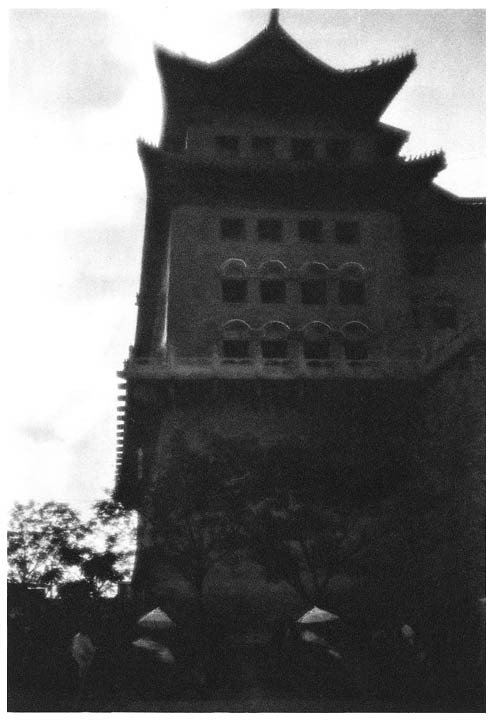 Side view of the outer tower. At right, the west wall of the city continues towards the south. 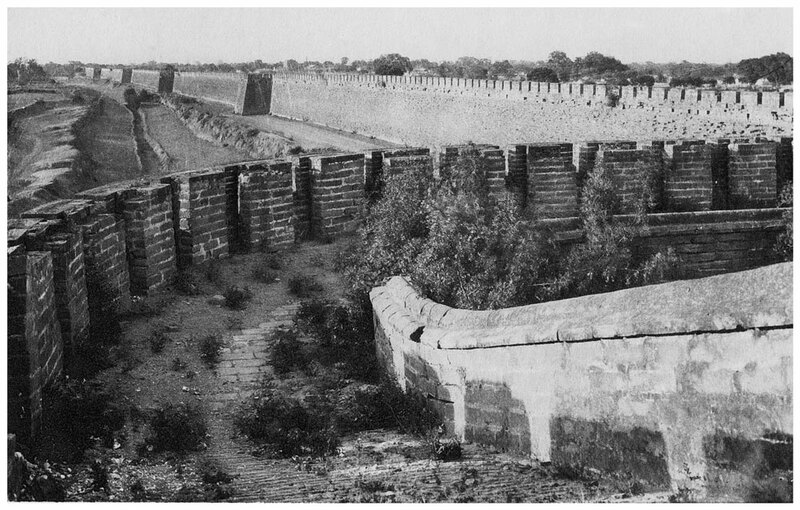 The outer tower seen from the top of the wall. 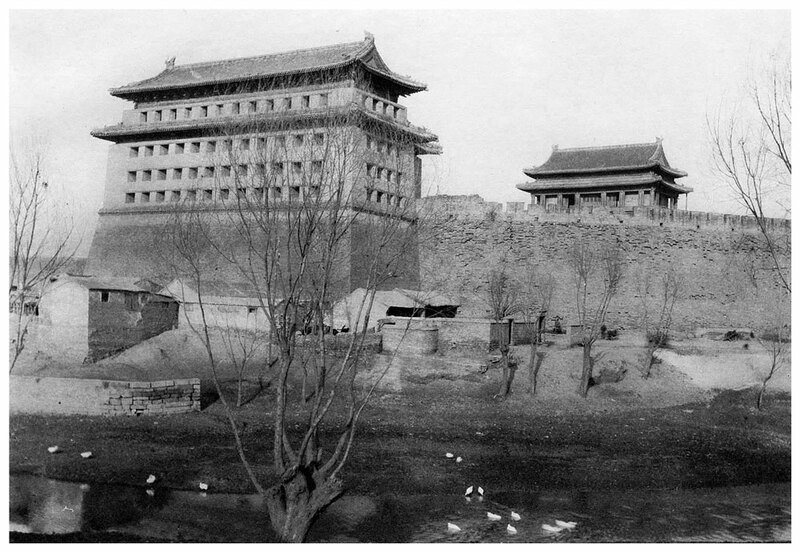 The outer tower and the stalls alongside the wall of the outer fortifications (the ‘barbican’). 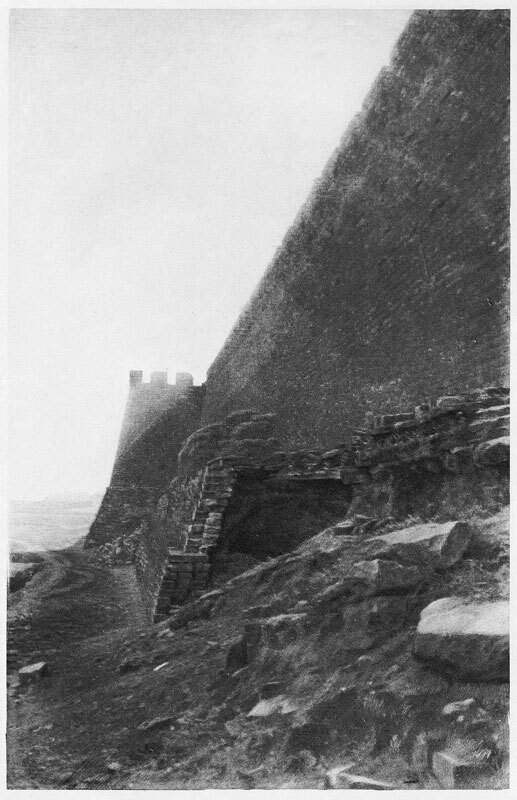 The northern end of the inner tower seen from the wall. 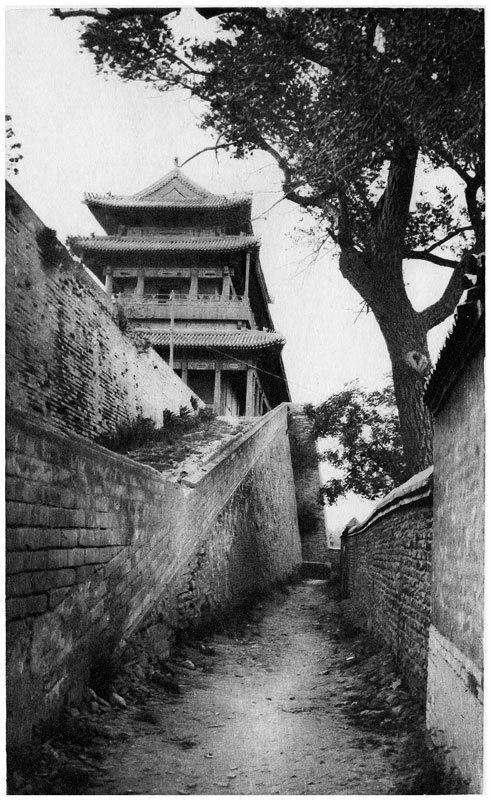 The inner tower as seen from the gateyard, facing due west towards the Western Hills. 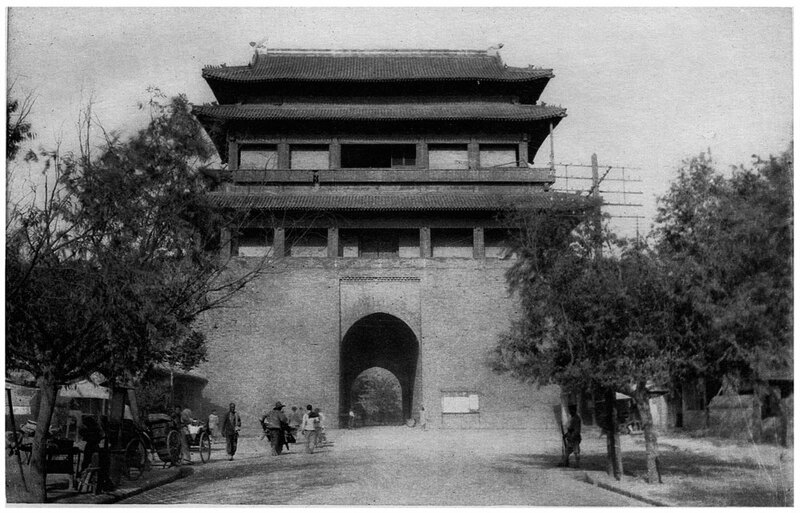 The inner tower, which was restored circa 1920. 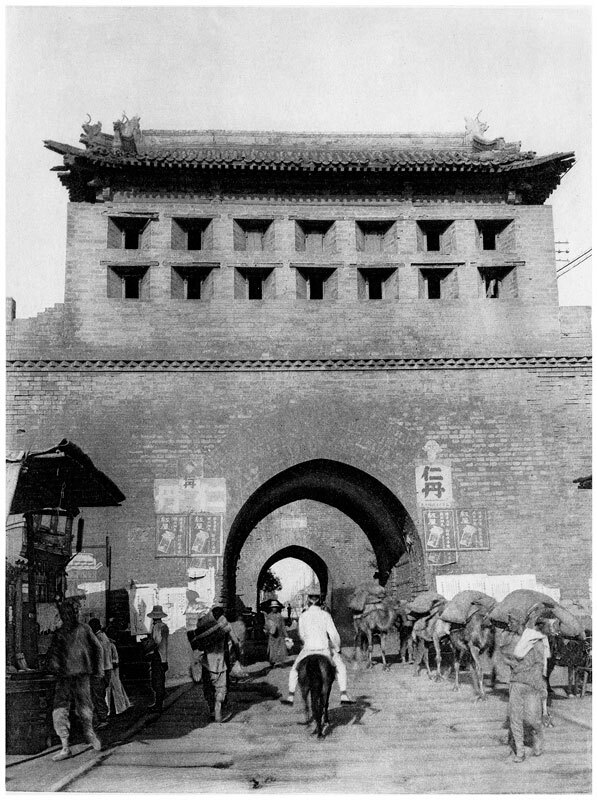 The inner tower and the central portion of the gateyard, some of which is covered with stacked pottery and is a workyard. 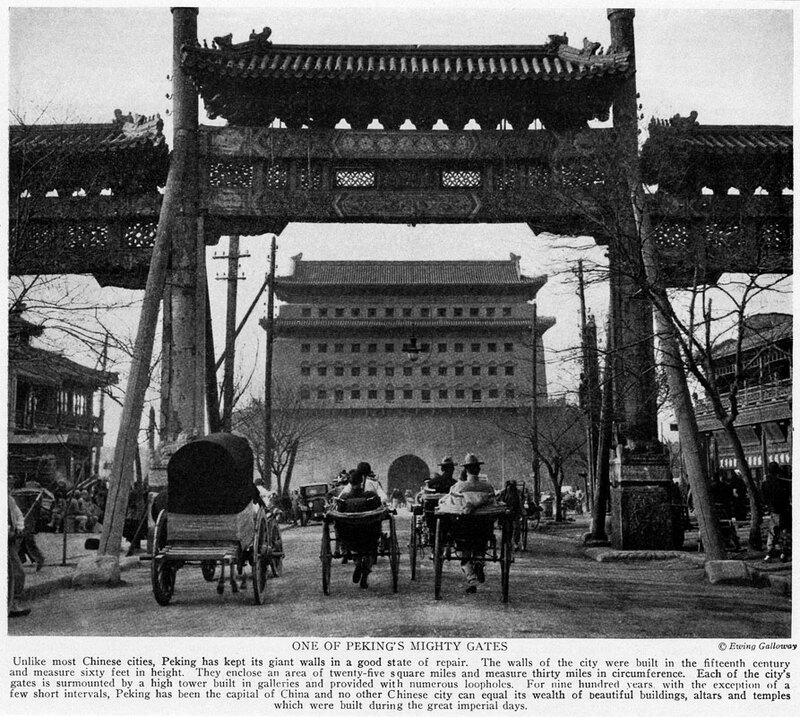 Behind the camera is the outer gate. 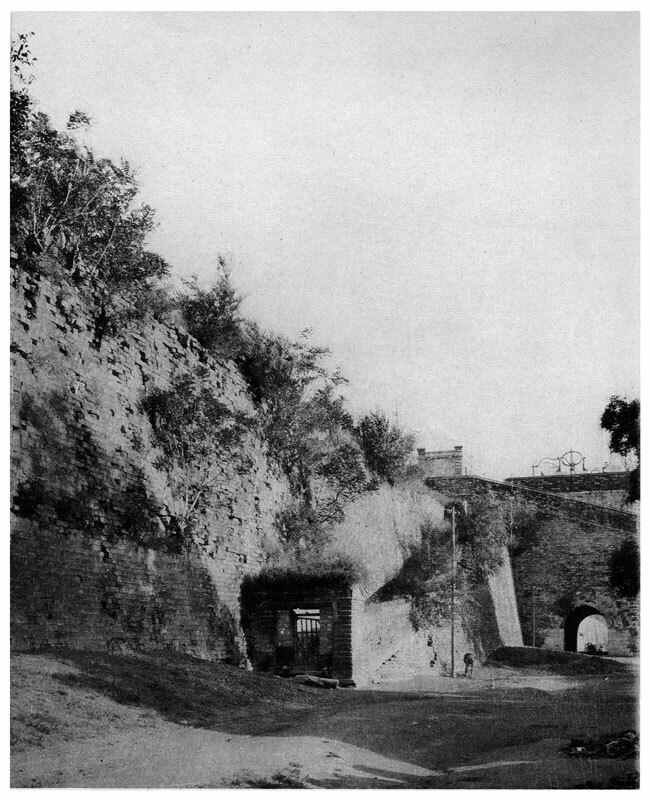 The outer bastion’s tower had earlier been demolished and the surface had been levelled, making this a platform for artillery. 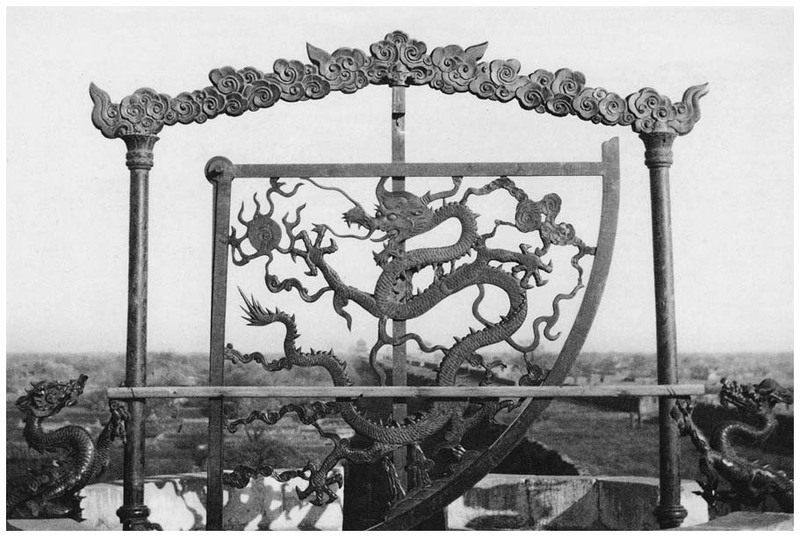 It is not known whether any of these ornate old cannons have been preserved anywhere. 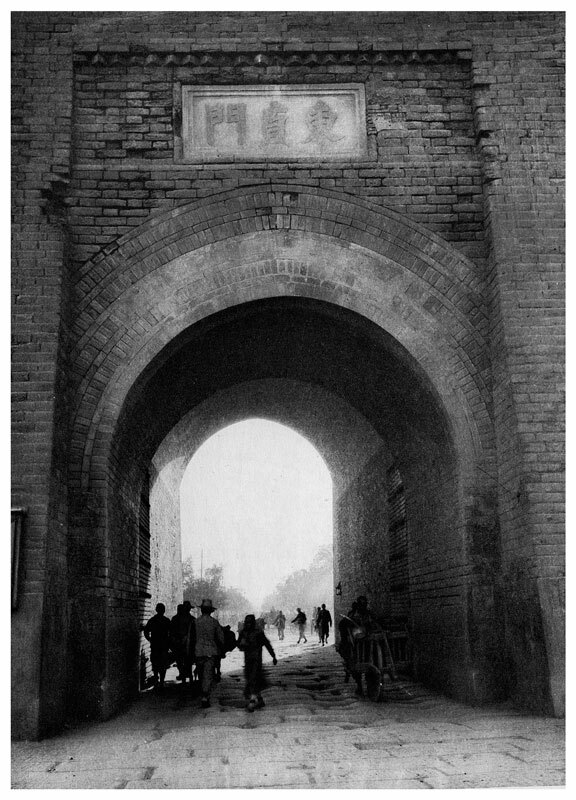 The road through the gateyard which is filled with stacks of pottery. 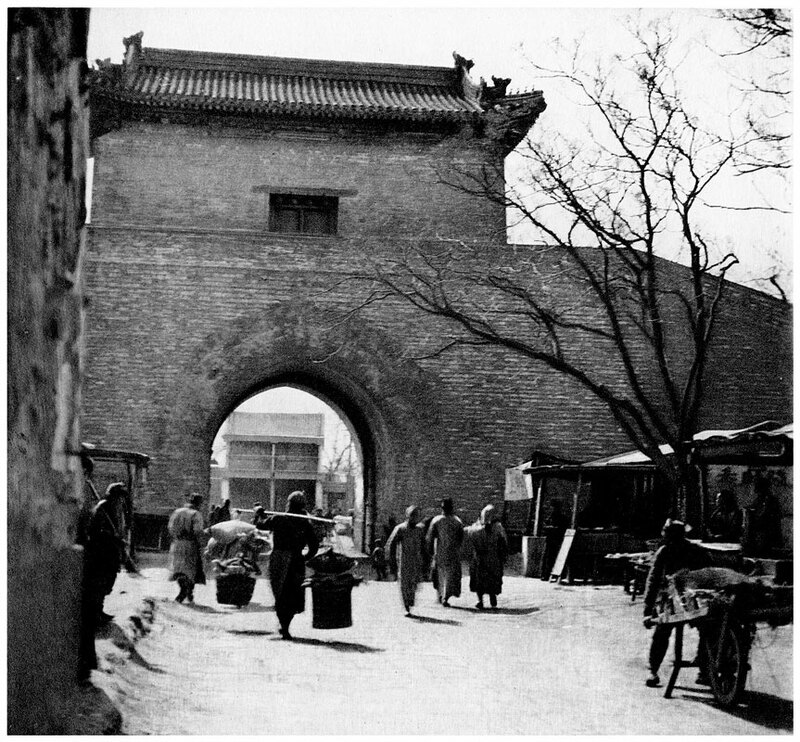 At left is the outer gate leading out of the city, and the city wall encompasses the scene. 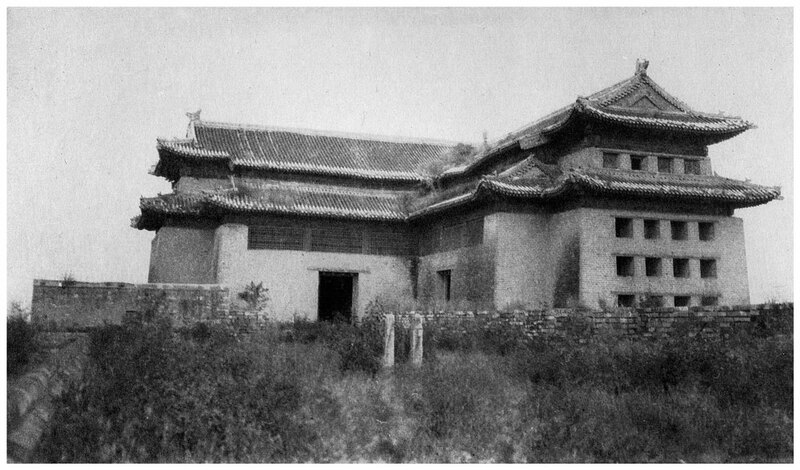 Inner tower from the south, within the gateyard. 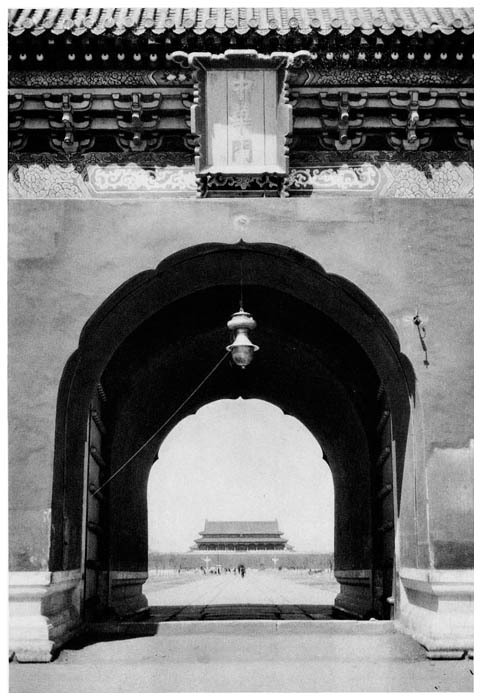 View through the inner gateway of the outer gate beyond, on the far side of the gateyard. 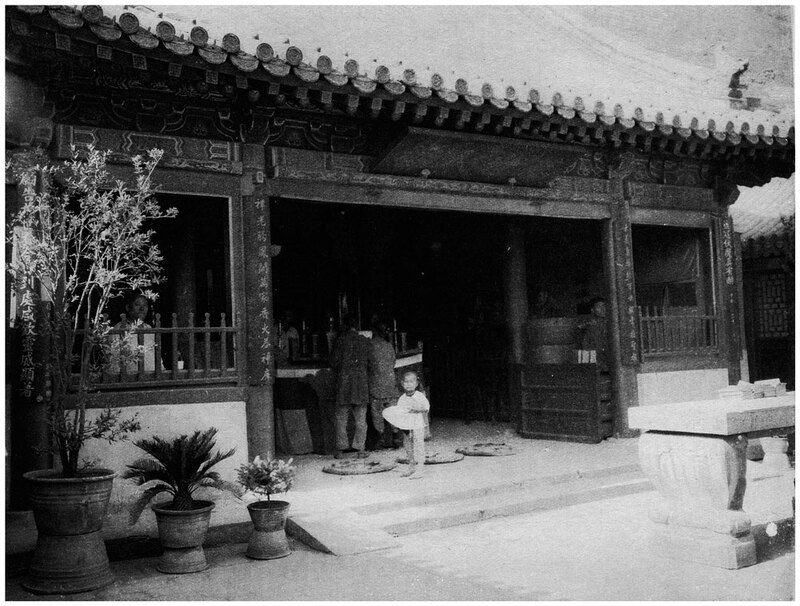 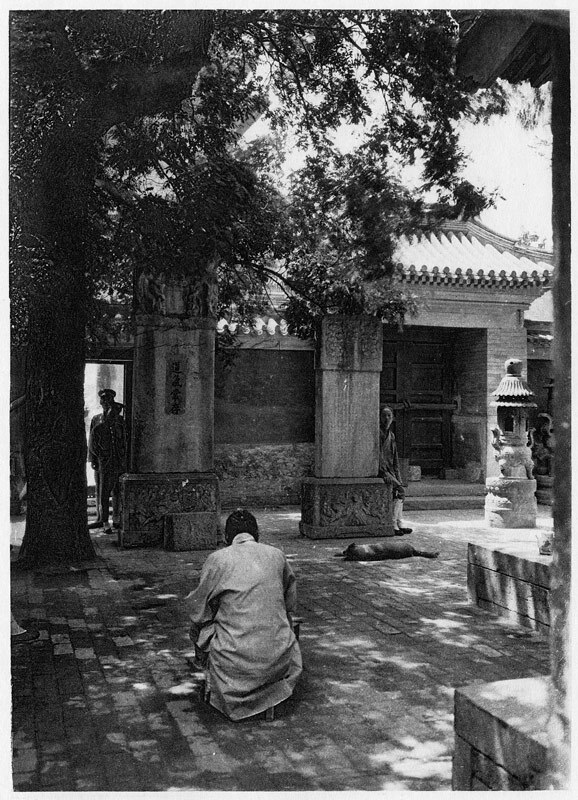 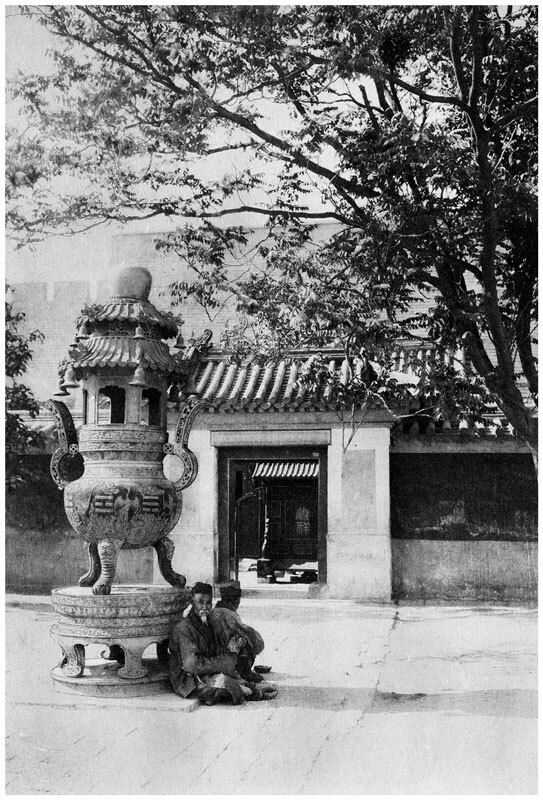 At the entrance to the Guandi Temple which stood at this time in the gateyard at Tian Men. 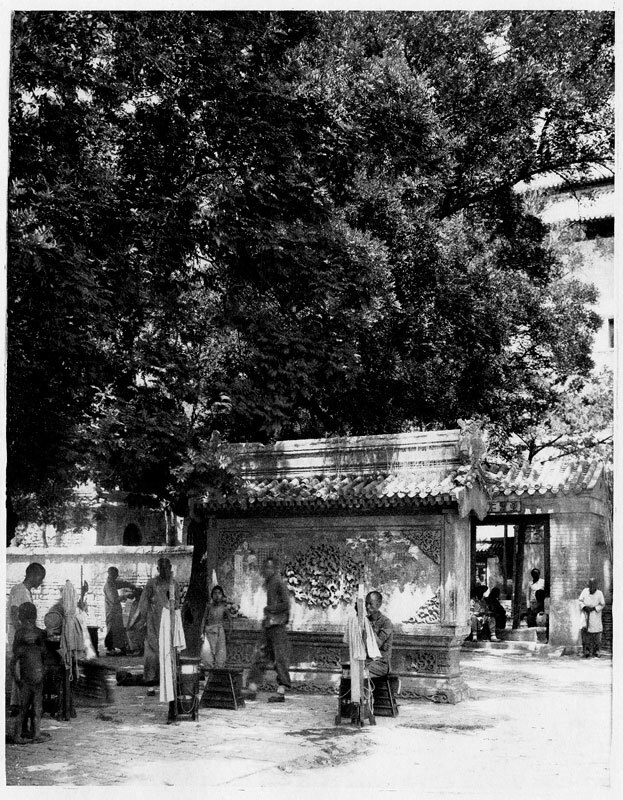 Worshippers in the Guandi Temple which then stood at Tian Men. 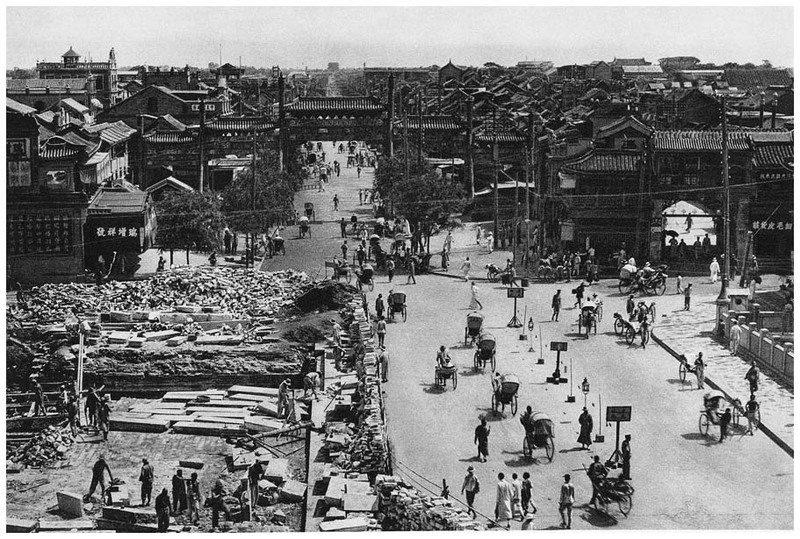 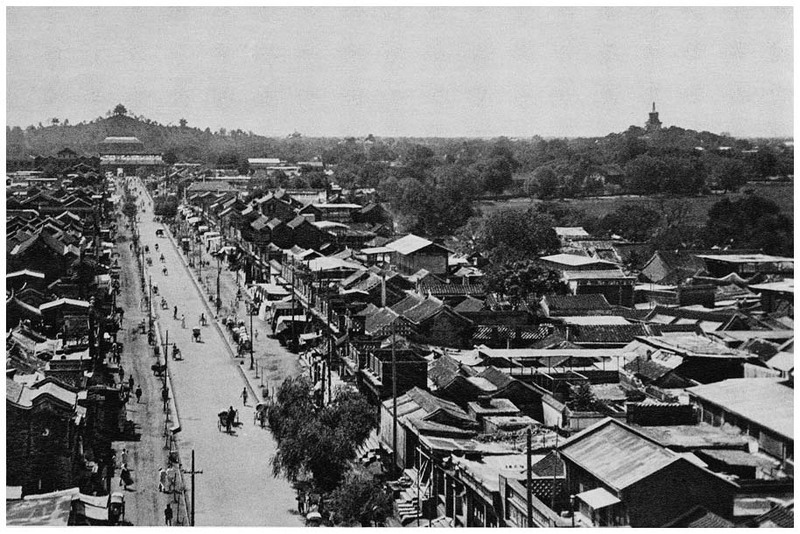 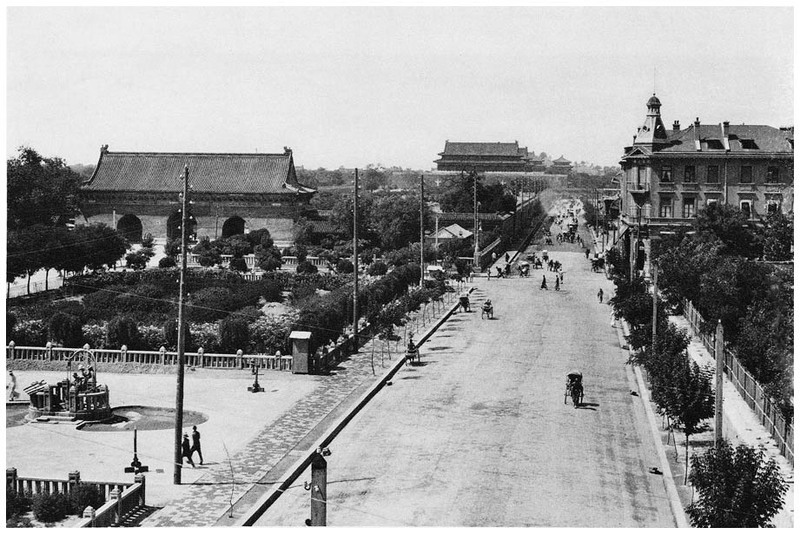 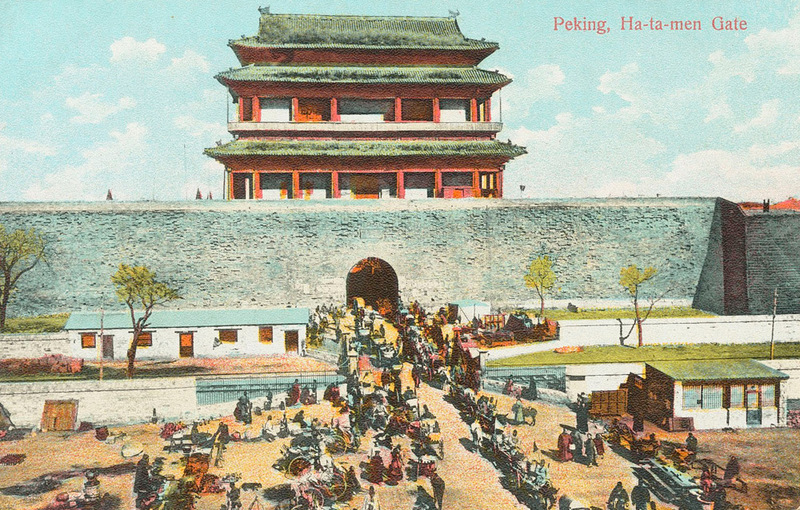 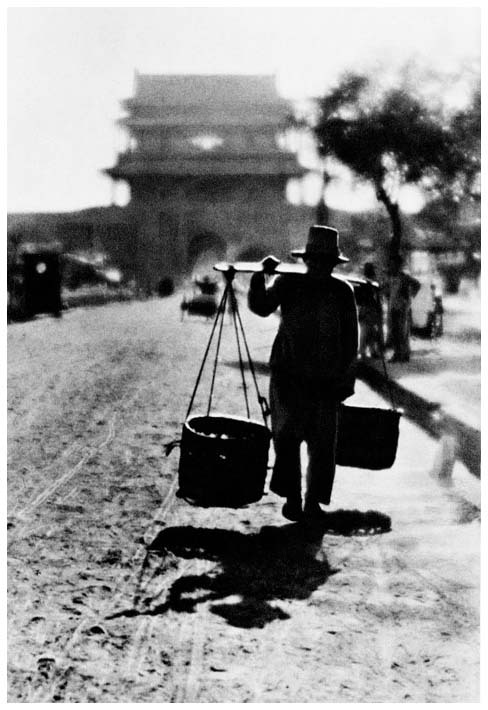 View from the outer tower over the new bridge (this photo was taken in 1922) and the main street of the outer city, hence this view looks due south in an axis central to that of the Forbidden City, which lies behind. 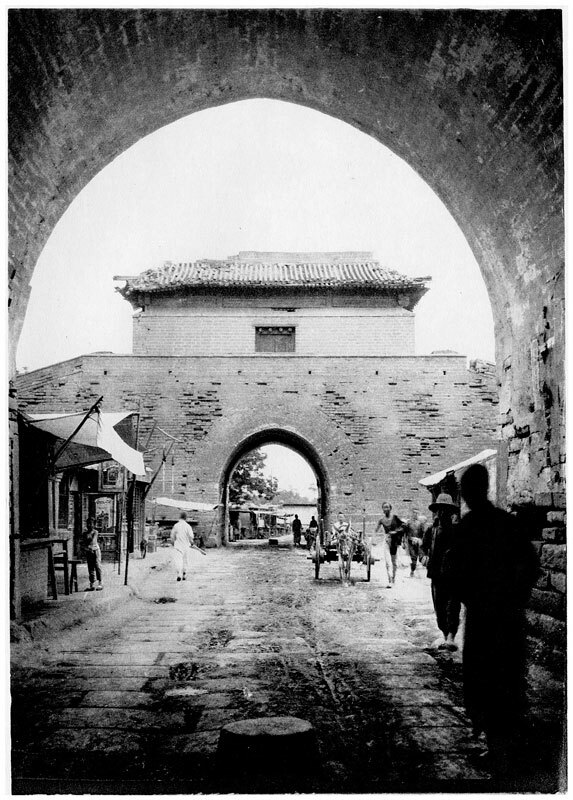 View through the outer gate, showing the inner gate and the city beyond. 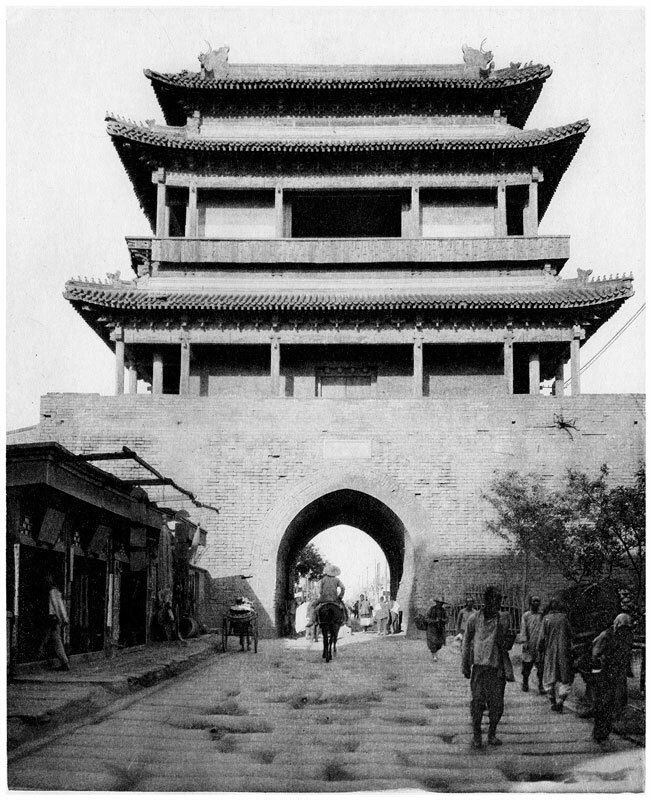 The inner tower, with the outer tower glimpsed through the opening behind it. 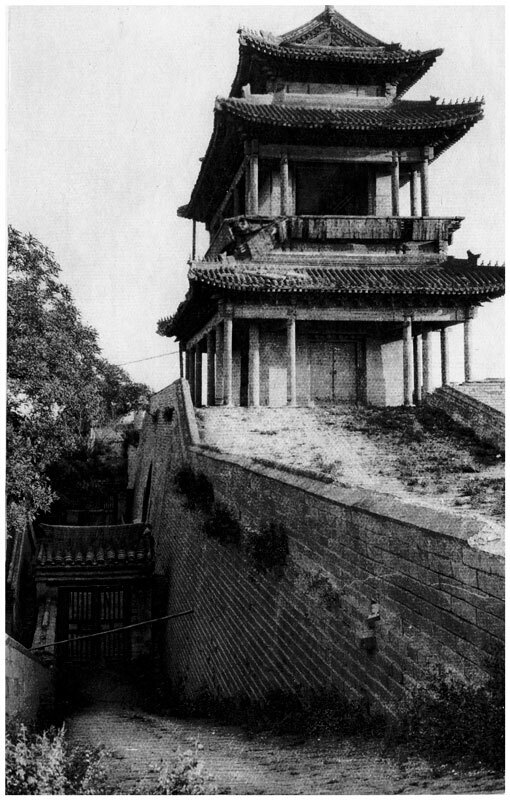 A view through the gateyard from the inner tower, showing the outer tower. 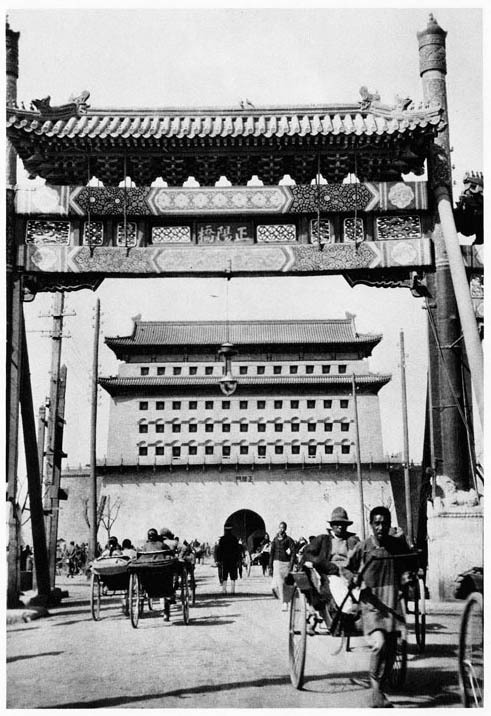 A funeral procession taking place outside the gate. 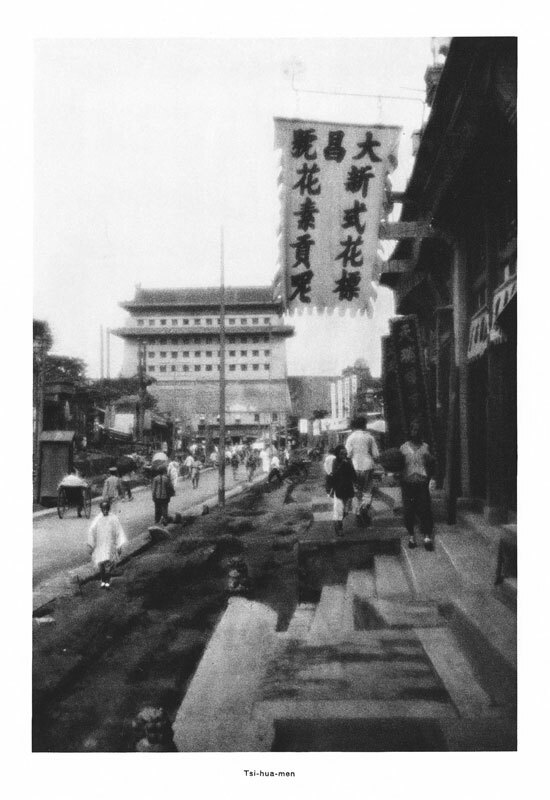 The city street leading up to the inner gate. 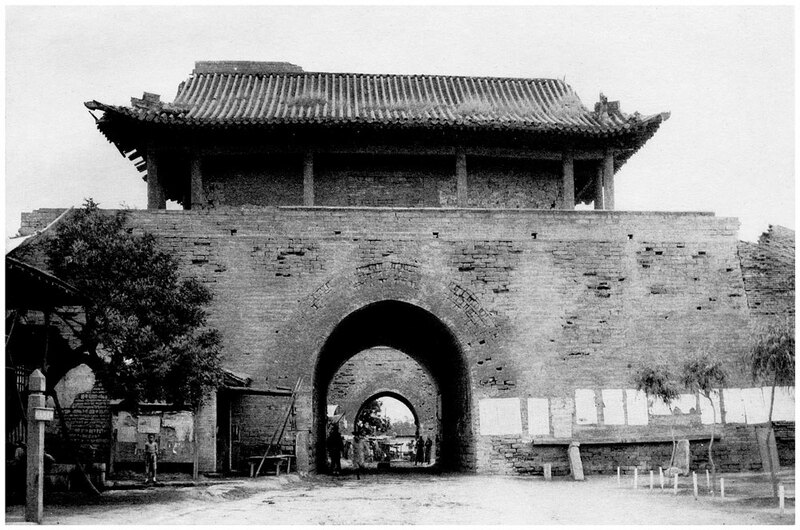 Through it, beyond may be seen the arched outer gate. 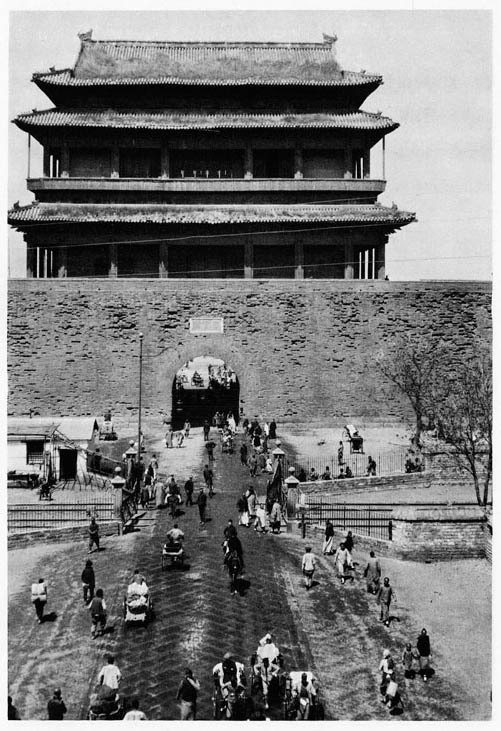 The inner gate tower, seen from the top of the gate. 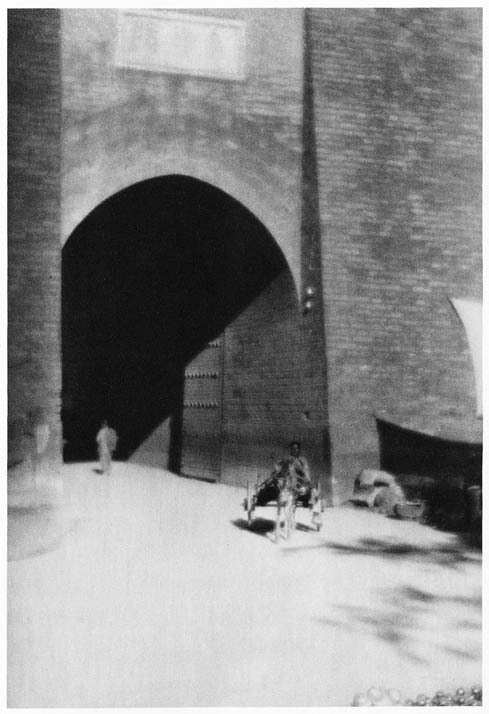 The ailanthus (locust) tree in the gateyard, with a cart entering from the outer gate. 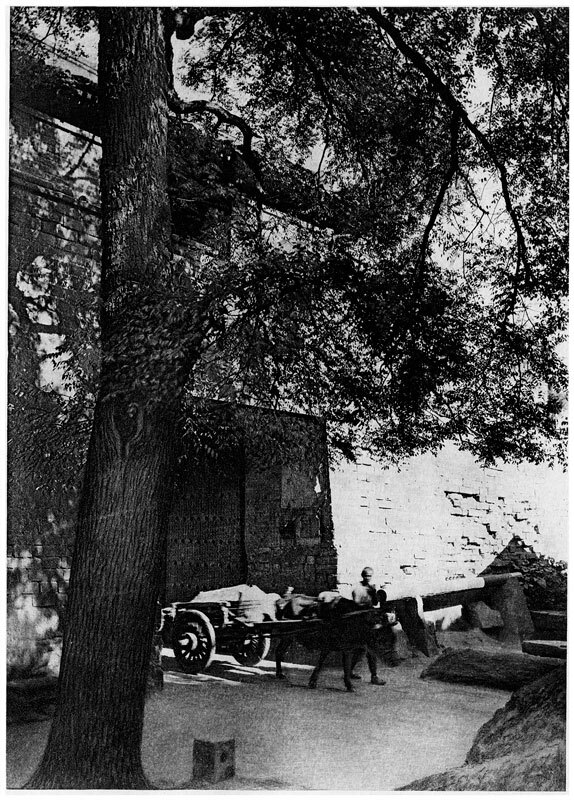 The ailanthus tree in the gateyard, with a camel passing through the outer gate. 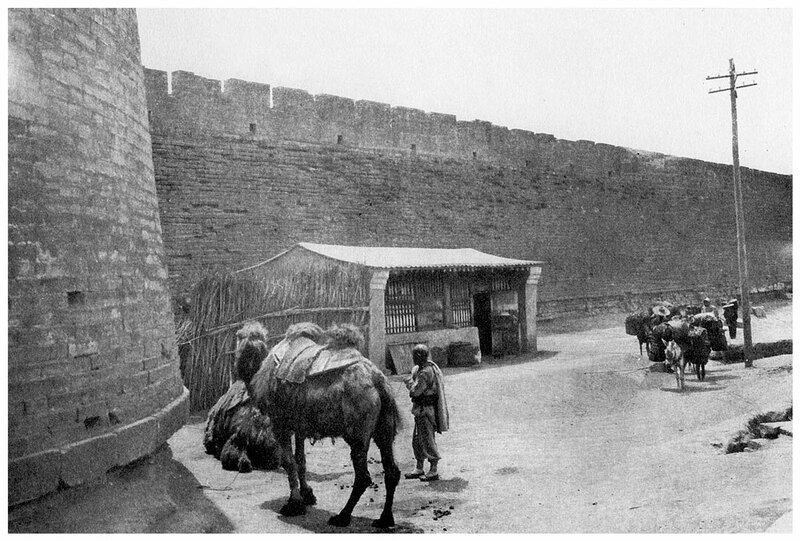 Camel caravan passing through the gateyard and about to enter the outer gate. 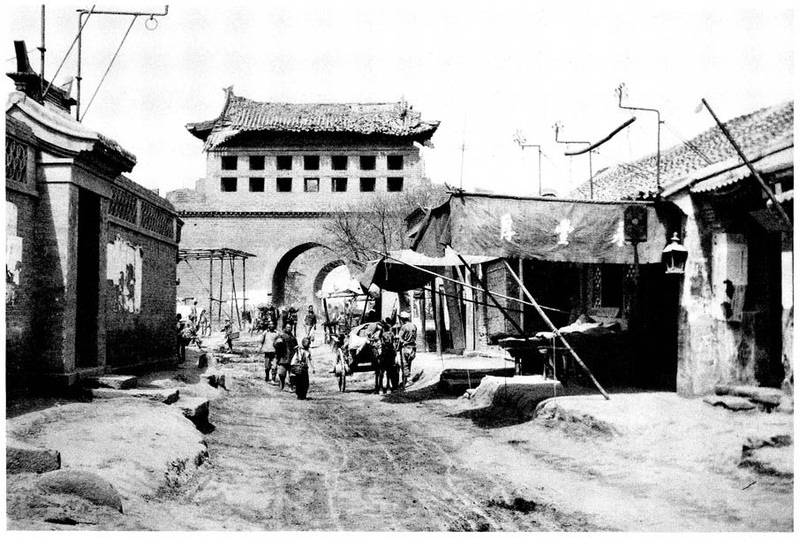 The inner gate and a street of the city may be glimpsed in the background. 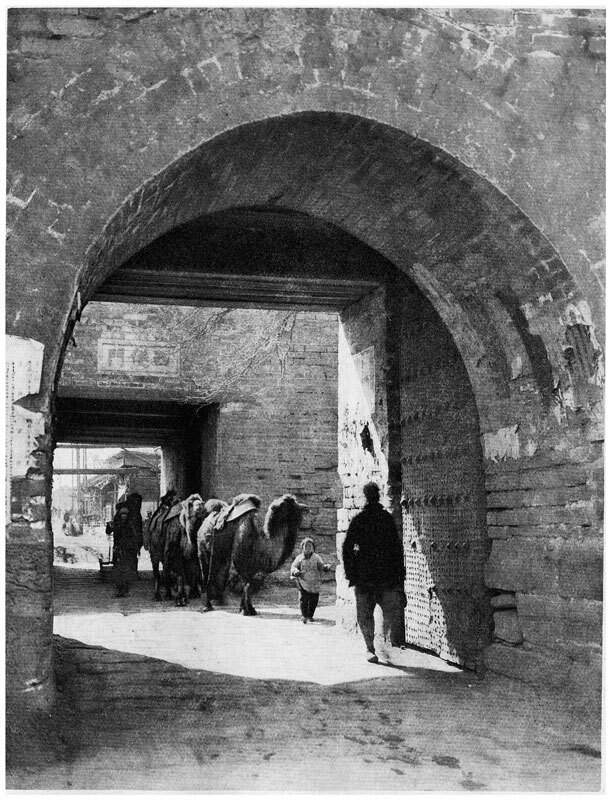 The narrow shaded street outside the gate. 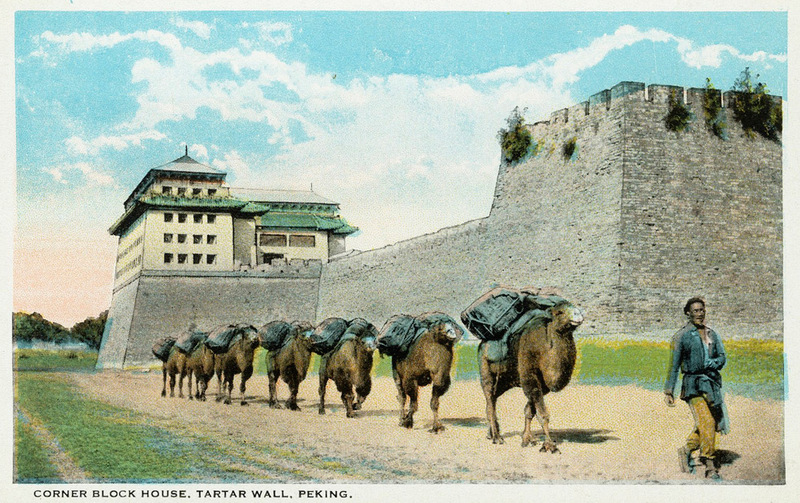 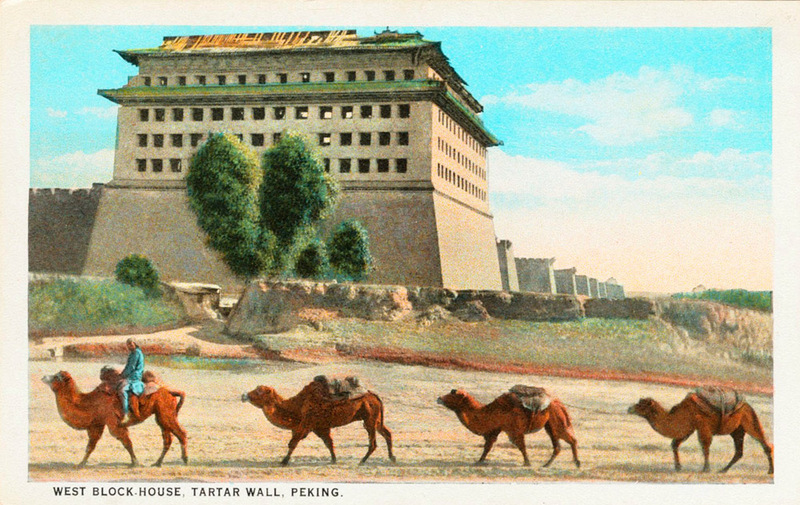 Camels outside the Xibian Men, and part of the city wall. 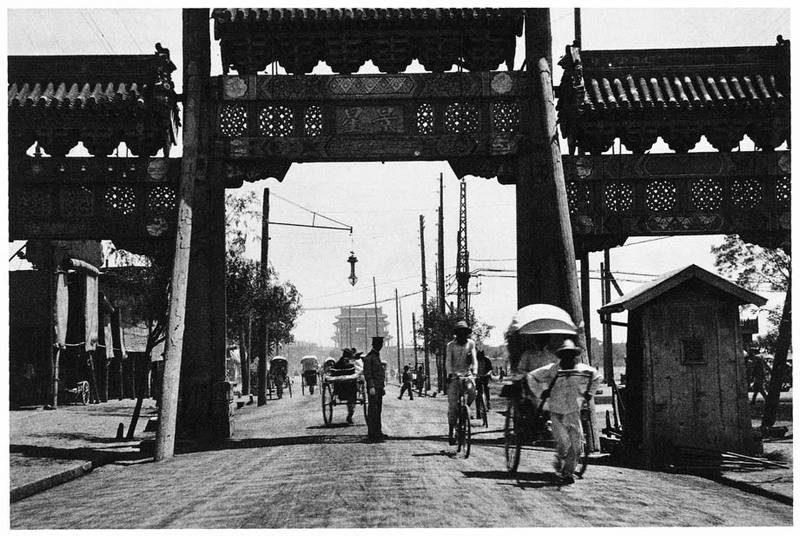 The complete gate seen from the south. 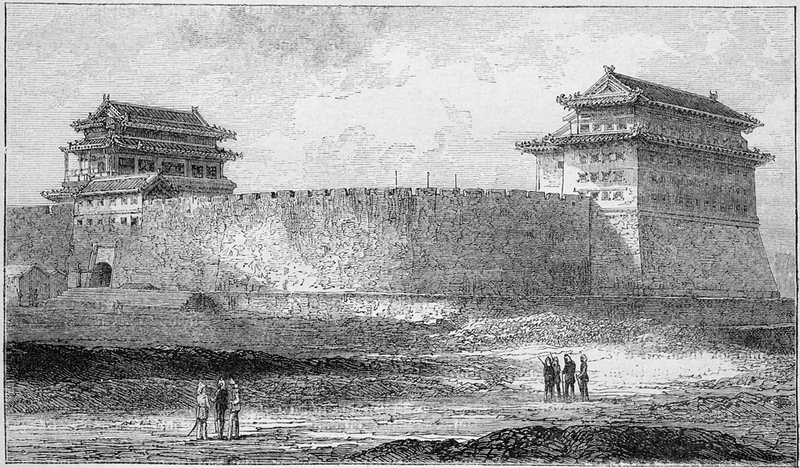 At left is the outer tower and at right is the inner tower, with a continuation of the west wall of the city at far right. 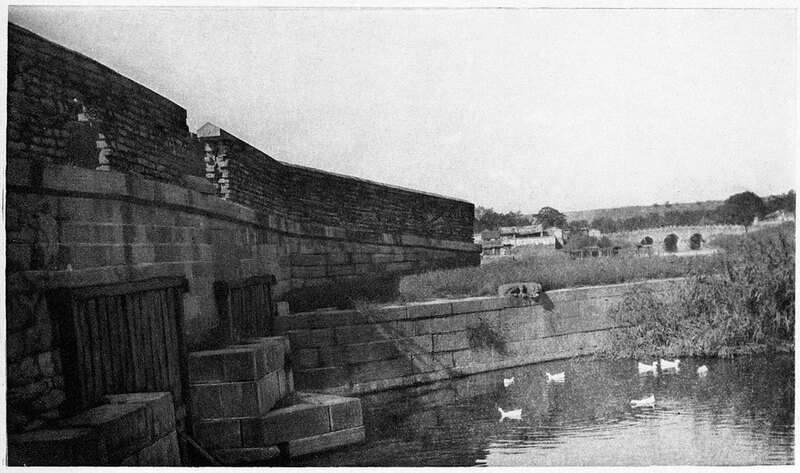 In the foreground is the moat. 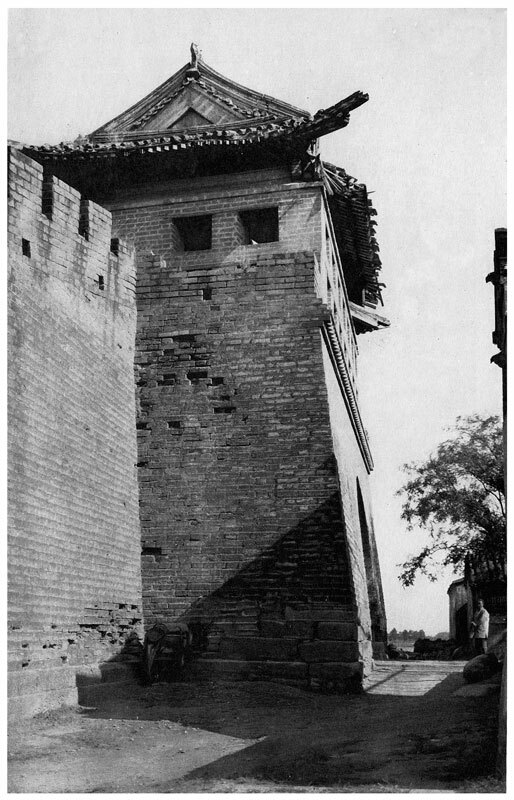 Side view of the inner tower, with the ramp leading up to it. 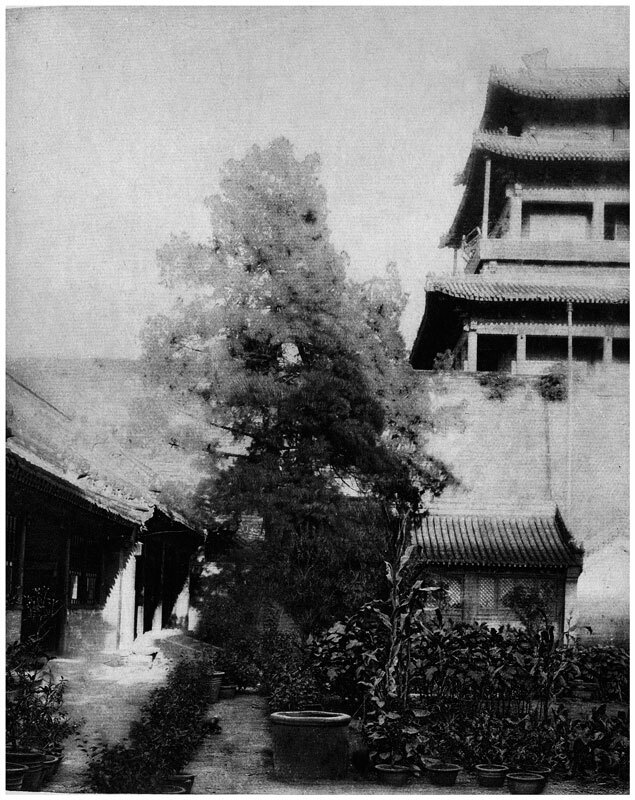 The outer court of the temple in the gateyard, with a juniper tree in the foreground. 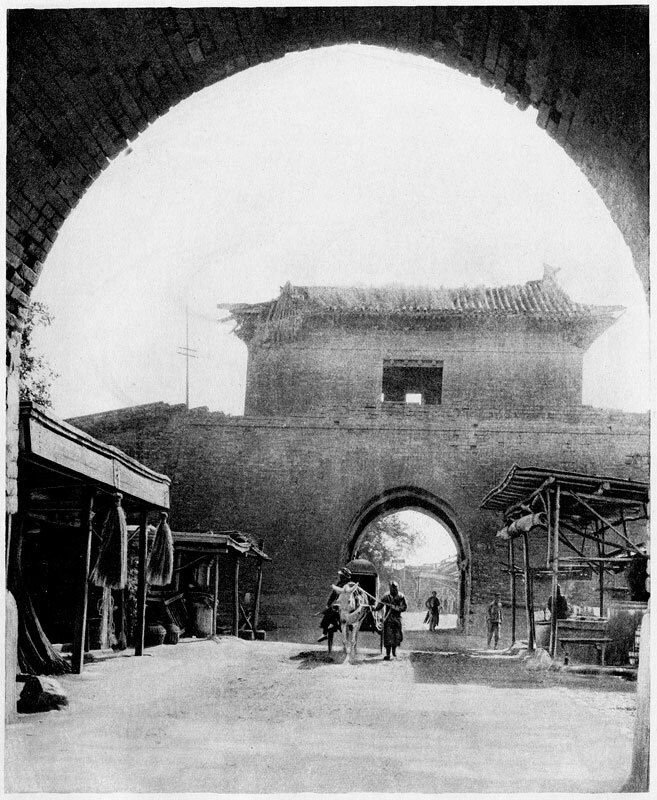 View through the outer gate. 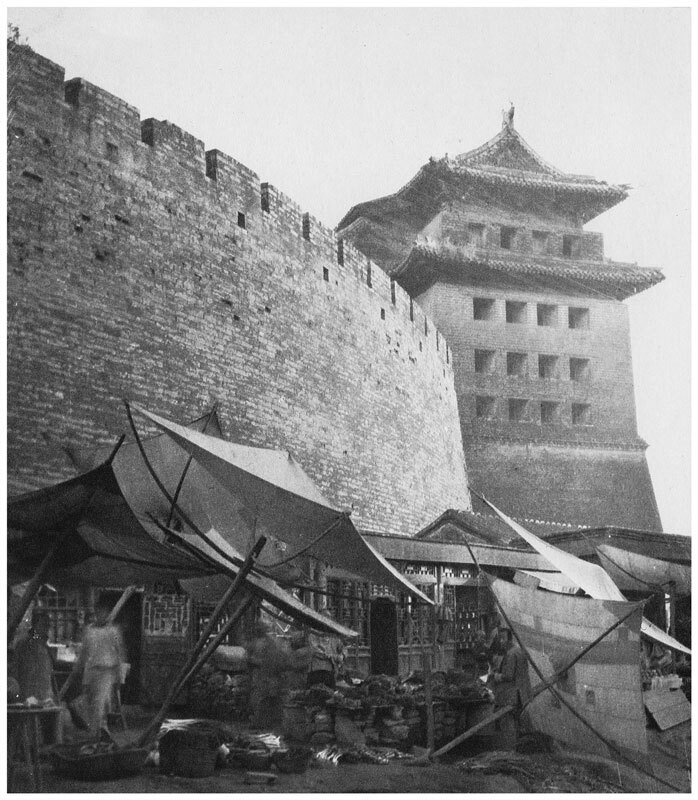 The small side tower over the barbican gate of the outer fortifications, and the adjoining shops. 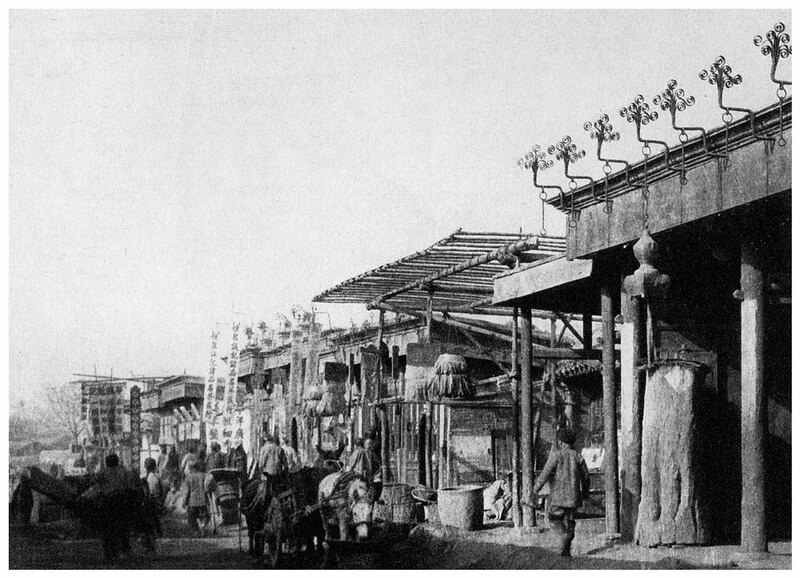 The street lined with old shops outside the gate. 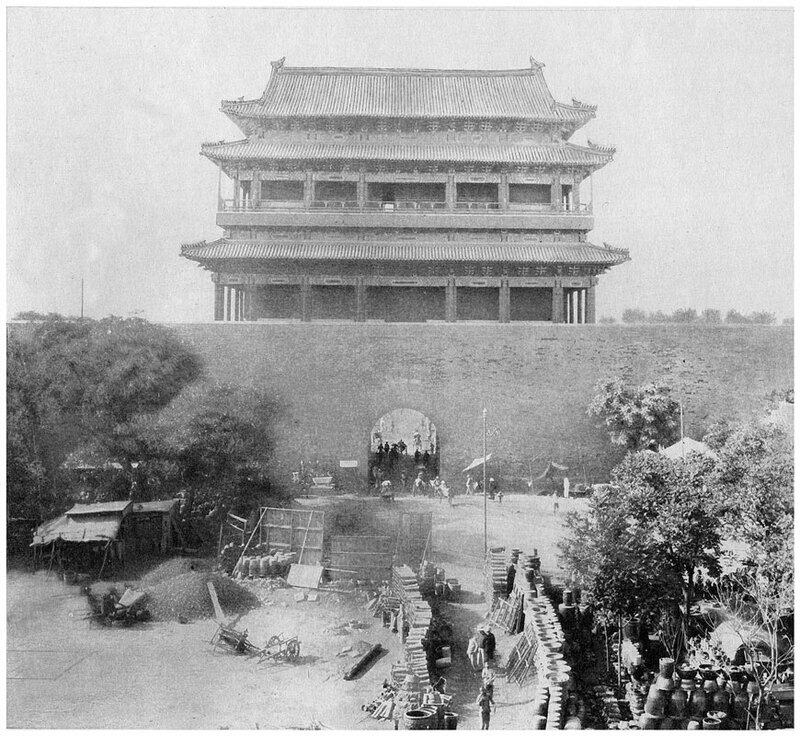 View through the gateyard from the inner tower, showing the outer tower. 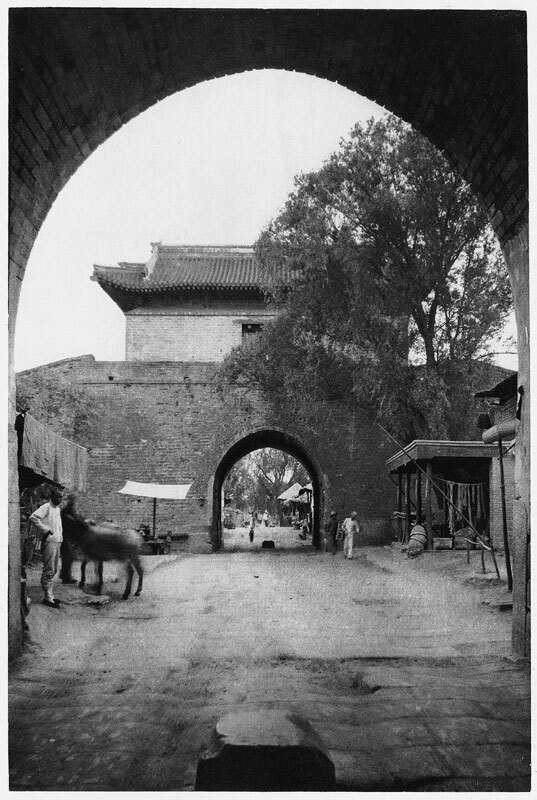 The gateyard and the outer tower. 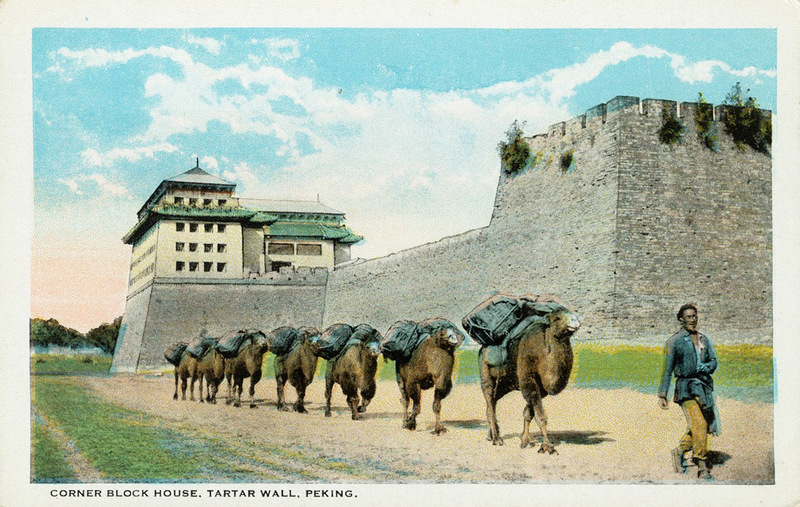 A camel caravan from outside the city passing through the gate in winter time. 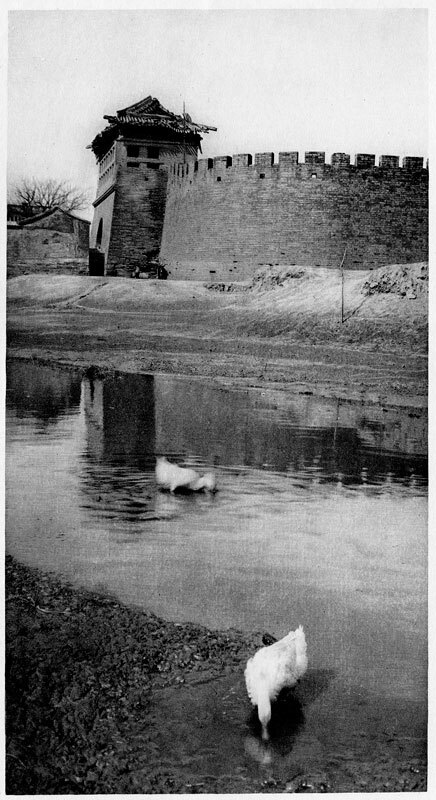 The outer tower and the moat, with swimming ducks. 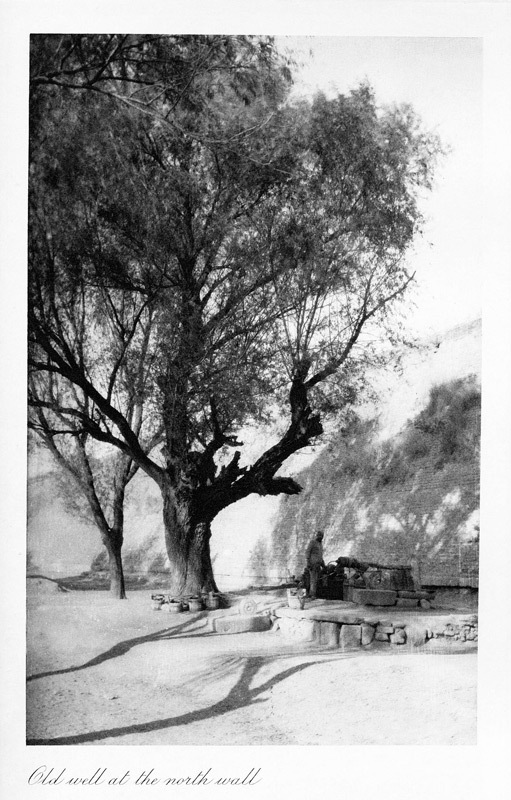 The weeping willows and low bridge outside the gate of Yuan Men. 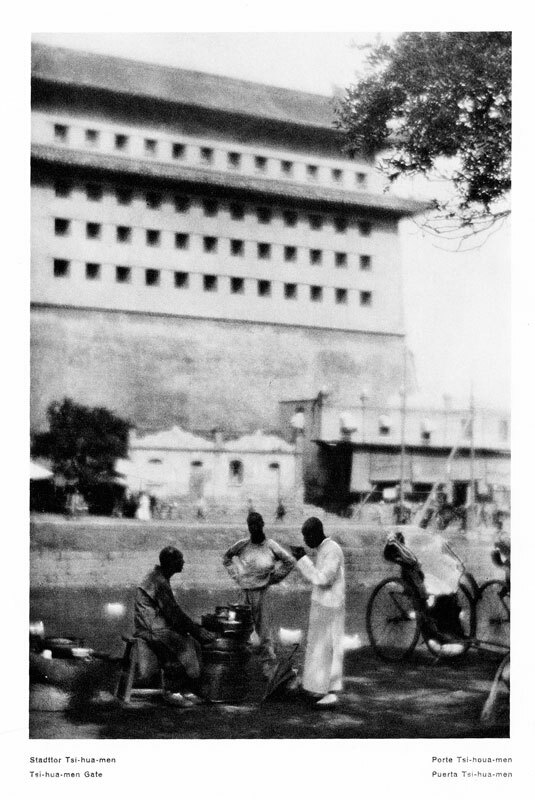 Bulrushes and children in the moat outside Yuan Men. 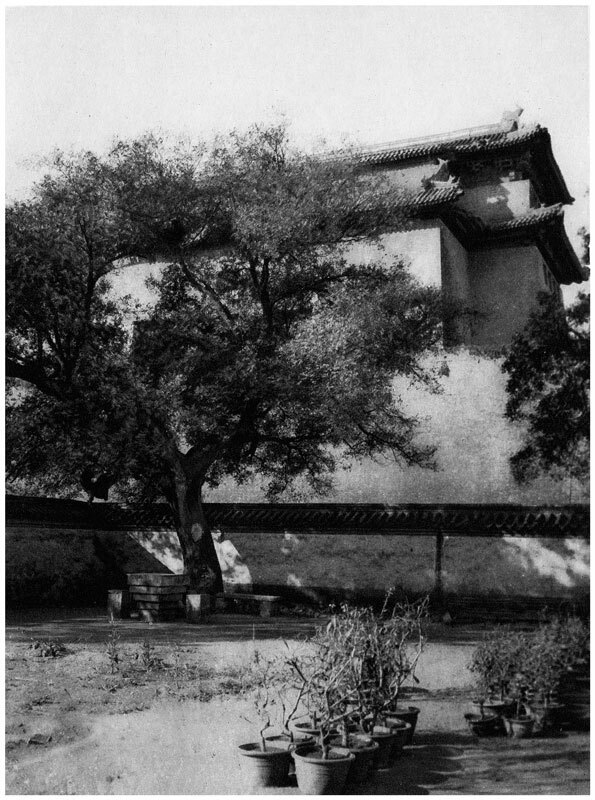 The inner tower, with ailanthus trees on the bastion. 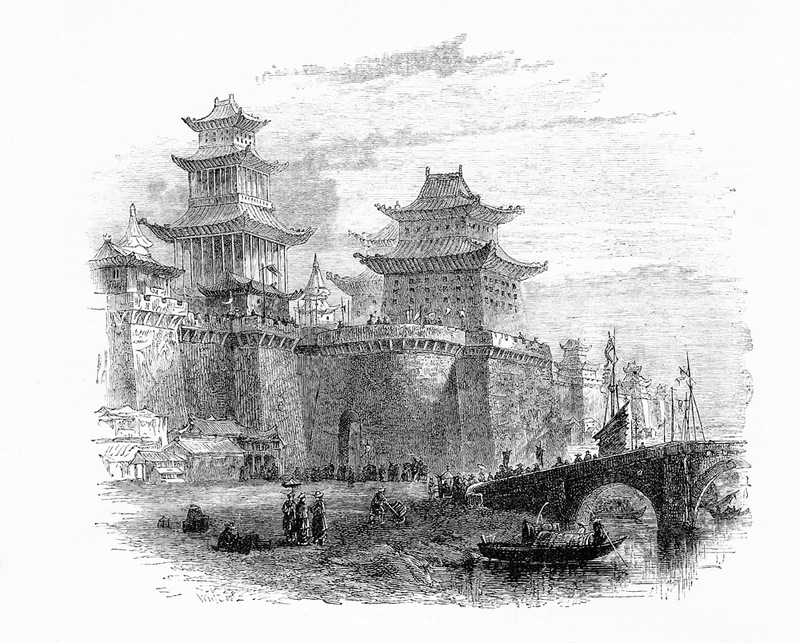 Front view of the two towers and the outer fortification (the ‘barbican’). 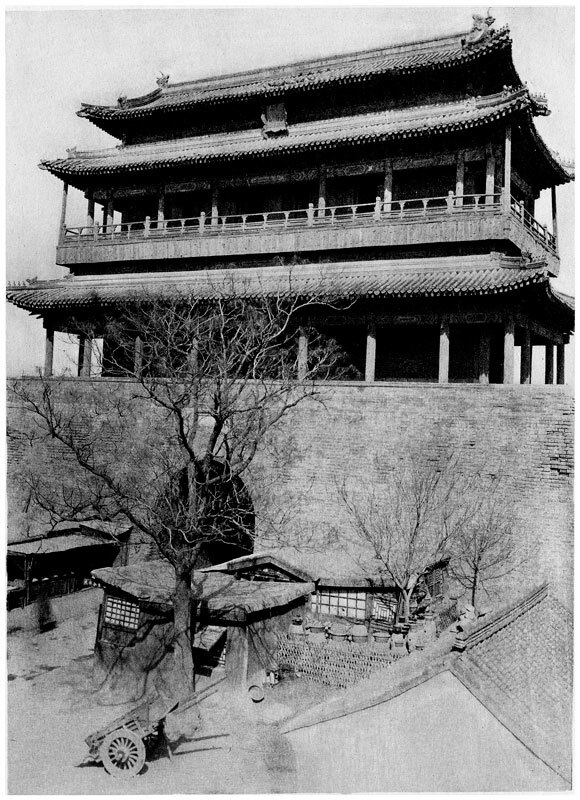 The inner tower seen from the gateyard. 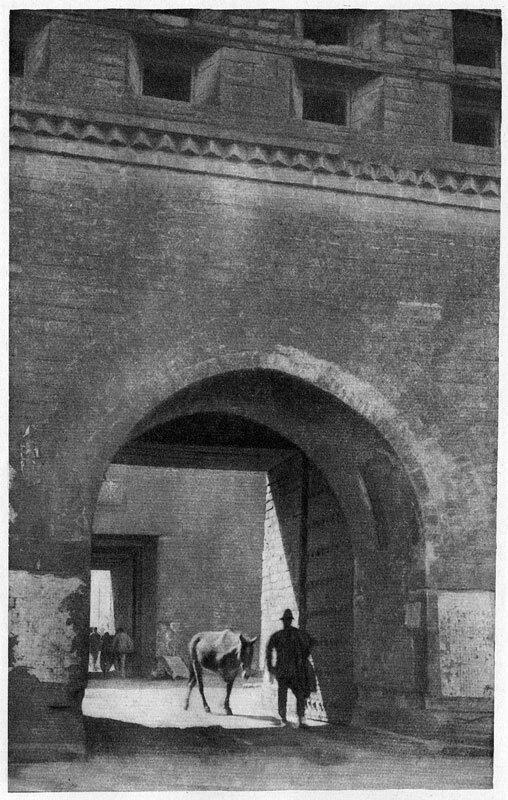 View of the outer tower from the gateyard. 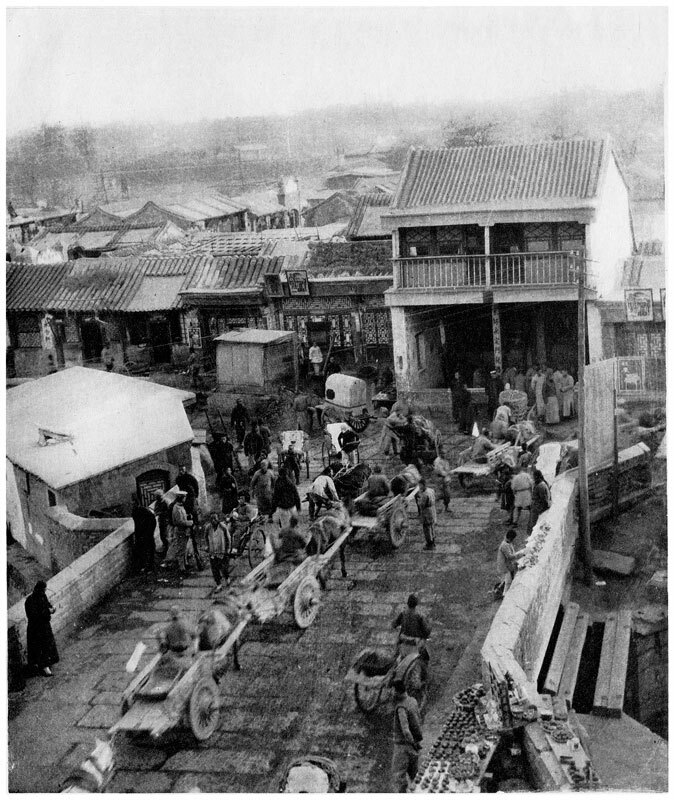 The traffic of carts on the bridge over the moat at Yongding Men. 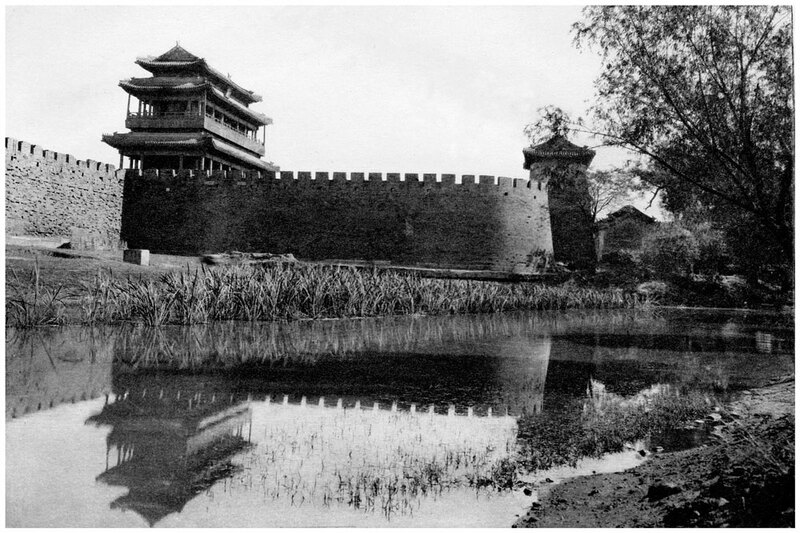 Side view of the whole gate and the moat. 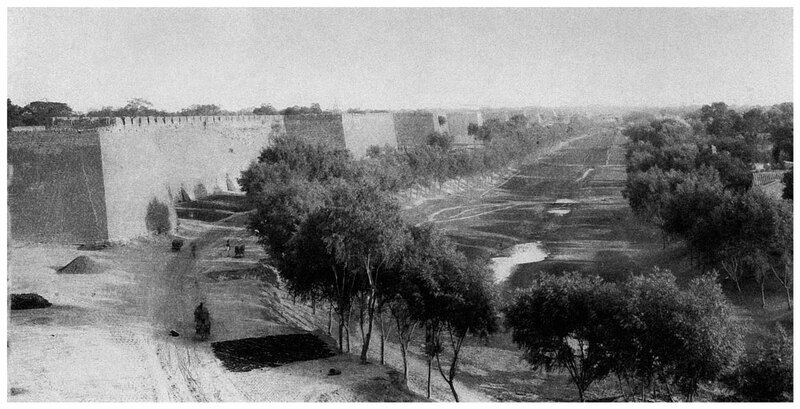 View of the vast extent of the western wall of the Chinese city, seen from the outer bastion of Zhangyi Men, looking northwards. 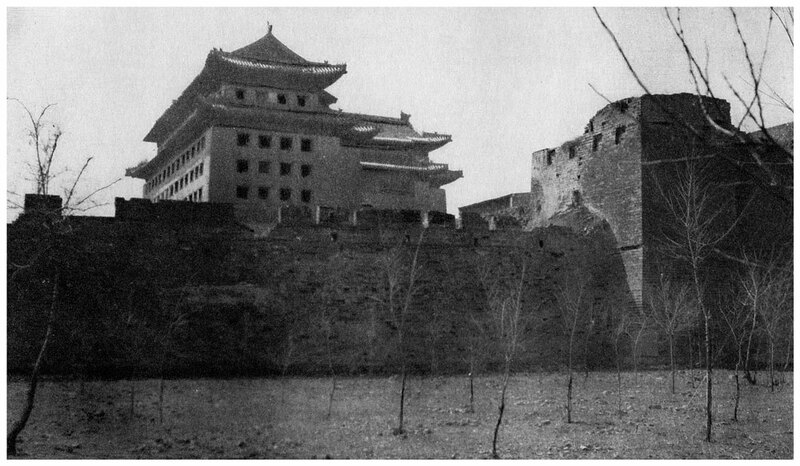 Side view of the two towers and the outer fortification (the ‘barbican’). 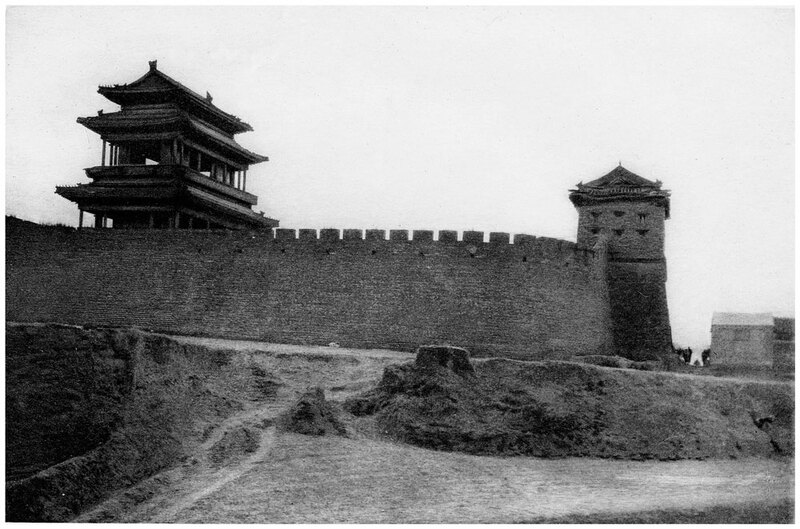 Part of the gateyard and the inner tower. 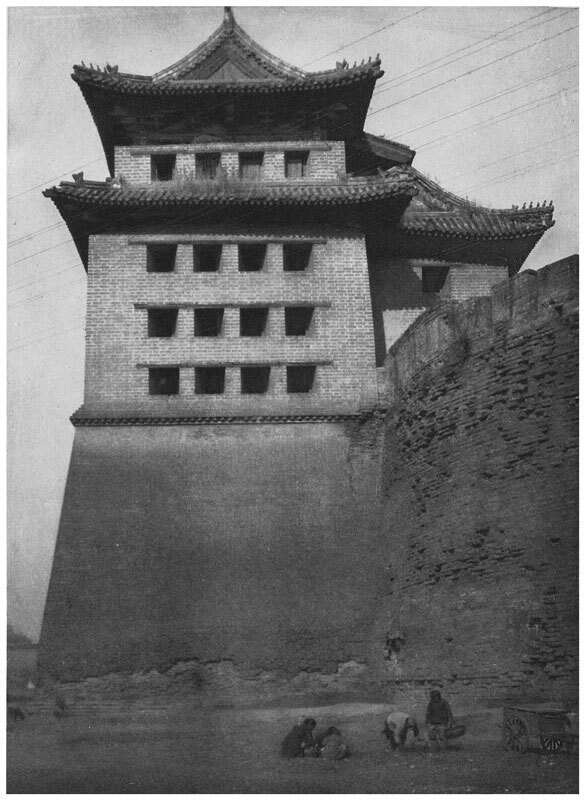 Side view of the inner tower. 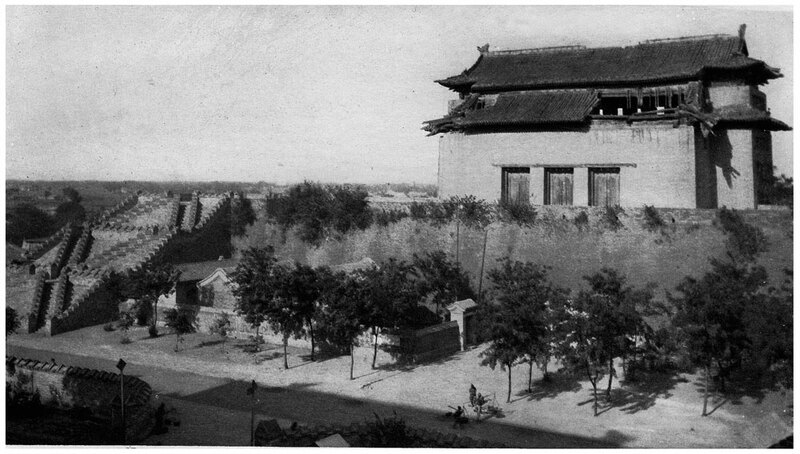 The inner tower of Zhangyi Men seen across the gateyard, from the outer tower. 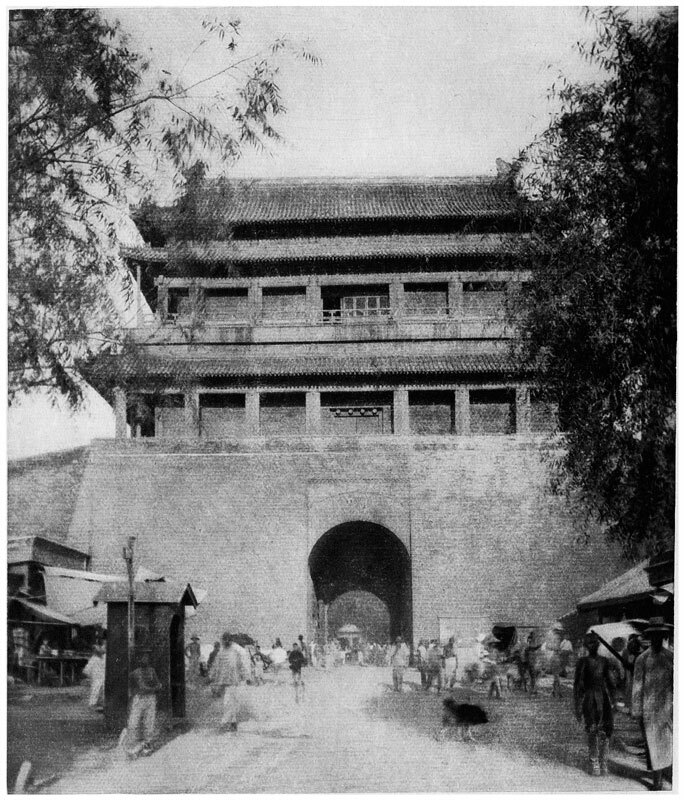 The outer tower of Zhangyi Men, seen from outside the city. 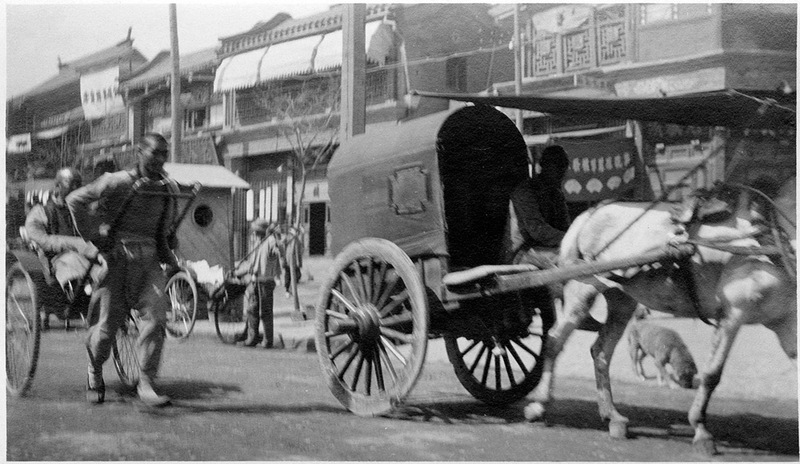 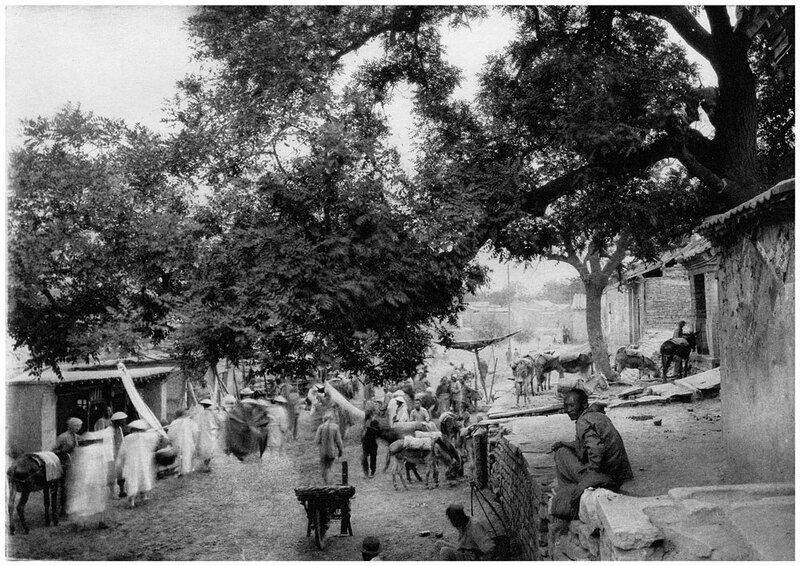 A camel caravan at right is carrying sacks of goods sent from merchants inside the city. 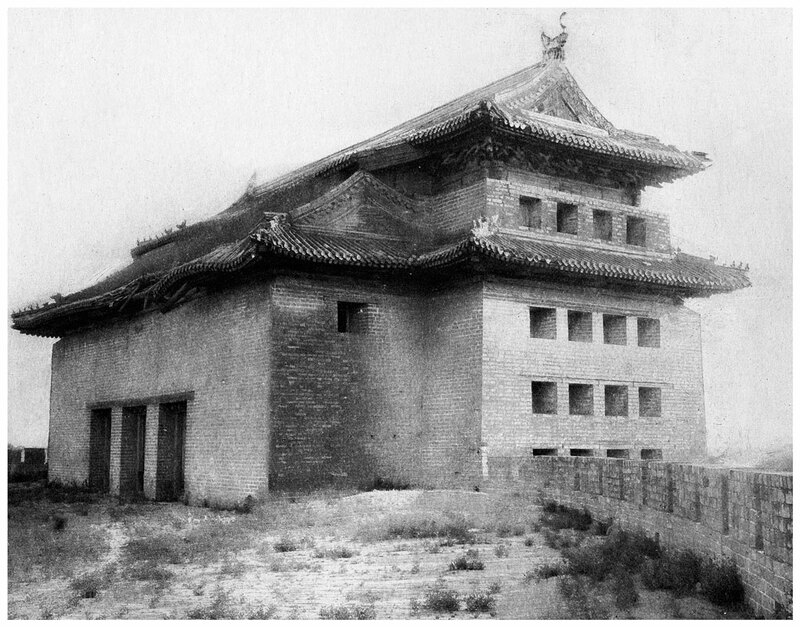 Side view of the inner tower and adjoining buildings. 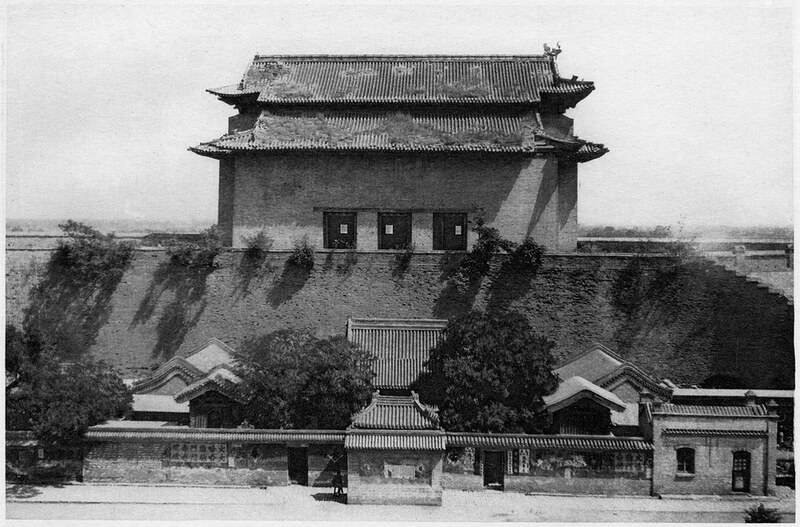 Front view from the city of the inner tower. 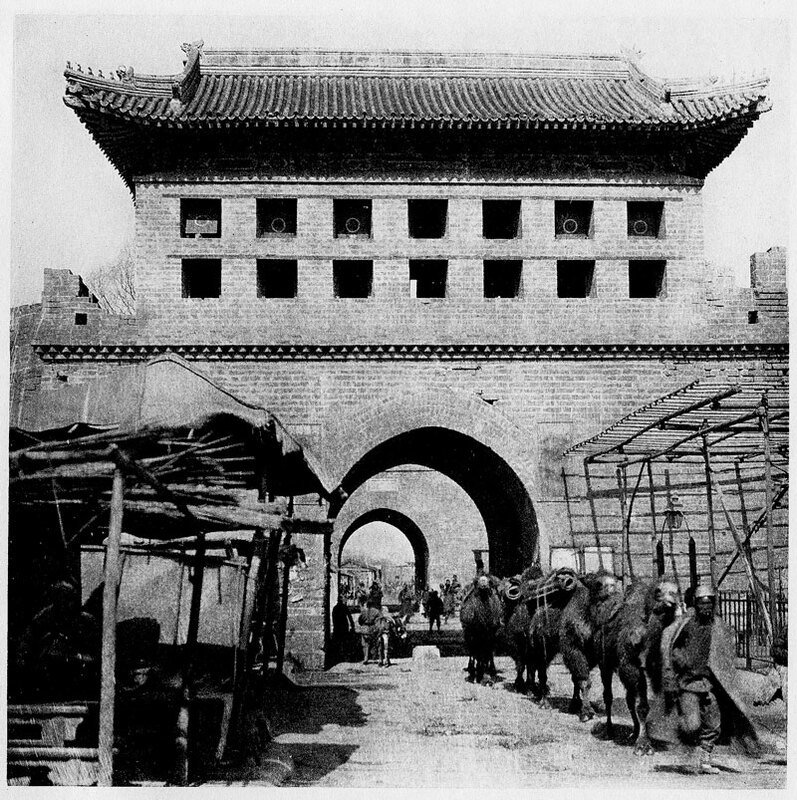 The outer gate may be glimpsed in the distance, through the opening. 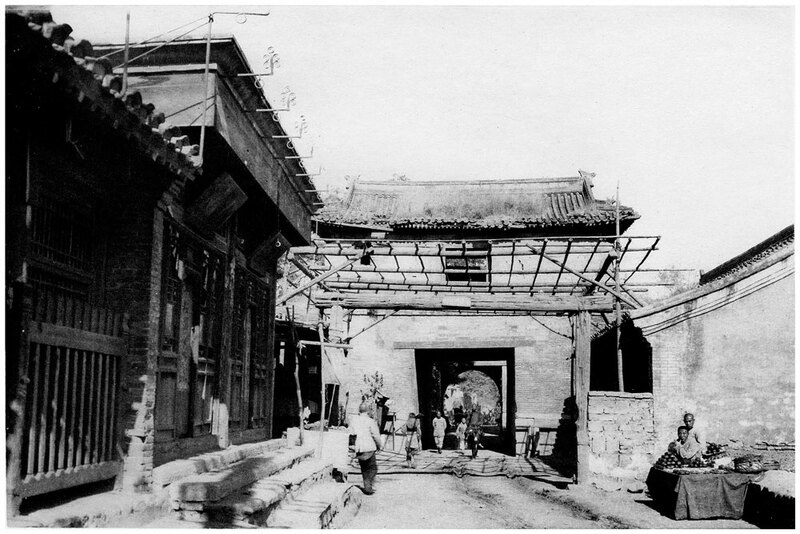 The gateyard and the inner gate. 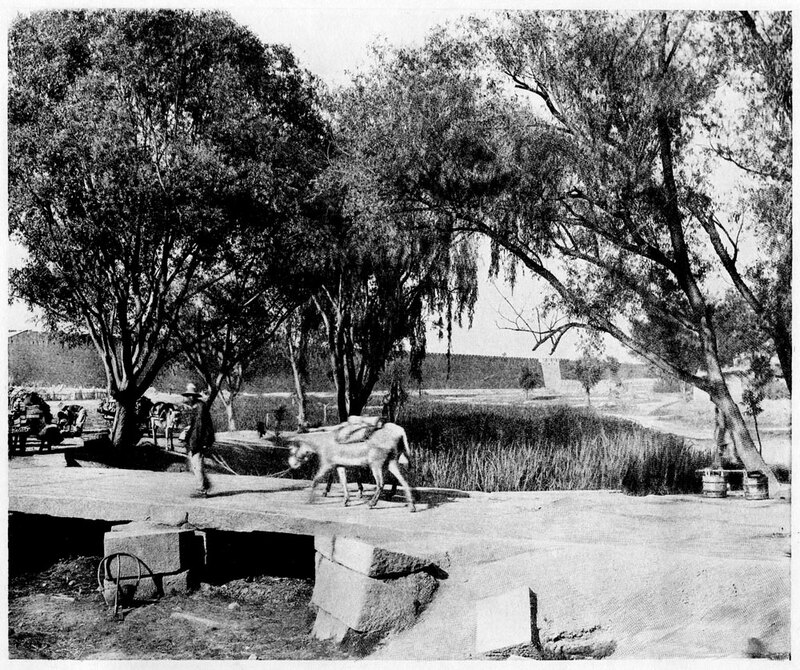 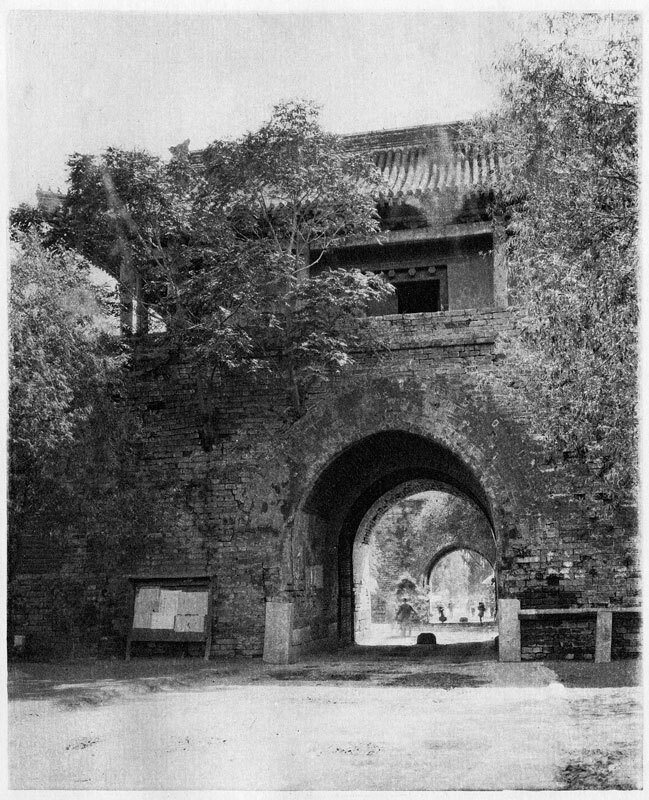 The gate ramp in ruins, as it was in September, 1922. 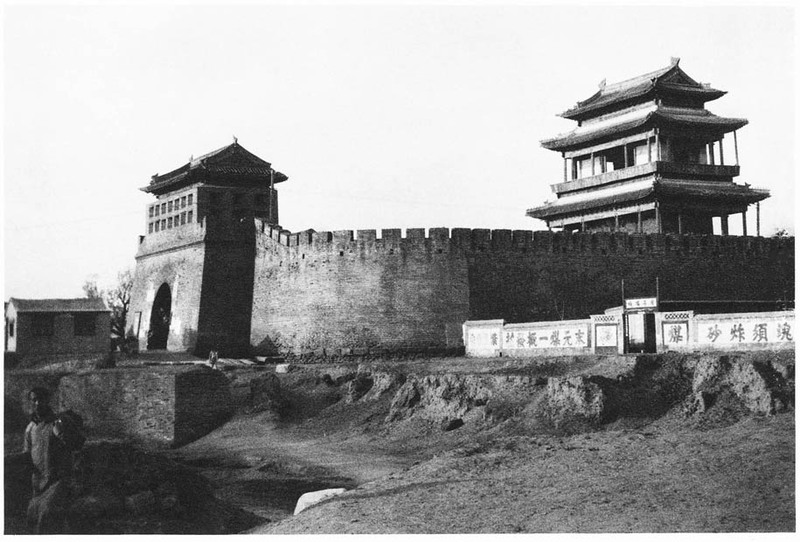 The outer tower and the moat. 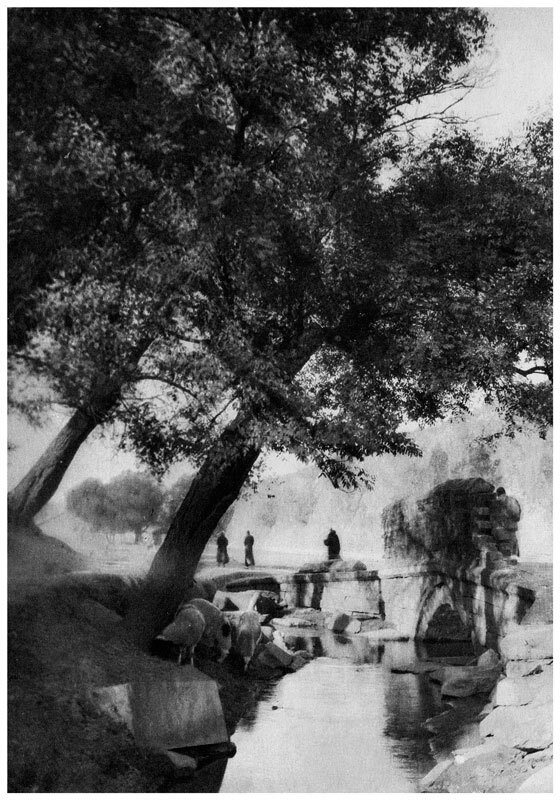 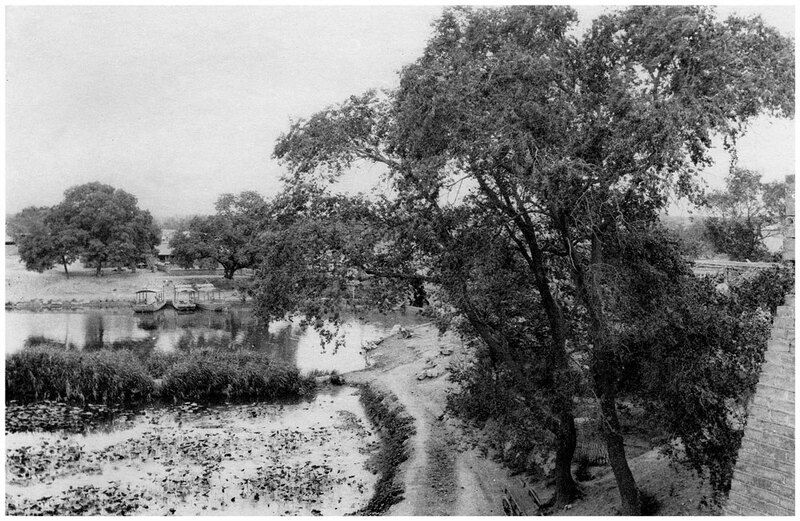 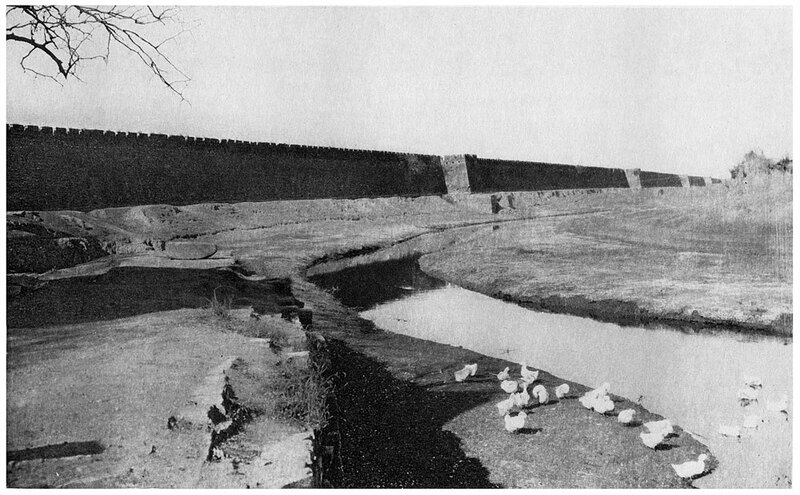 Outside the Chinese city at the southwest corner, with the moat and grazing sheep in the foreground. 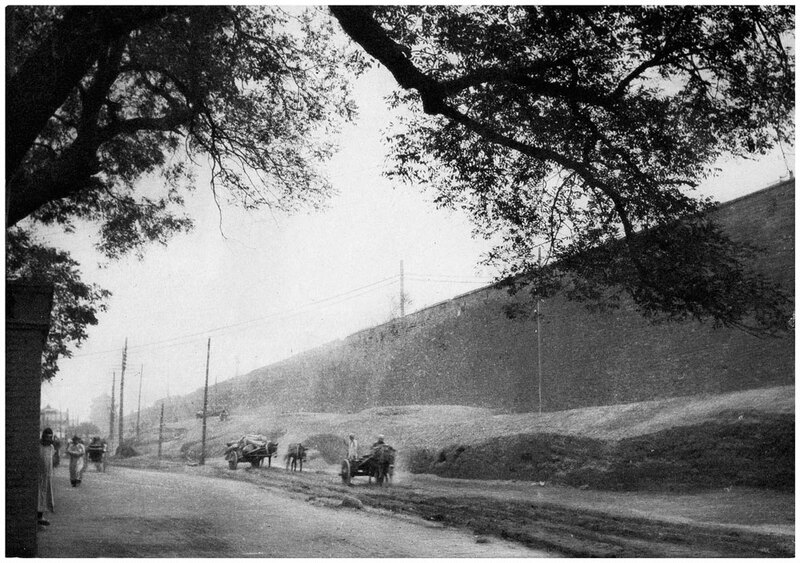 Sheep grazing at the foot of the north wall, as seen from outside the city. 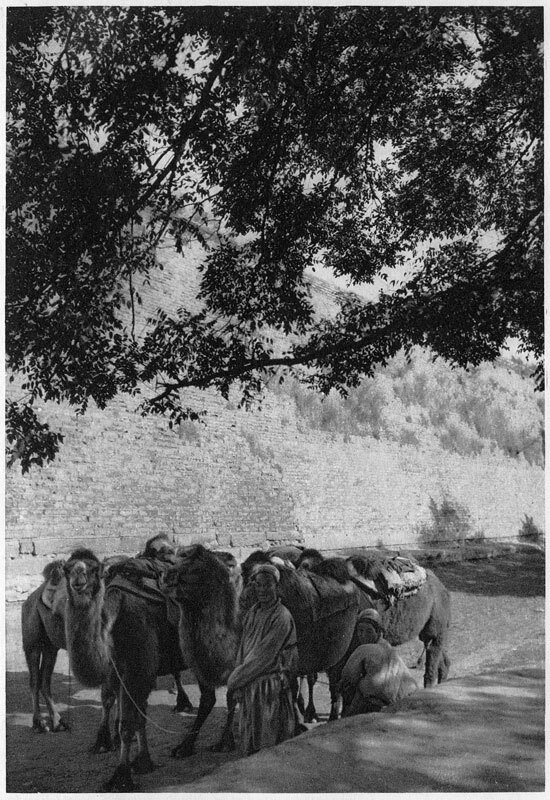 Camels resting in the shade outside the north wall. 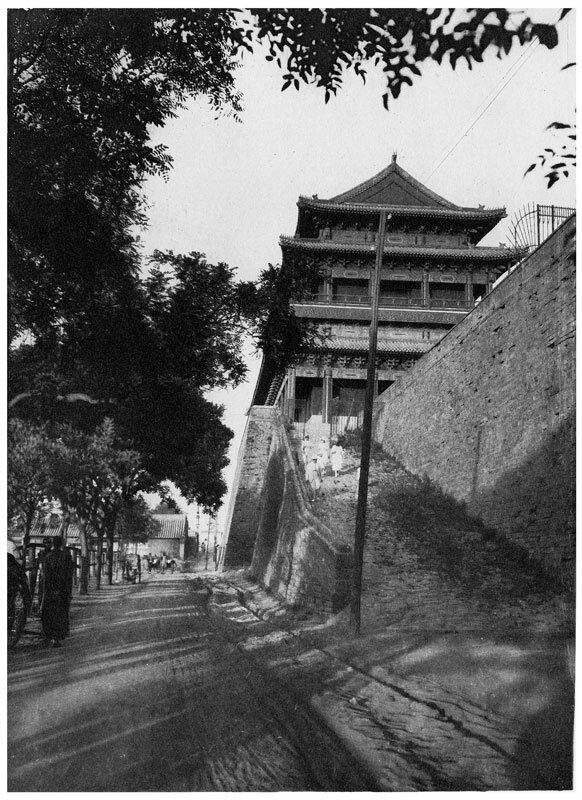 Looking east along the north wall which extended between Desheng Men and the Northwest corner, as seen from outside the city. 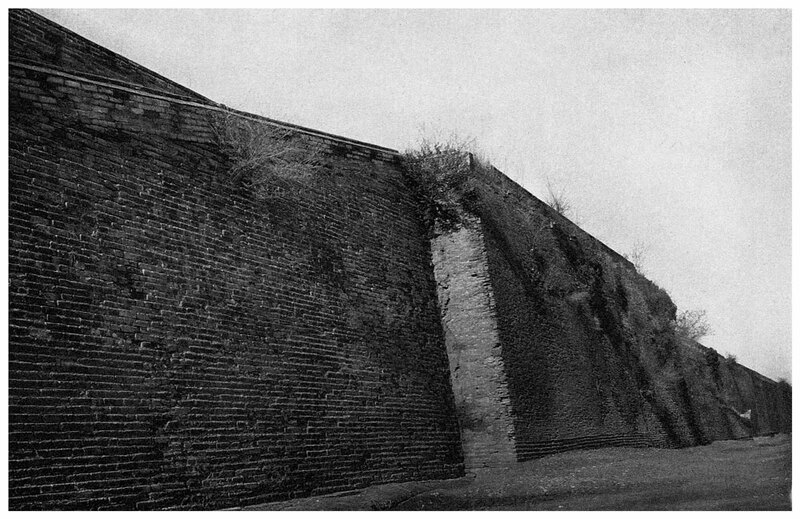 Inner side of the north wall, showing old sections (with the plants growing out of them) and restored sections. 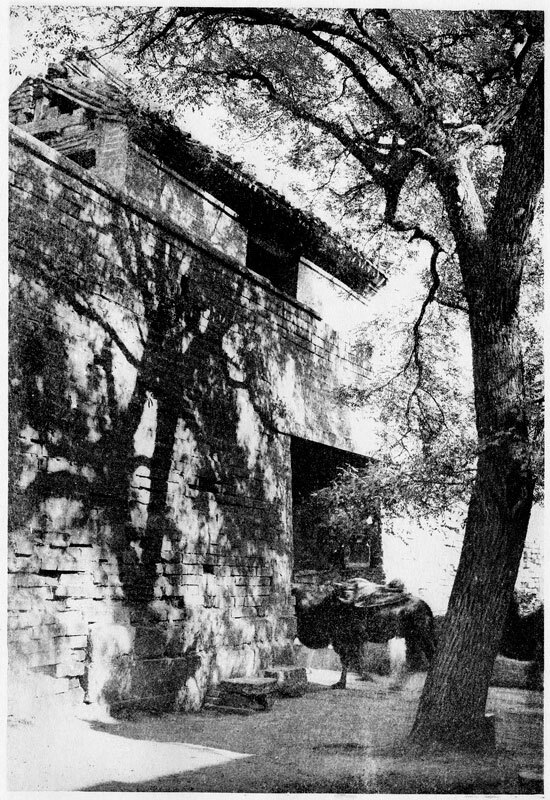 The stream named Zhishuidan at the north wall, with a small bridge crossing it beside the wall. 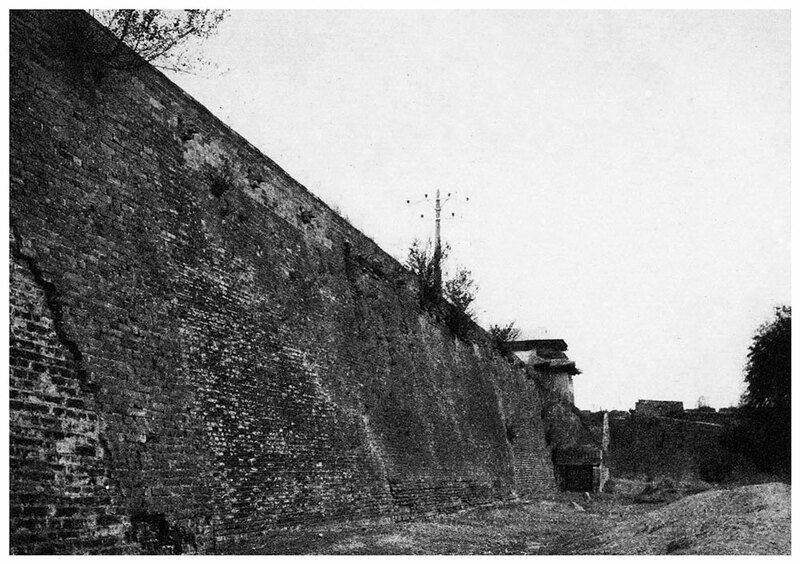 The south wall between Shunzhi Men and Tian Men, seen from inside the city. 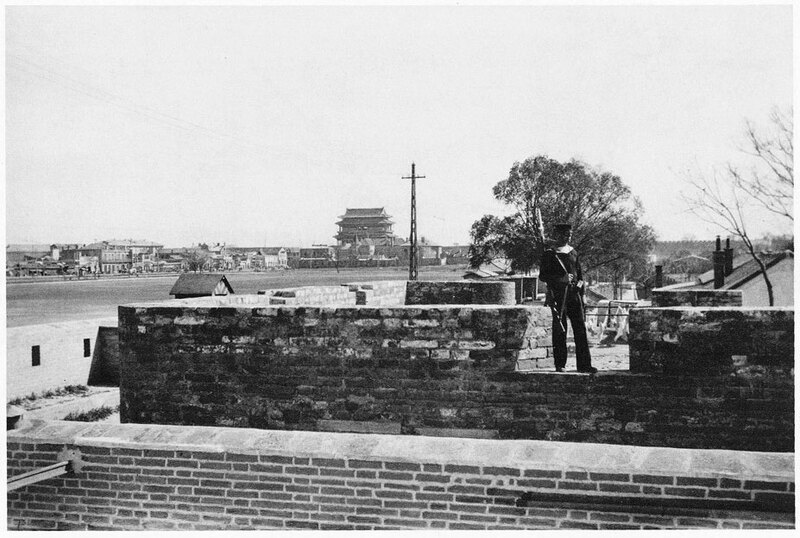 The tower of Tian Men may be seen very faintly in the far distance. 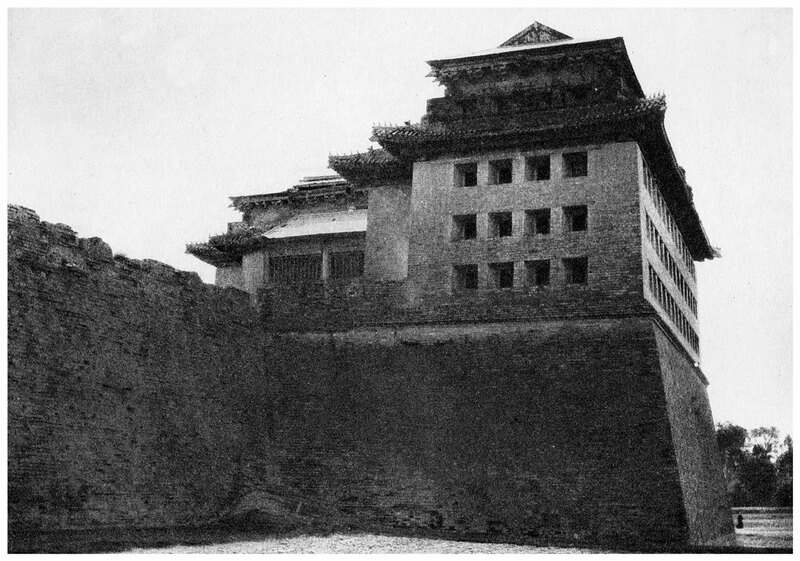 The south wall of the Chinese city, as seen from outside the city, at a point between Shunzhi Men and Tian Men. 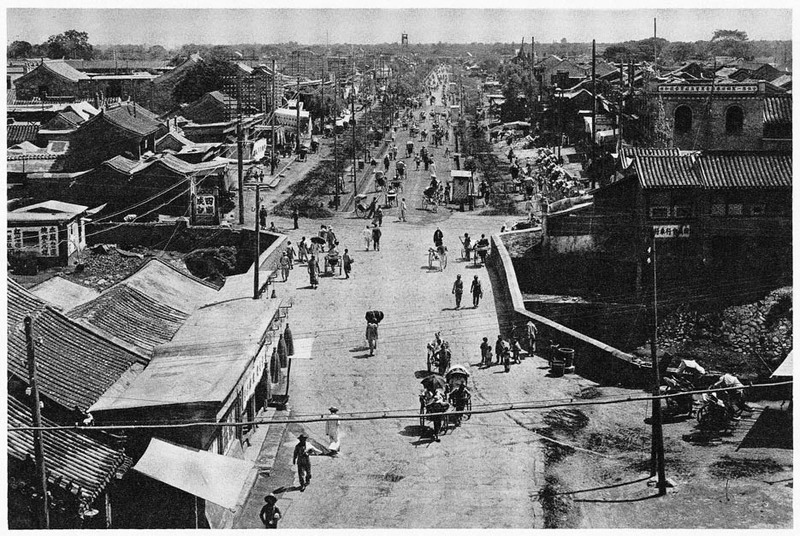 The railway tracks leading westwards from the railway station near Hata Men (which is out of sight in the far distance) thread through the centre of the photo. 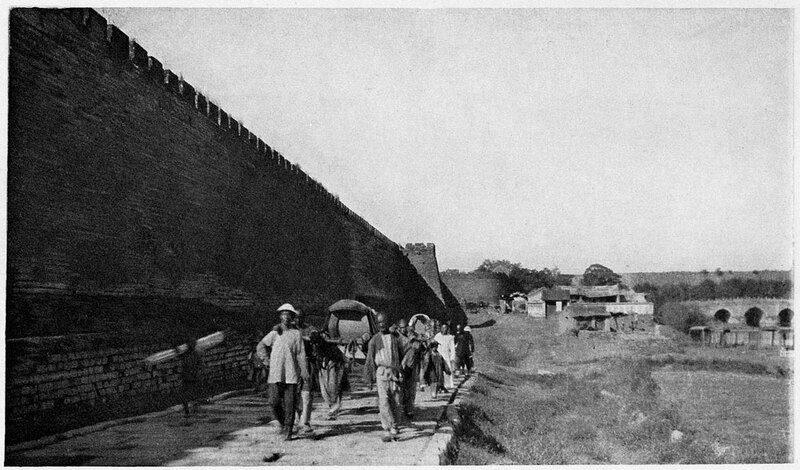 The inner south wall of the Chinese city. 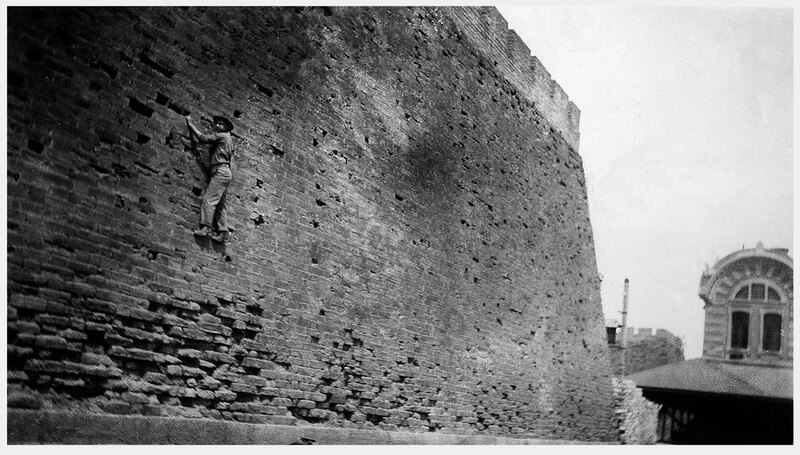 This photo shows an American Marine climbing the exterior of the southern wall of Beijing circa 1913. 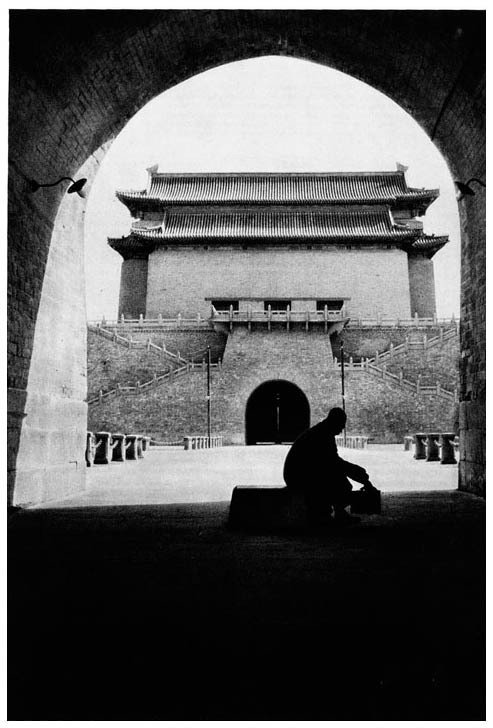 The original photo was taken by and preserved in the personal album of an unknown American soldier, who was a friend of the Marine. 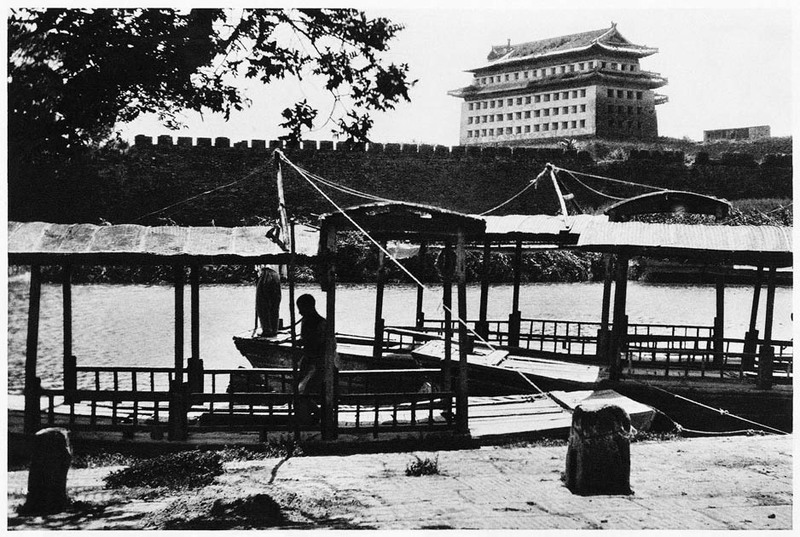 It is unknown whether the Marine made it to the top. 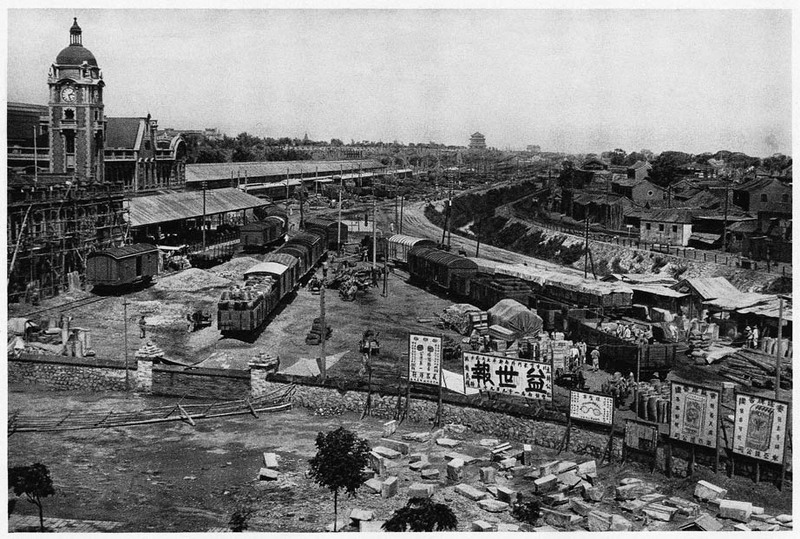 At right is part of the main railway station, and beyond it a telegraph pole used by the railway. 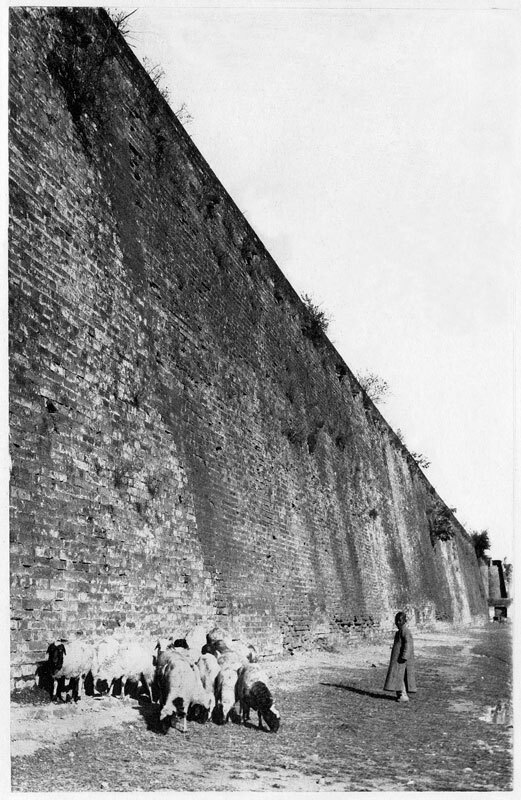 This photo is thus of a portion of the southern wall very near to Hata Men, and just beside the railway station. 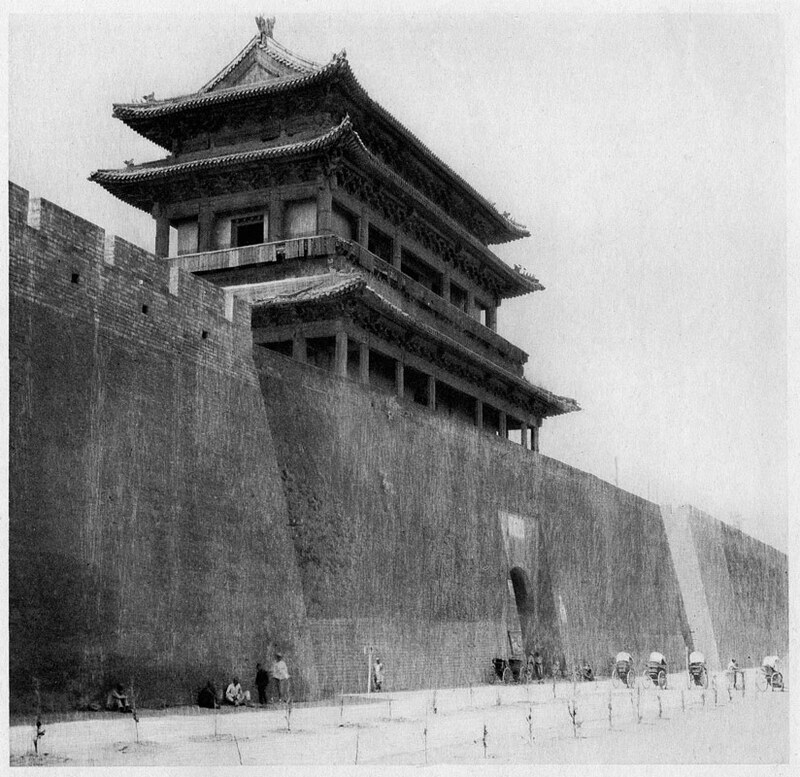 The long ramp leading onto the east wall between Chihua Men and Dongzhi Men. 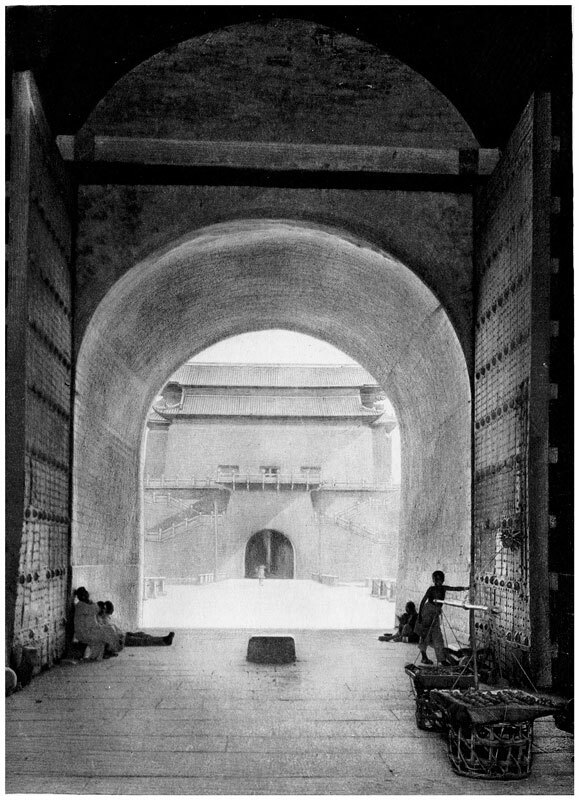 The ramp has been blocked at the bottom to prevent access by the public. 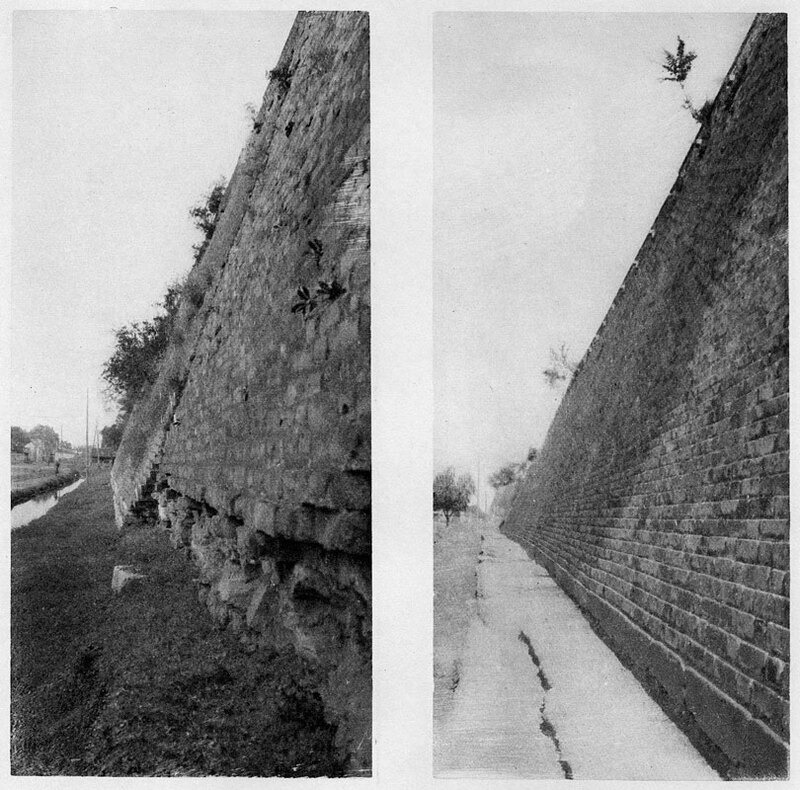 Two views of the east wall, the one at right showing a well-preserved section of the wall, and the one at left by contrast showing a section with missing bricks at the base, which expose internal layers of the structure. 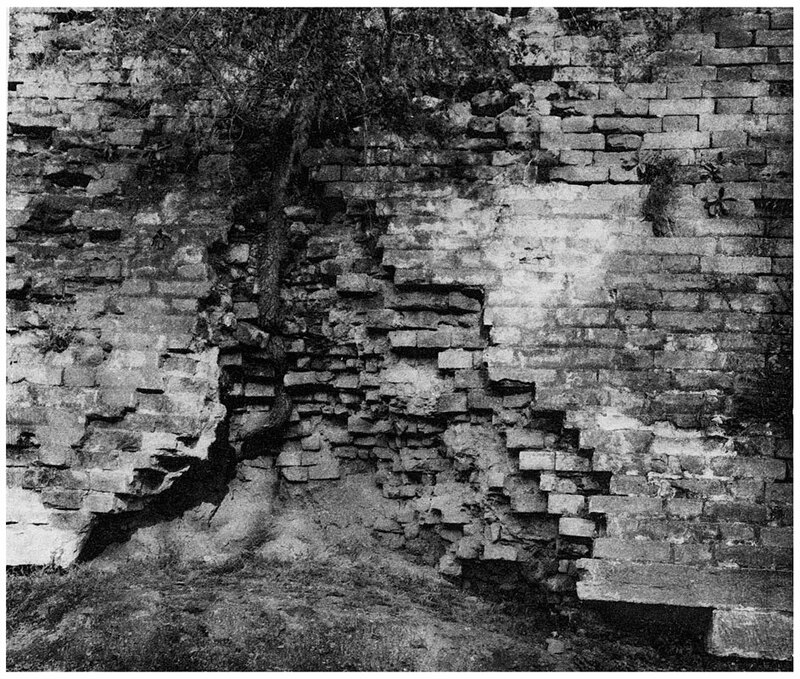 A deep hole in the east wall exposing several layer of brick facings beneath. 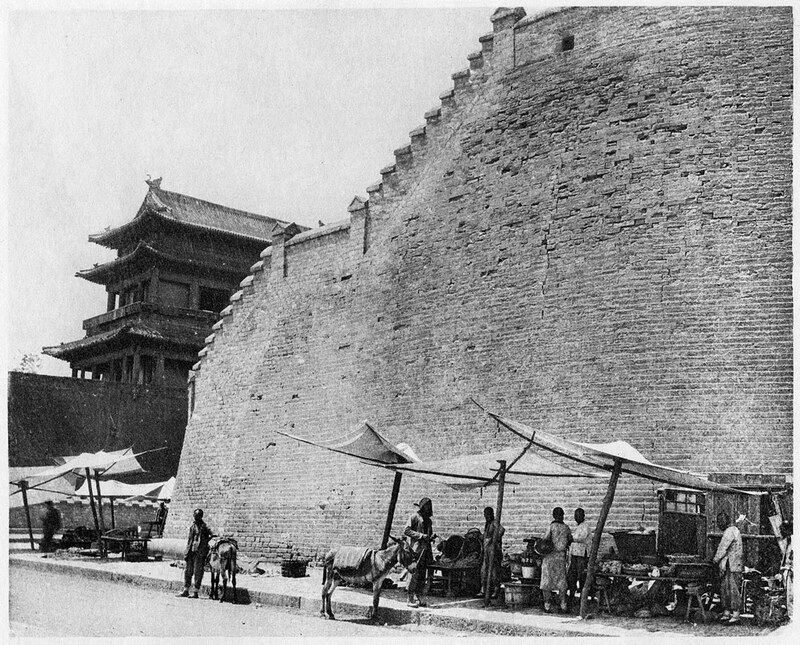 The inner east side of the Chinese city wall. 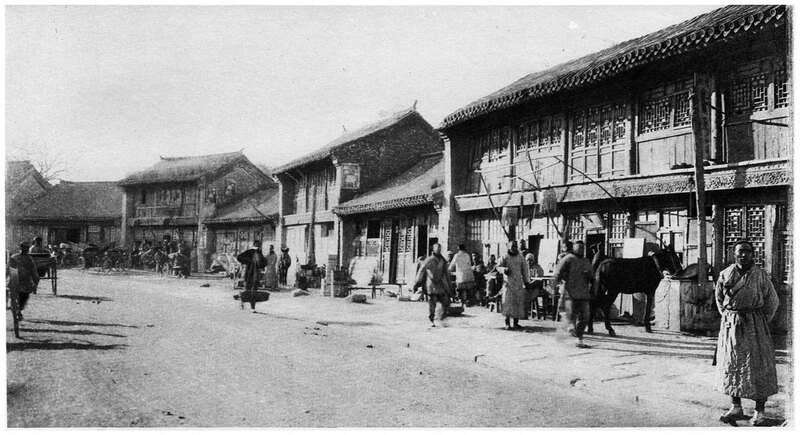 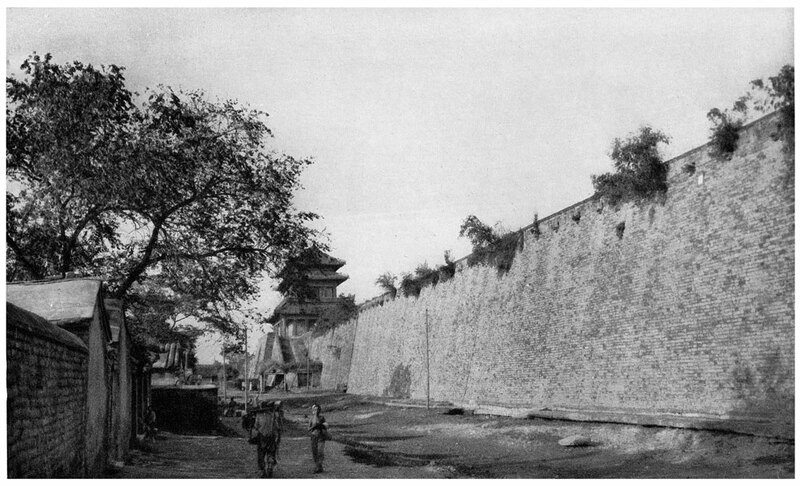 The inner eastern wall of the Chinese city, showing badly patched and decayed patches as they were in 1920. 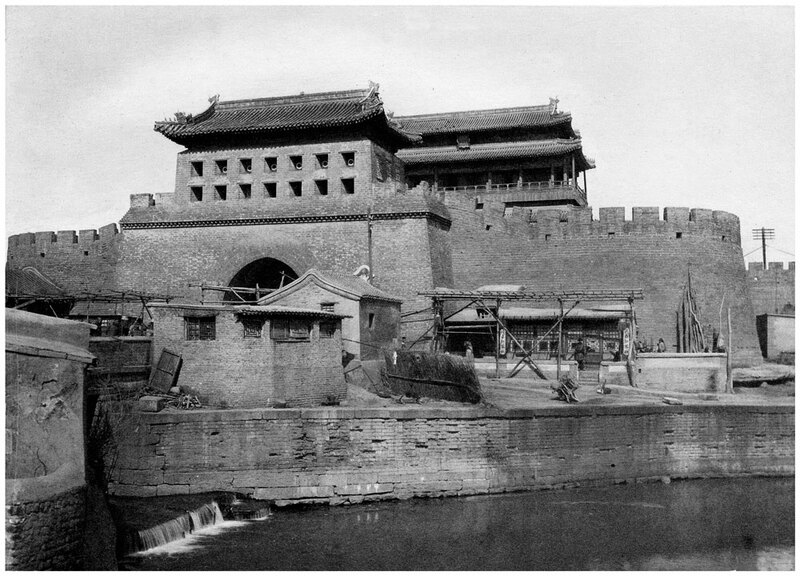 View from outside the city of the eastern wall of the Chinese city, with the moat. 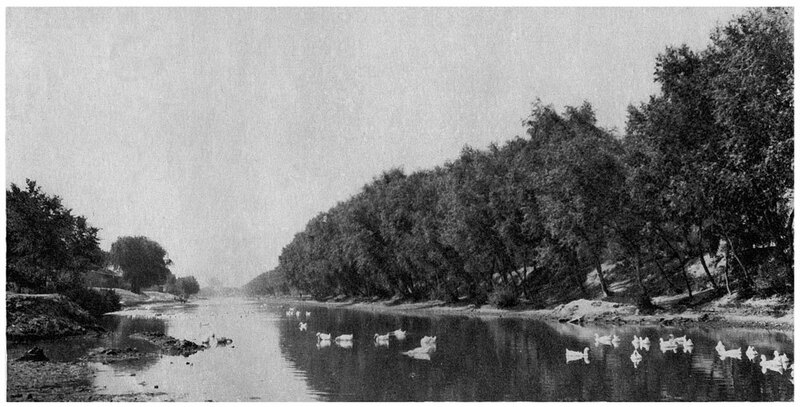 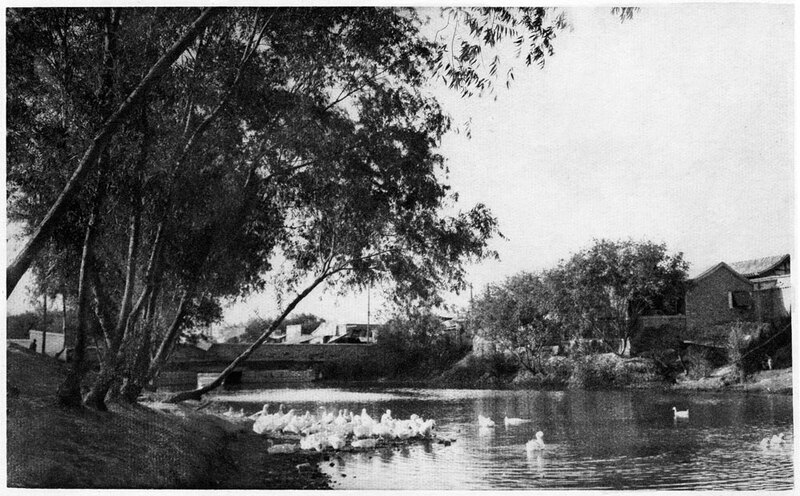 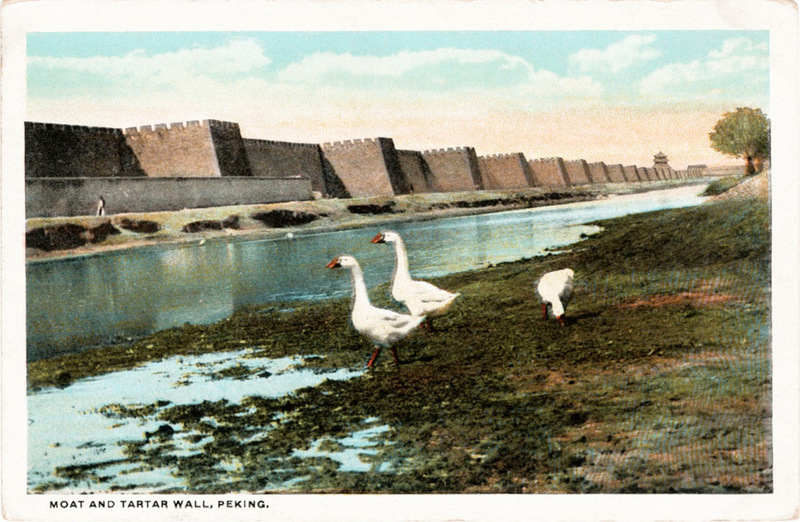 The West Wall seen across the outer moat, with geese in the foreground. 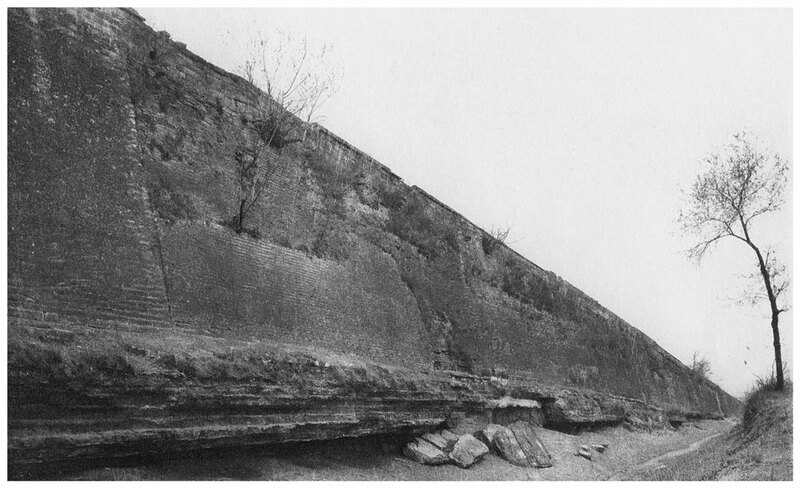 Inner side of the west wall near Xizhi Men. 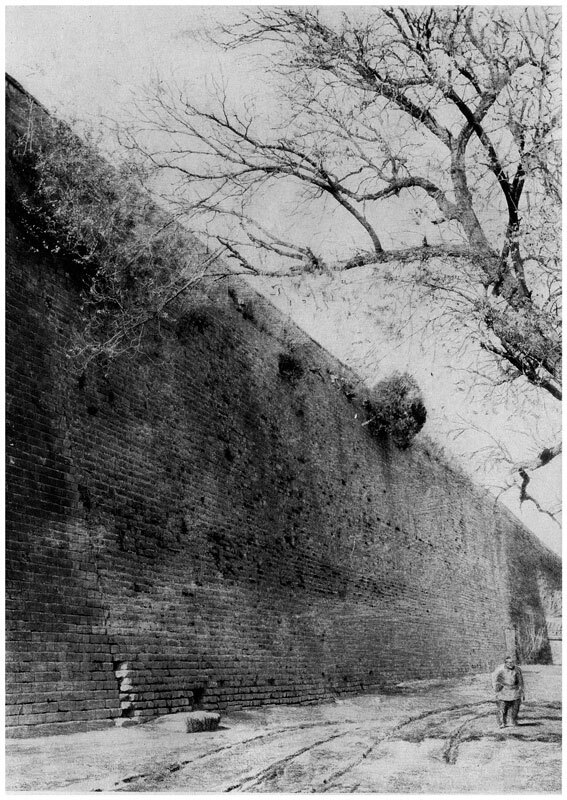 Southern portion of the west wall, seen from outside the city. 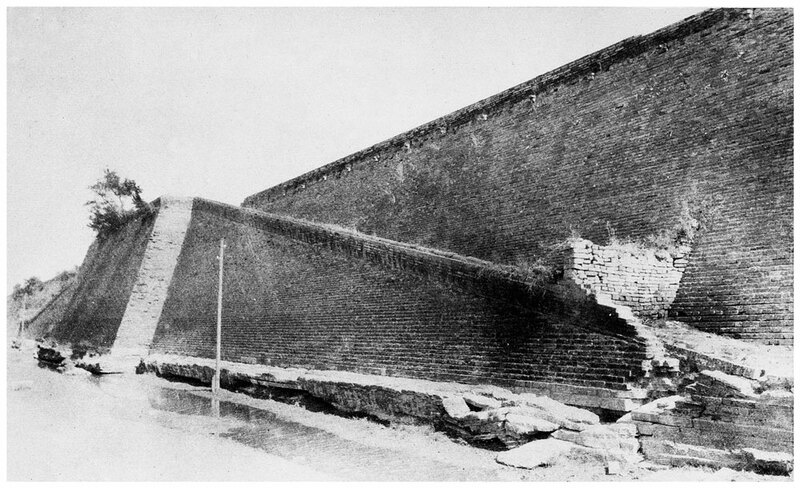 A portion of the outer west wall showing where a large amount of the brick facing had fallen down (in 1920). 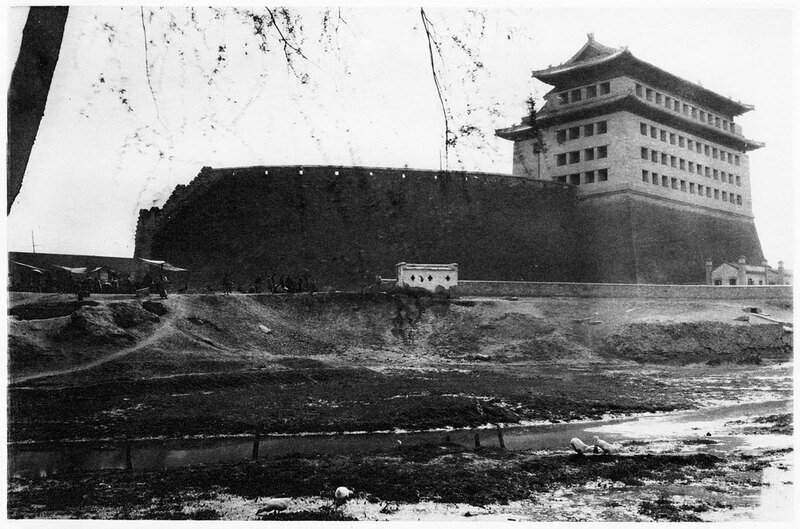 The north west corner of the Chinese city wall, with the moat at left. 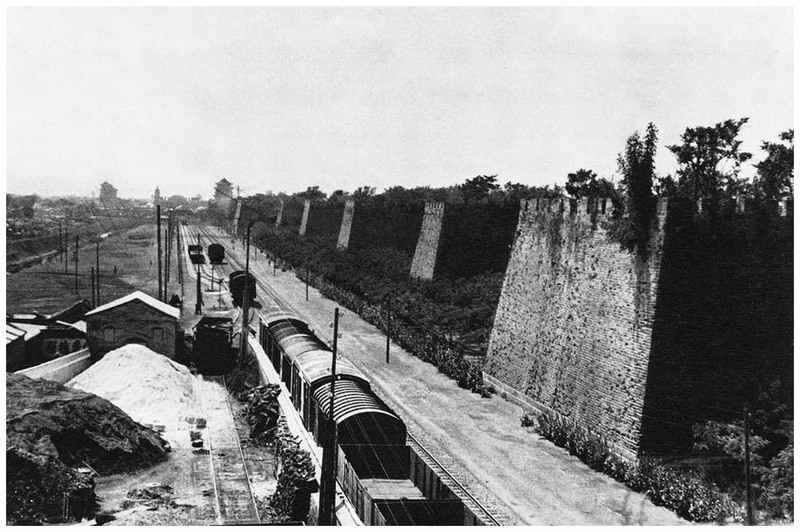 The wall running into the distance is the north wall. 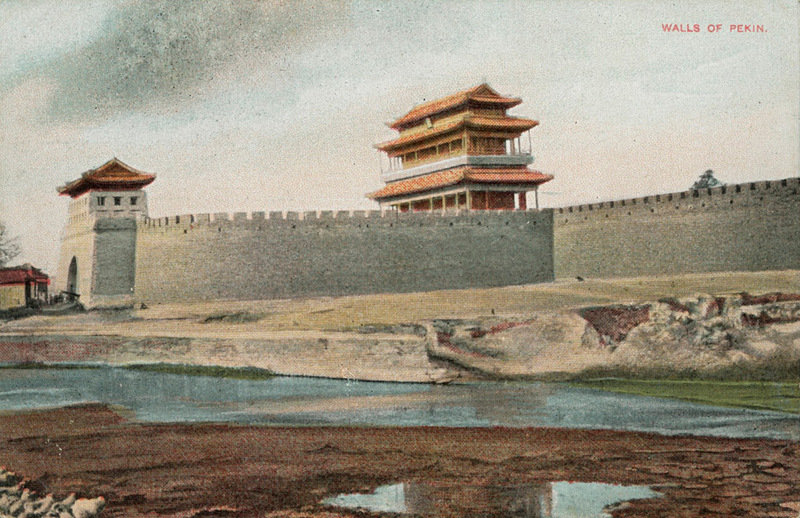 The northeast corner of the Chinese city wall, with the moat and bridge. 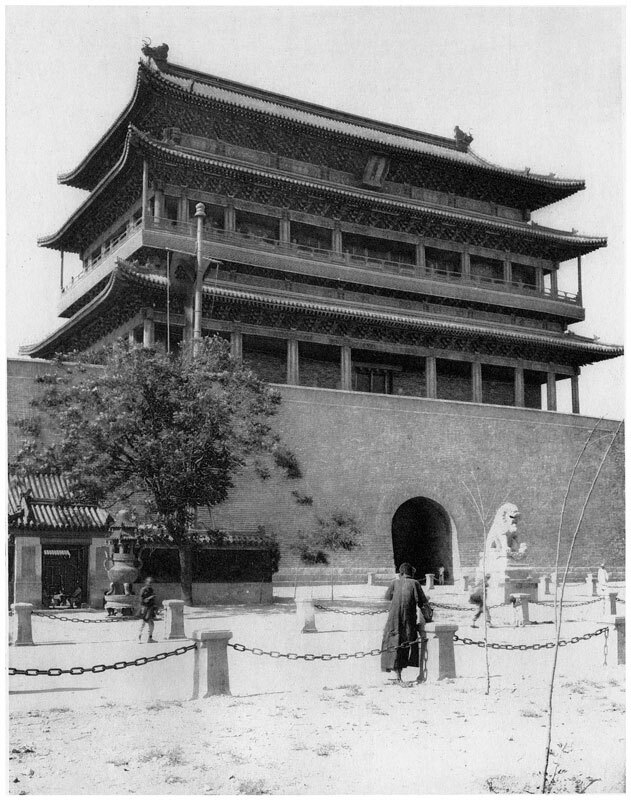 The tower on the southeast corner of the inner wall of Beijing. 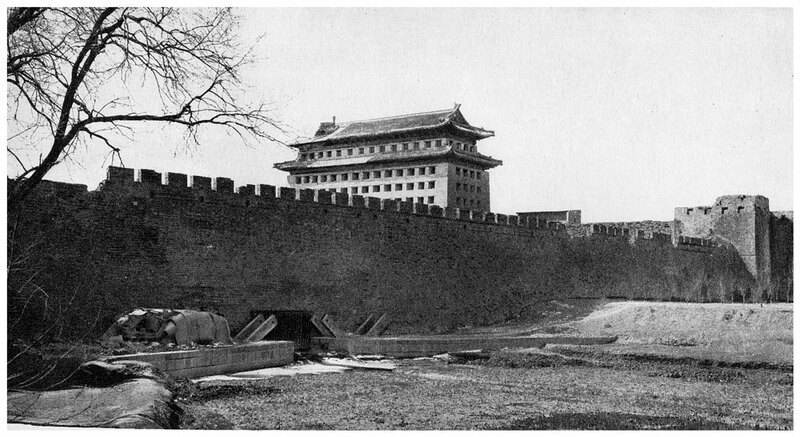 The southeast corner tower at the junction between the inner and the outer walls. 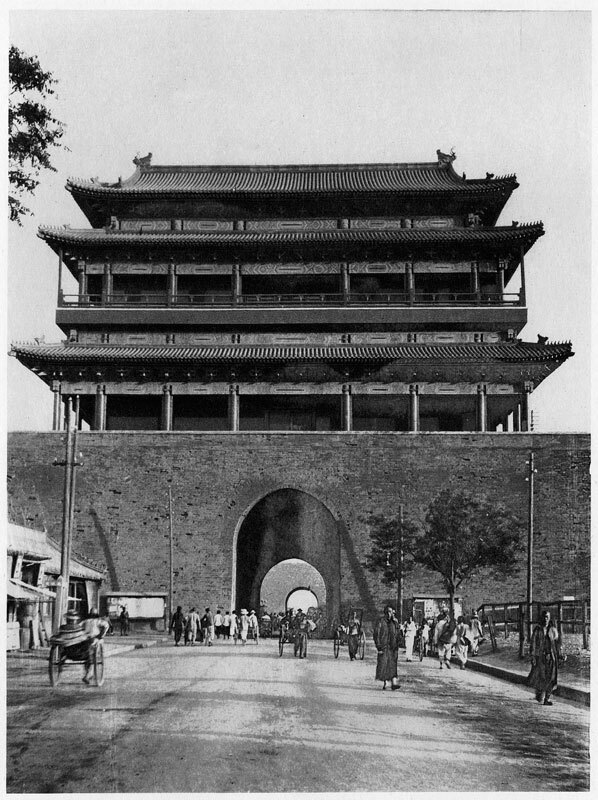 The southeast corner tower of the Chinese city. 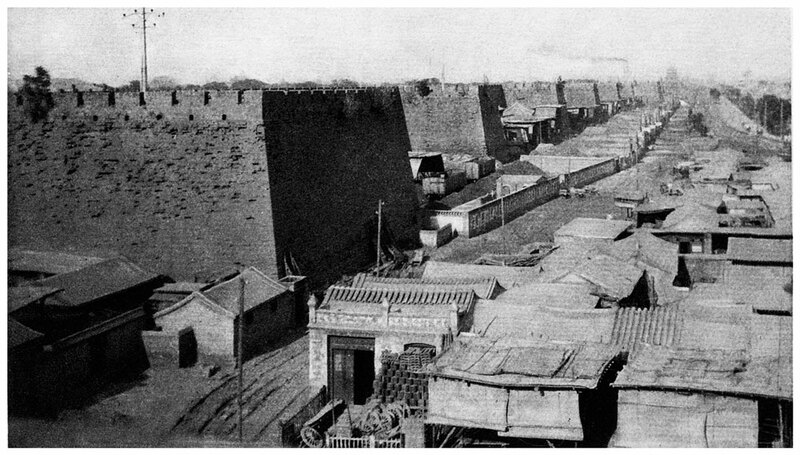 The south-east corner of Beijing photographed in 1901 by a medical officer of the Italian Navy, showing the damage done to the blockhouse and its bridge through bombardment by the Russians during the Boxer rebellion. 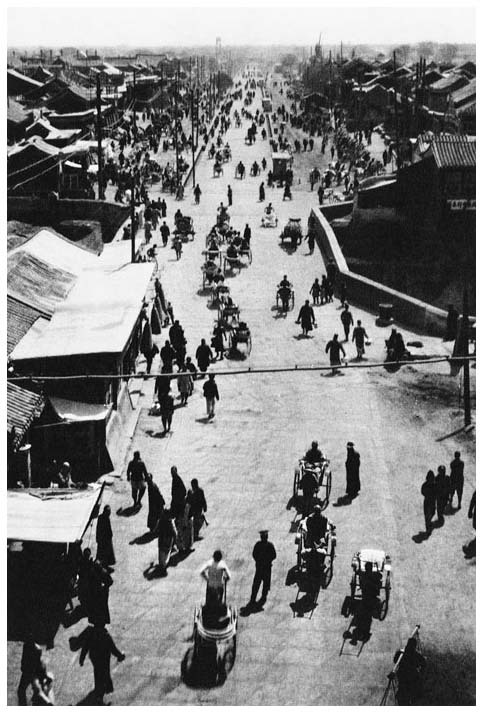 Rickshaws are parked at far right. 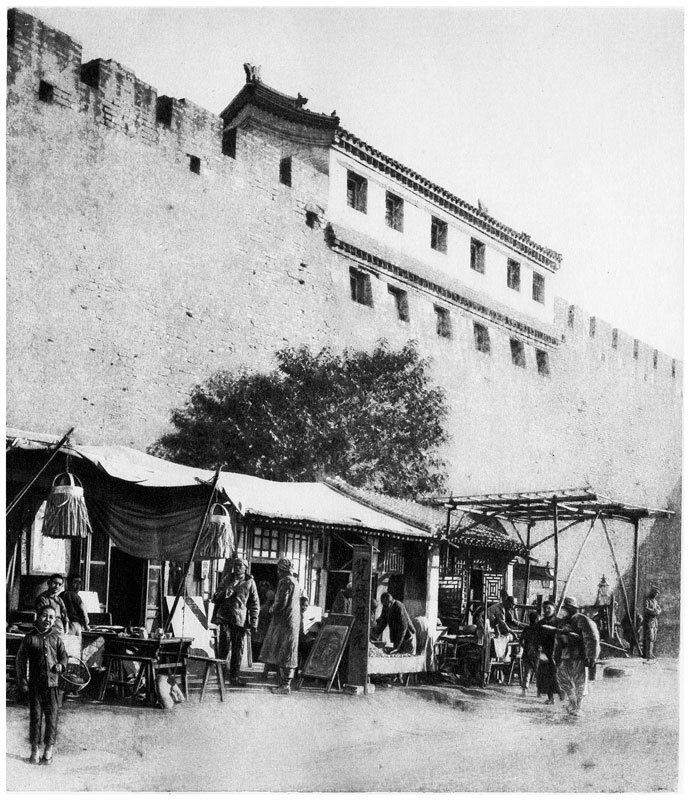 The south wall near the southwest corner of the Chinese city, as seen from outside the city. 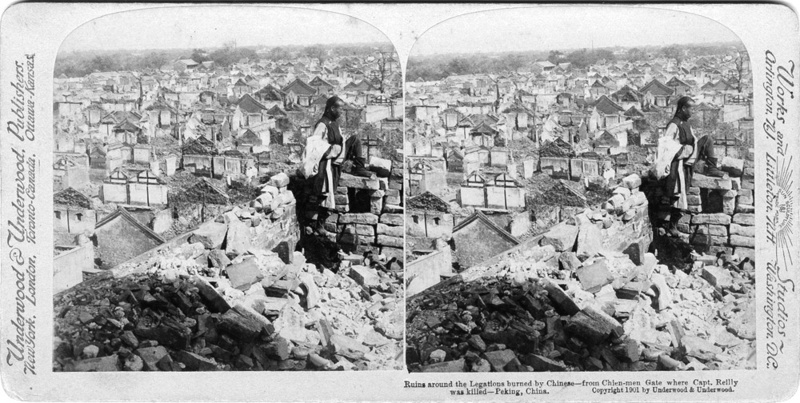 Repaired sections may be seen. 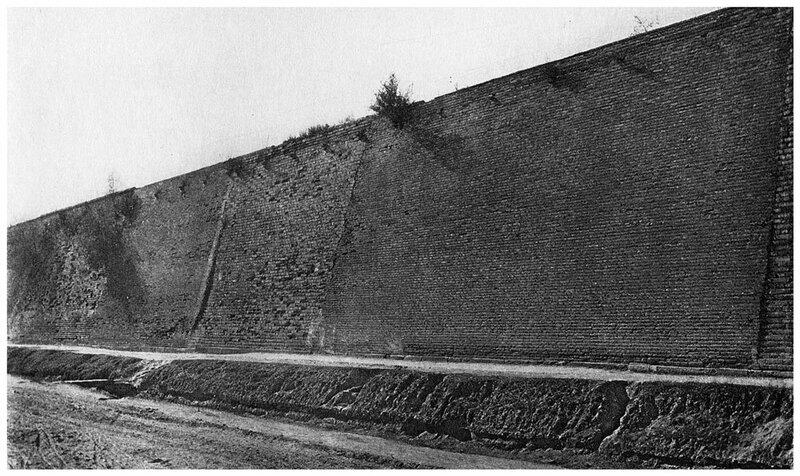 The southern end of the west wall. 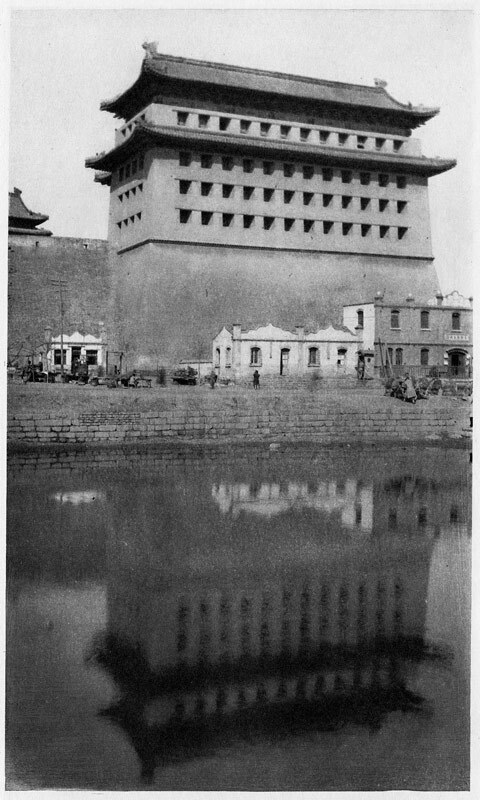 The tower at the southwest corner of the Chinese city wall, with the moat in the foreground.